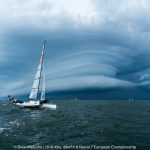 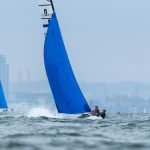 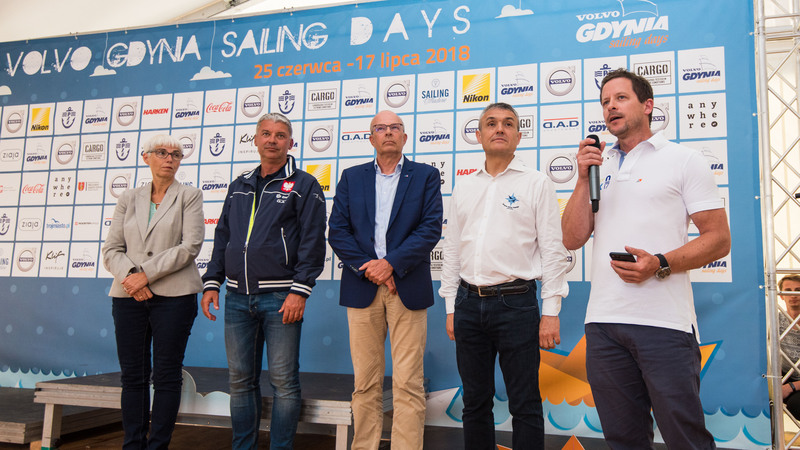 The long time Olympic official – known in yachting circles only as “CJ” – said the tough thing about the afternoon wasn’t necessarily the wind – there was generally 5 or 6 knots – as much as the sloppy sea state. 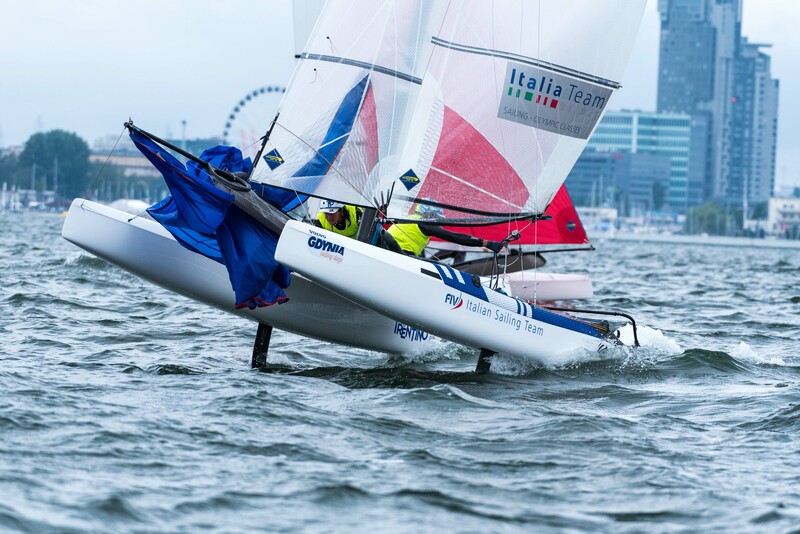 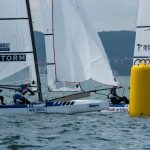 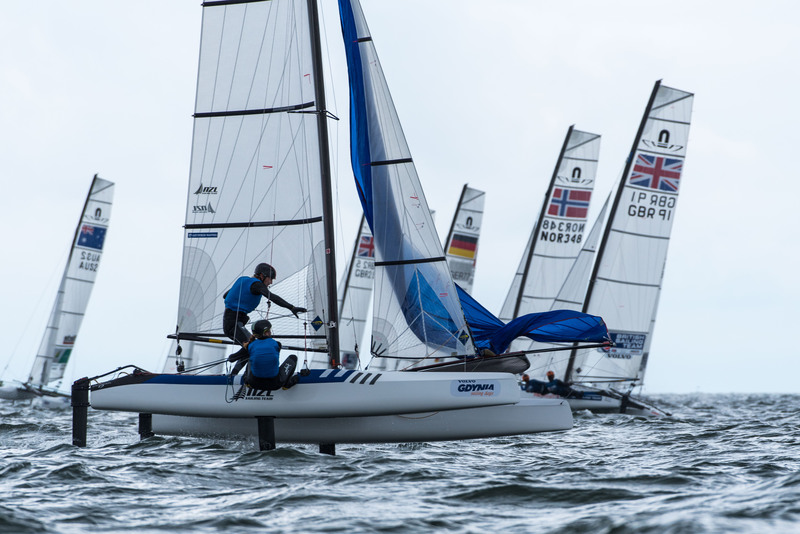 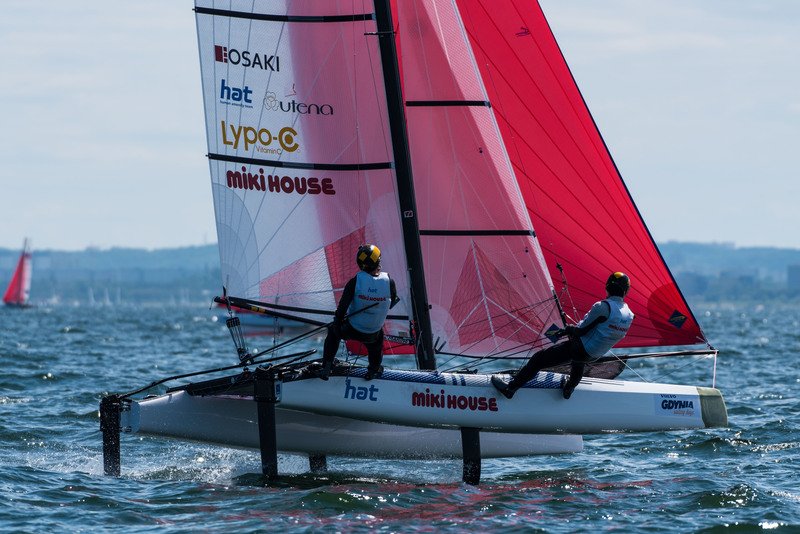 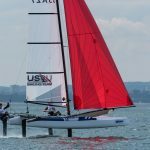 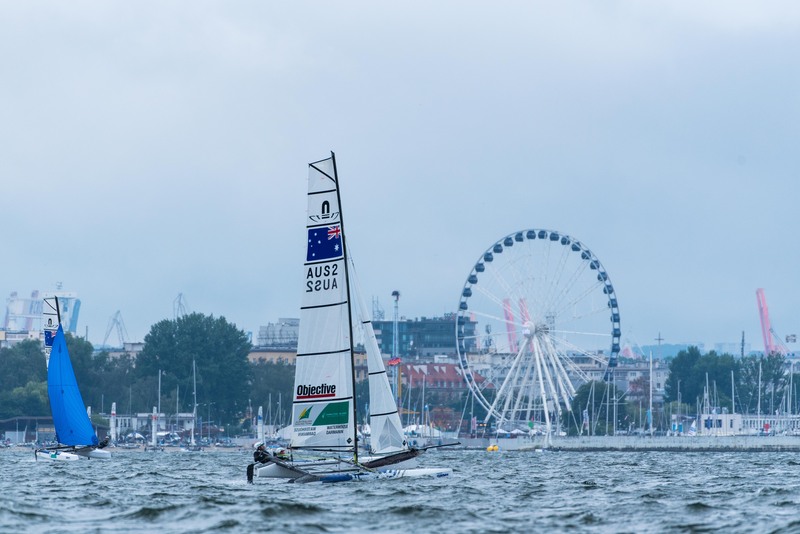 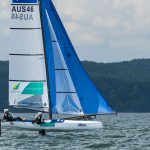 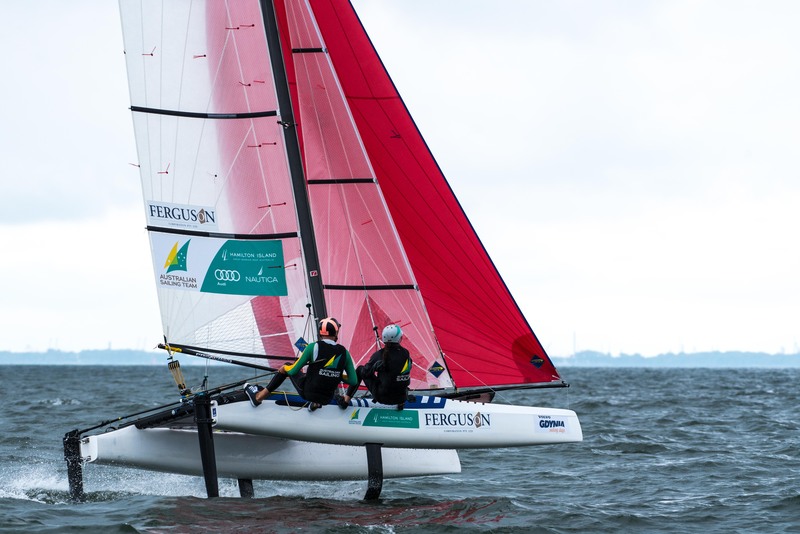 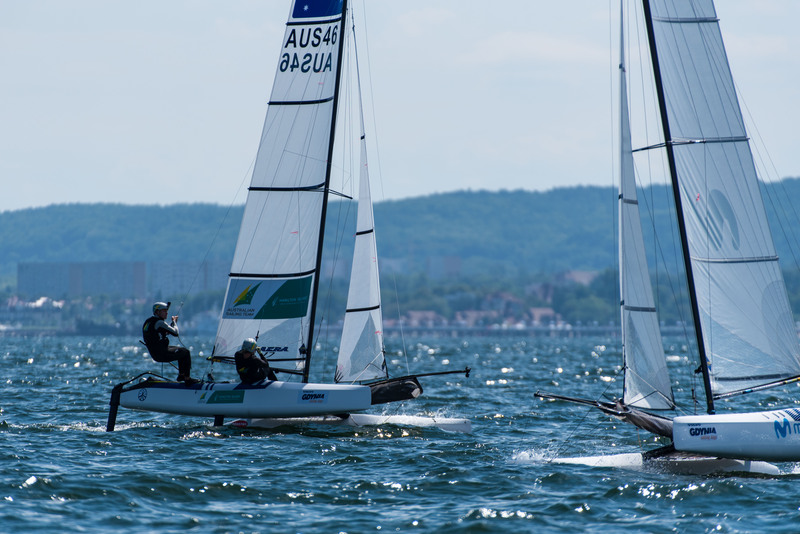 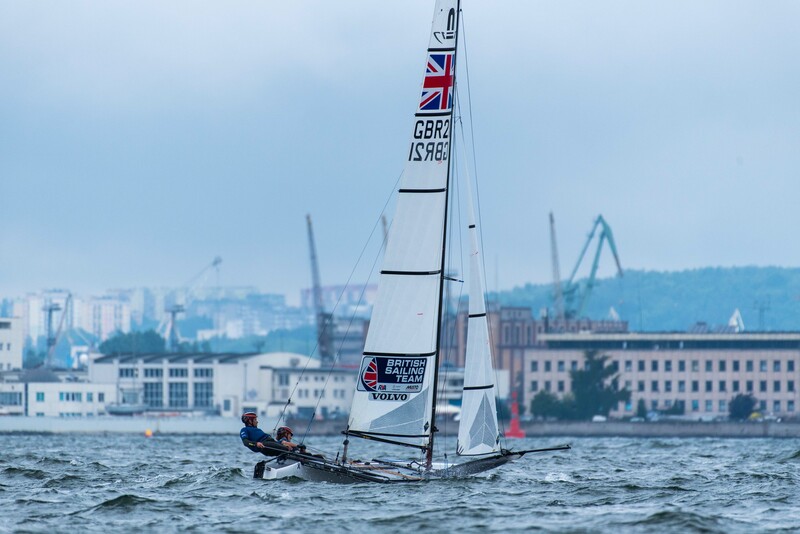 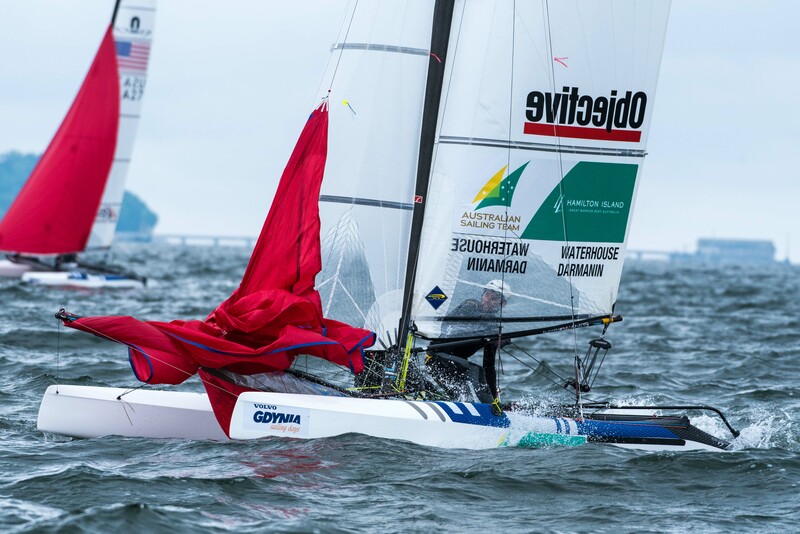 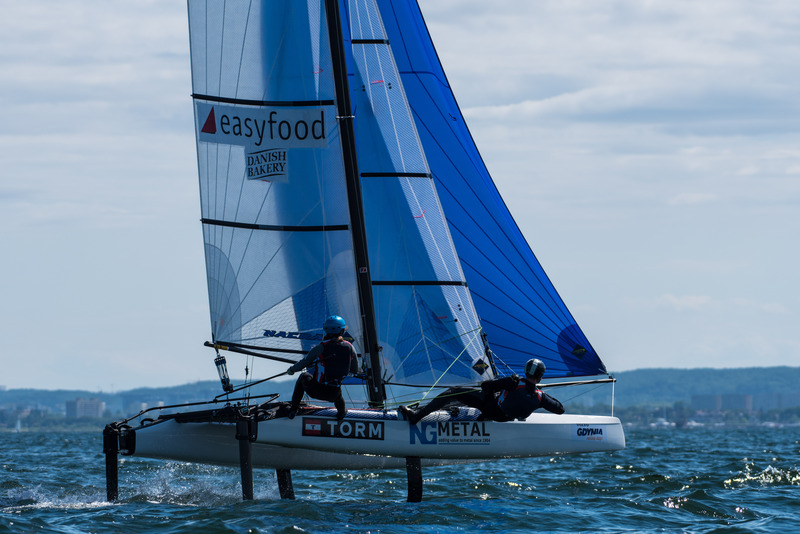 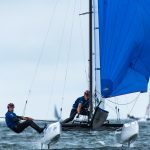 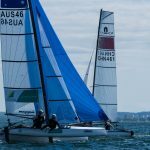 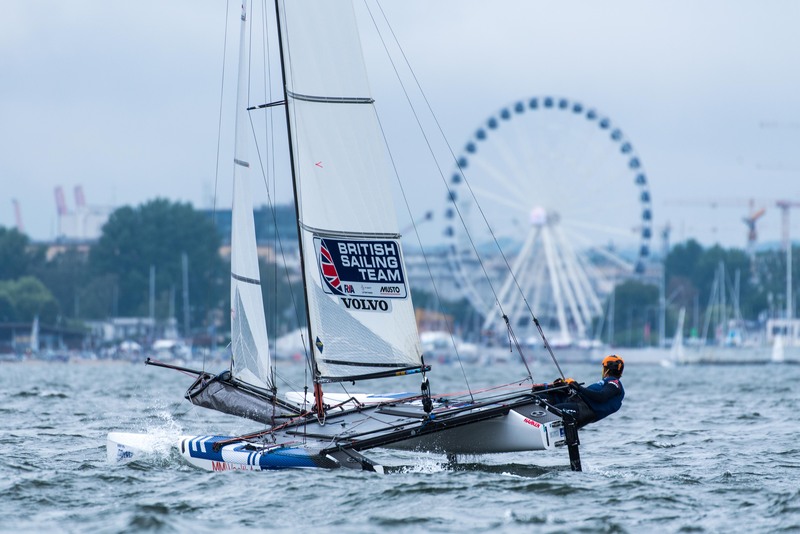 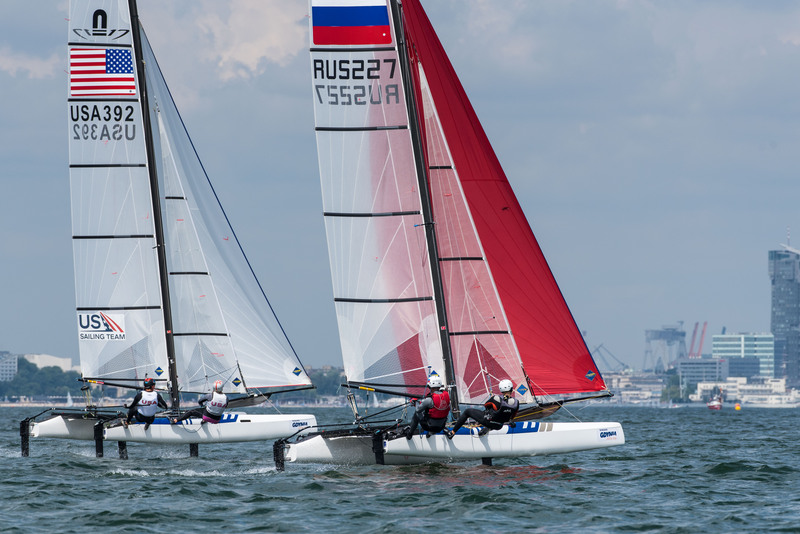 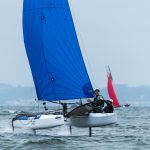 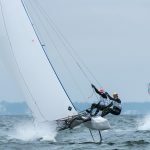 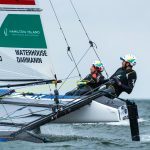 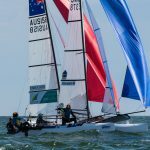 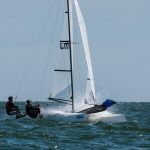 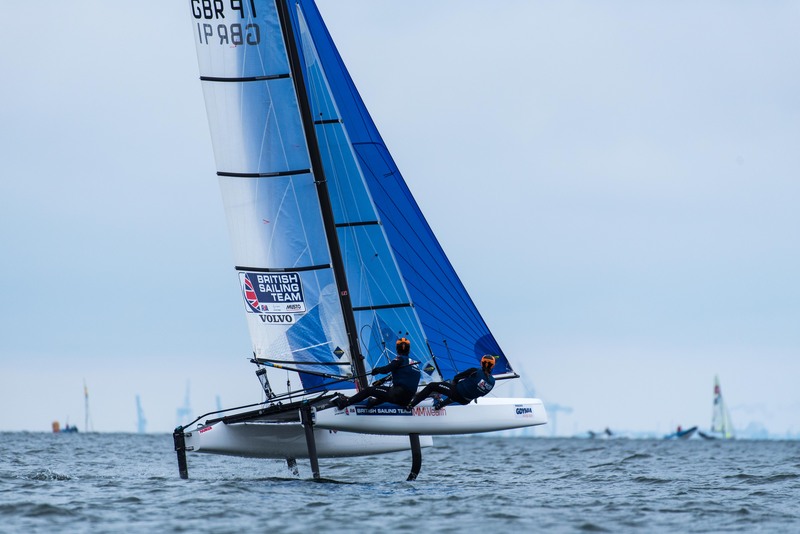 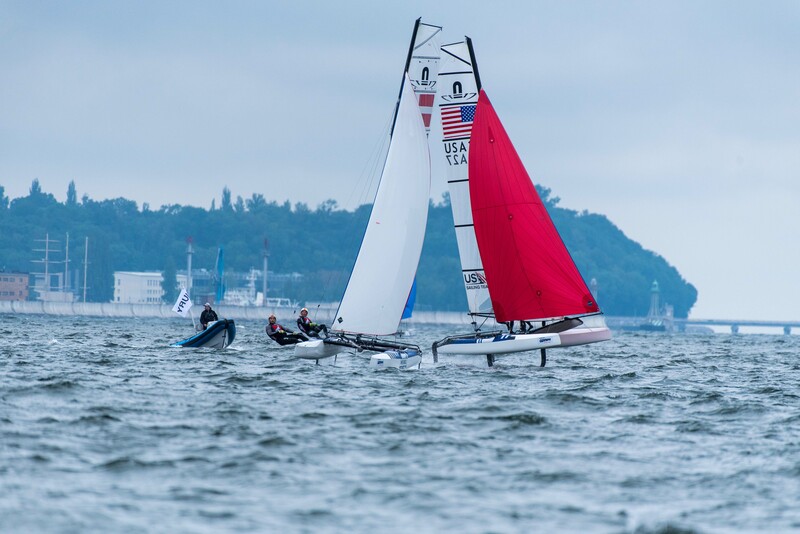 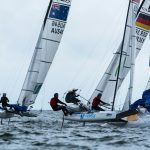 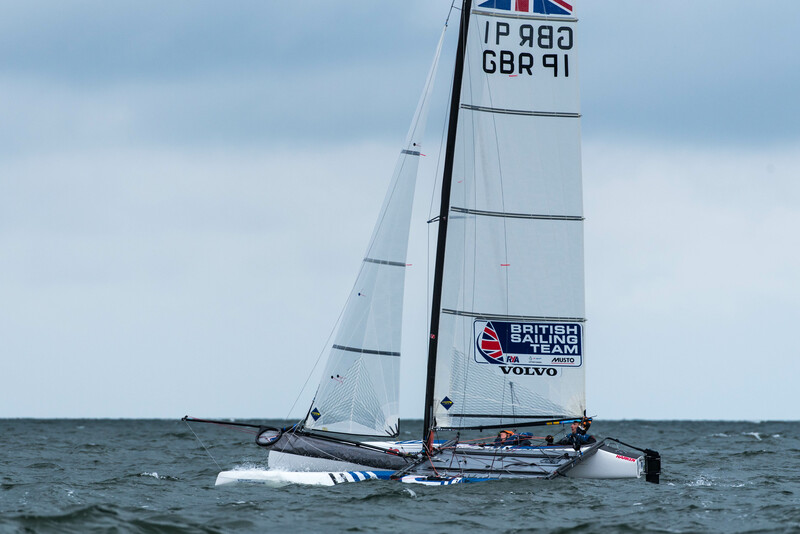 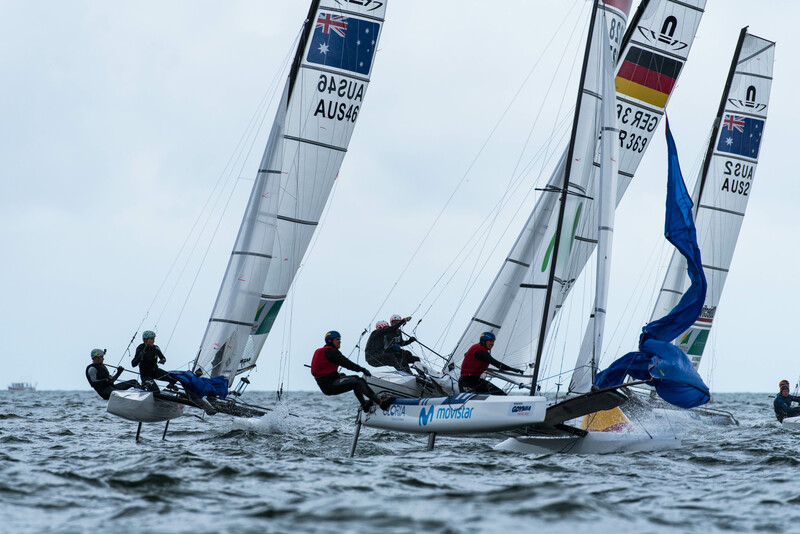 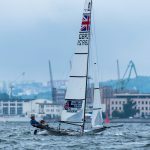 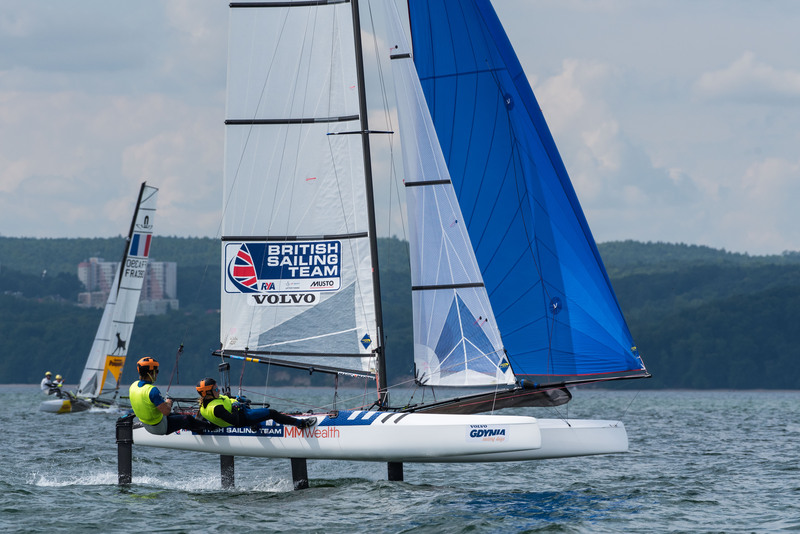 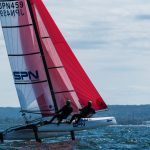 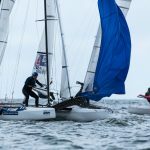 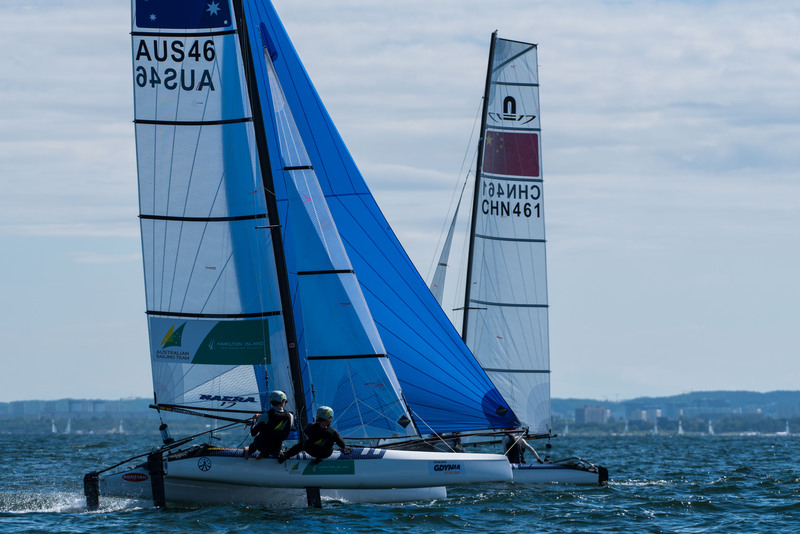 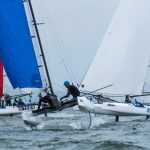 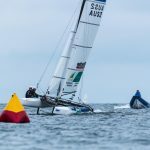 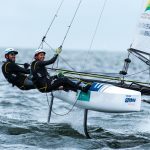 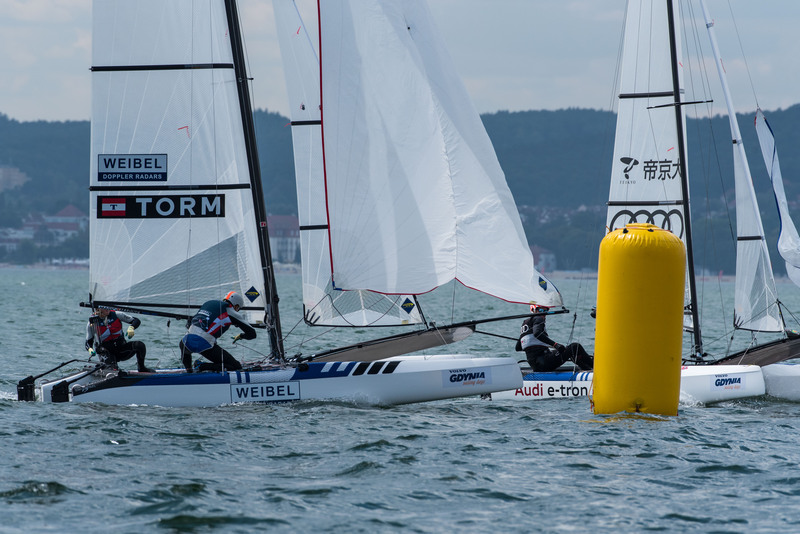 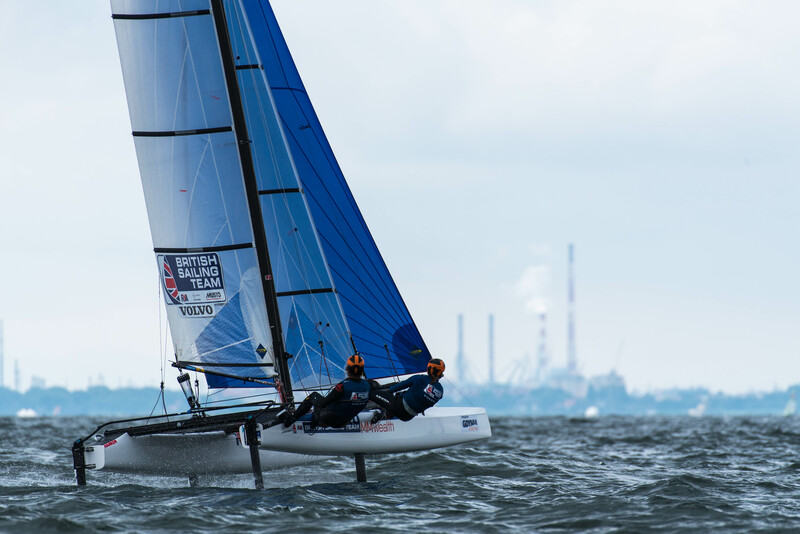 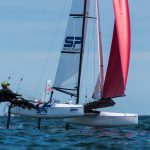 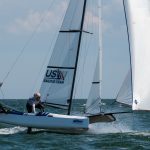 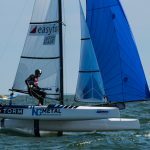 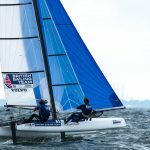 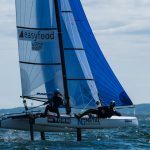 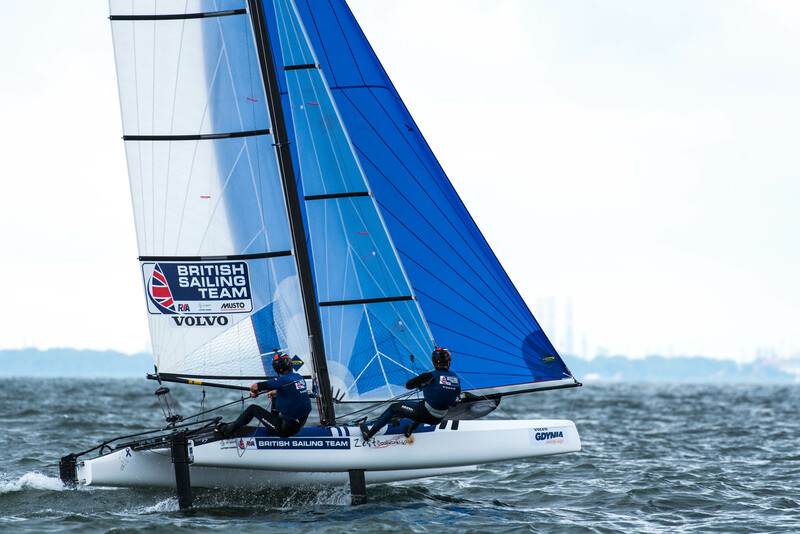 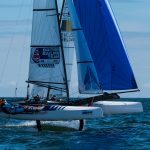 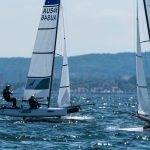 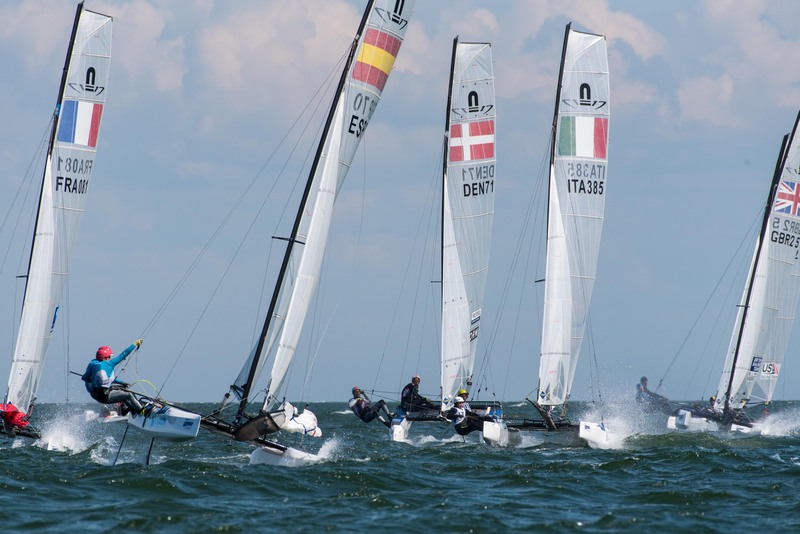 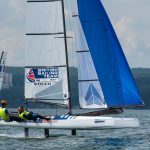 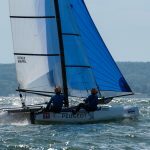 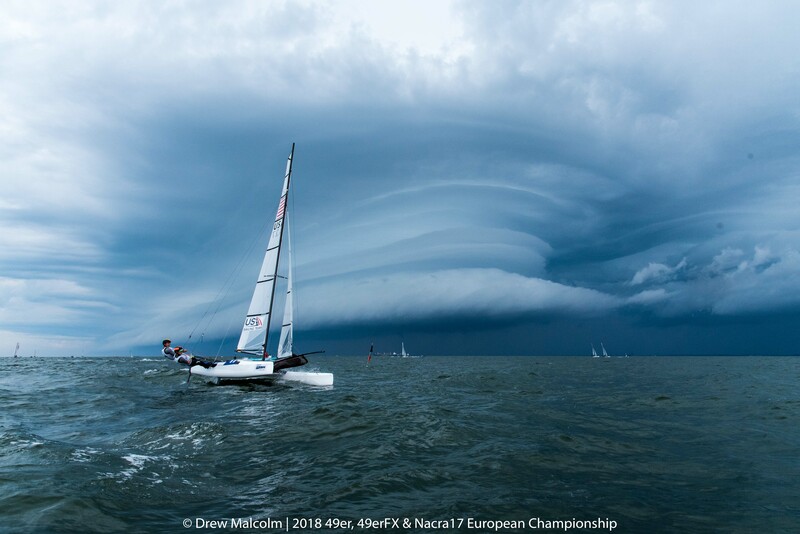 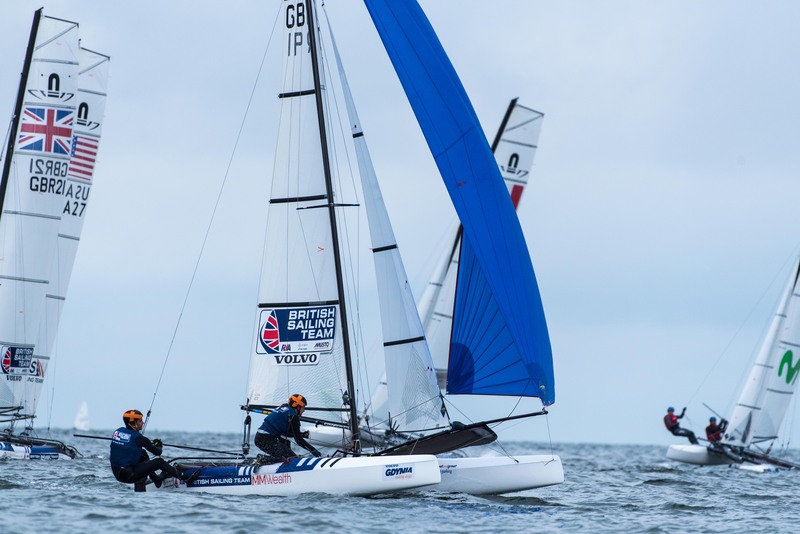 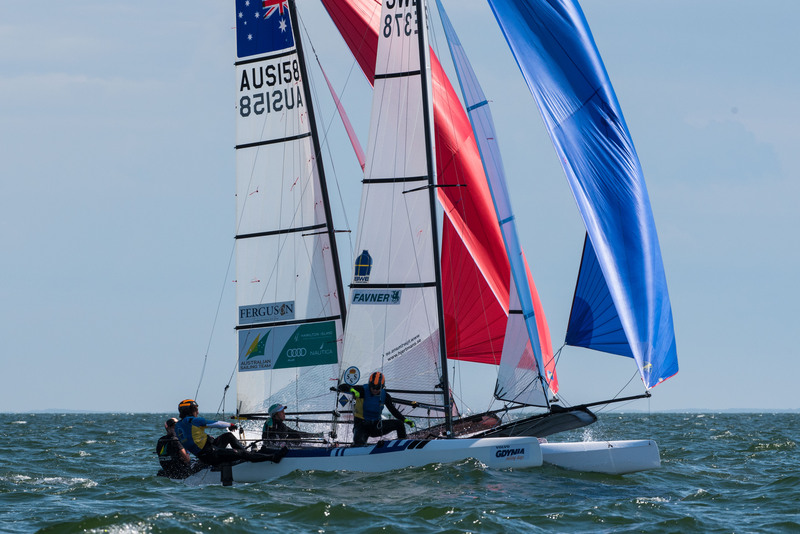 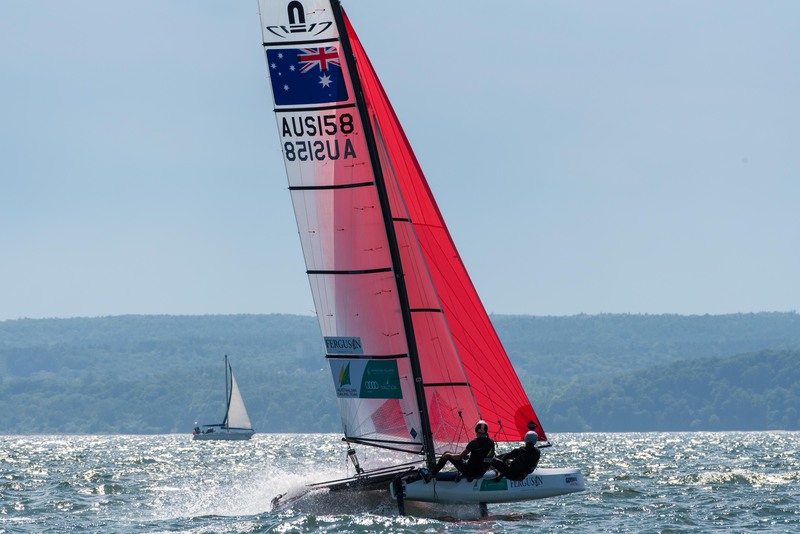 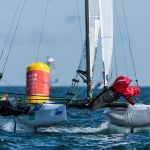 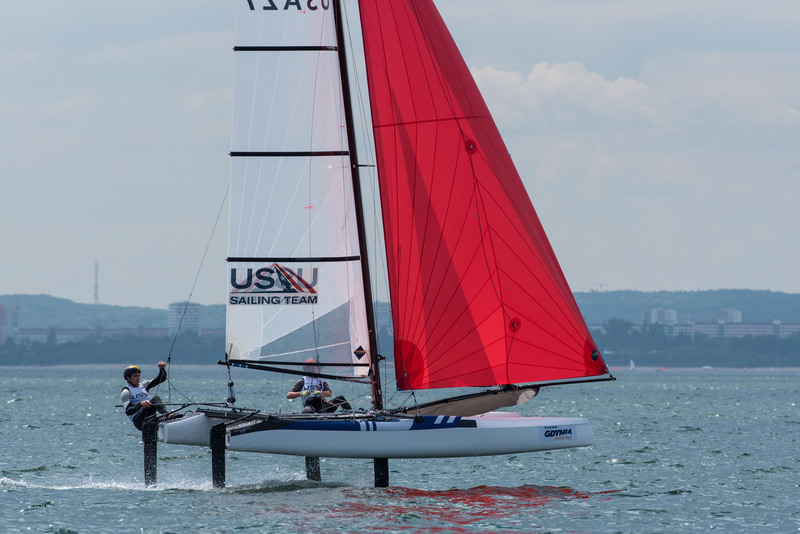 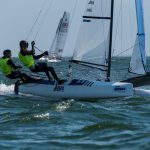 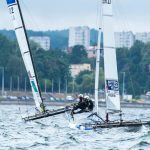 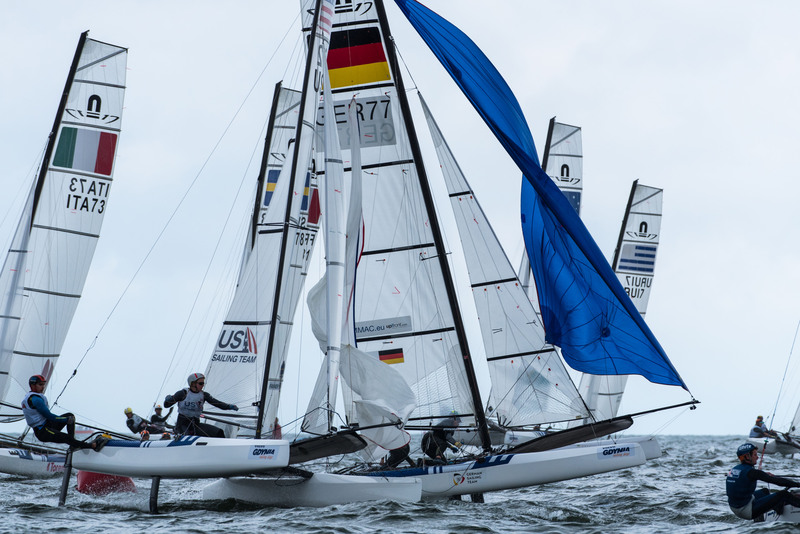 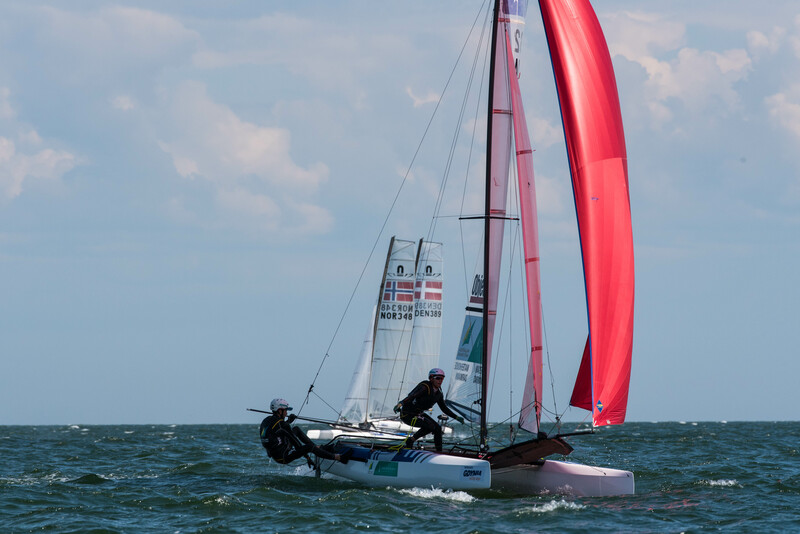 The morning’s higher breeze gave the men’s skiffs enough power to deal with the confused chop, something the FX and Nacra sailors didn’t have later in the afternoon. 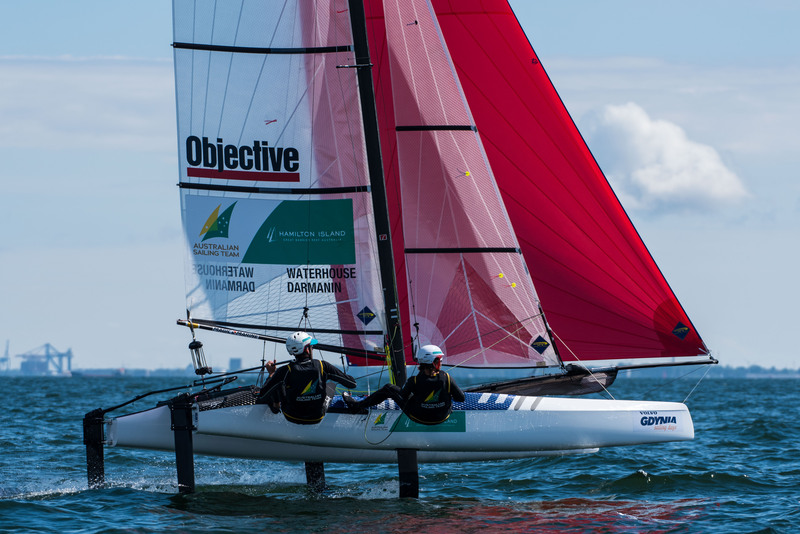 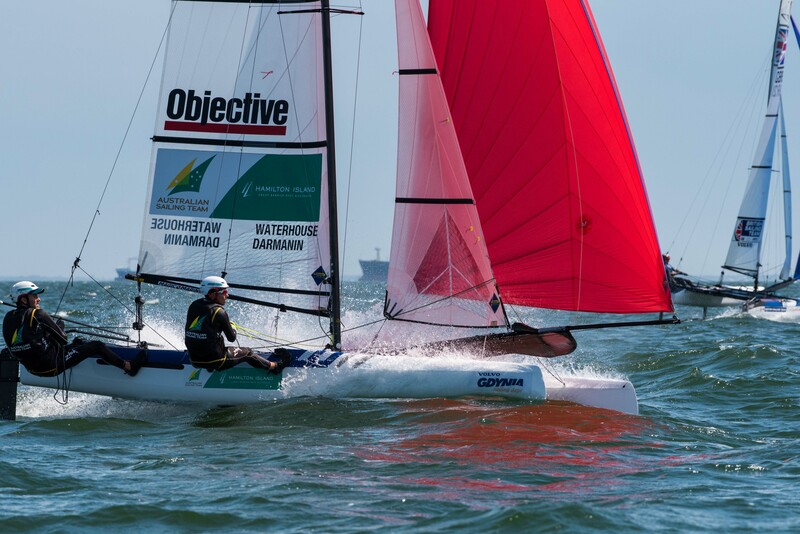 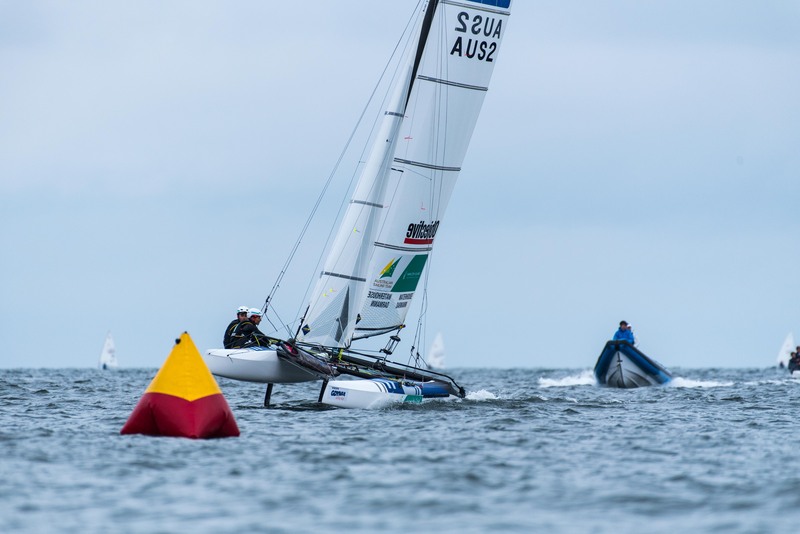 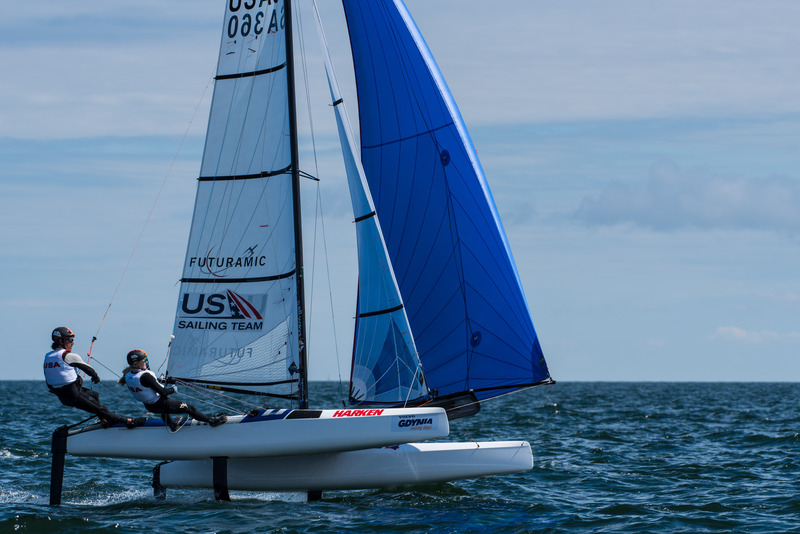 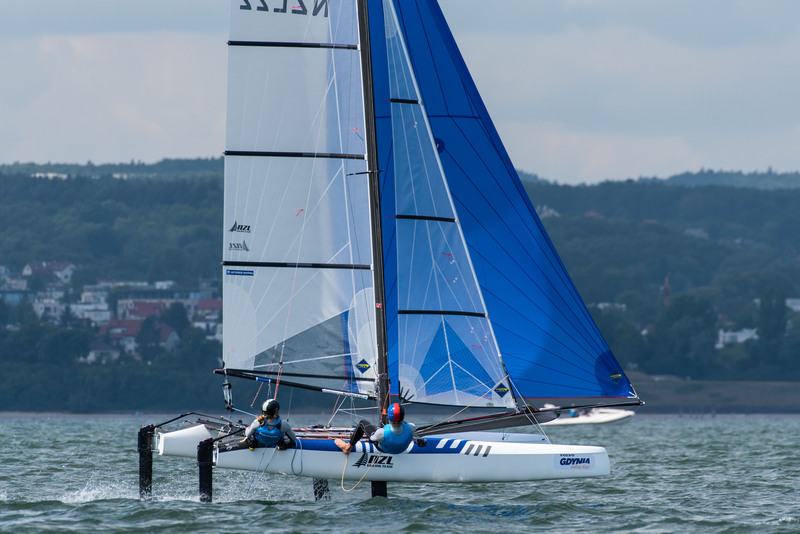 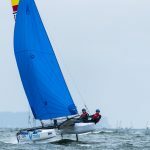 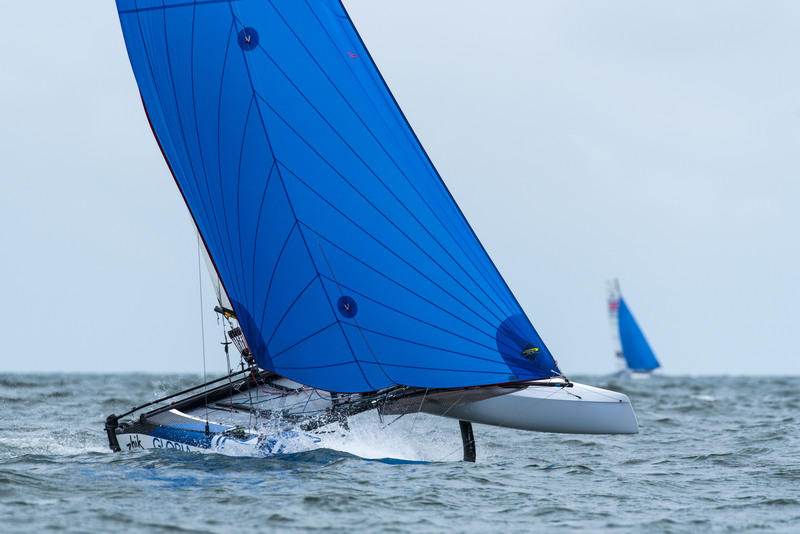 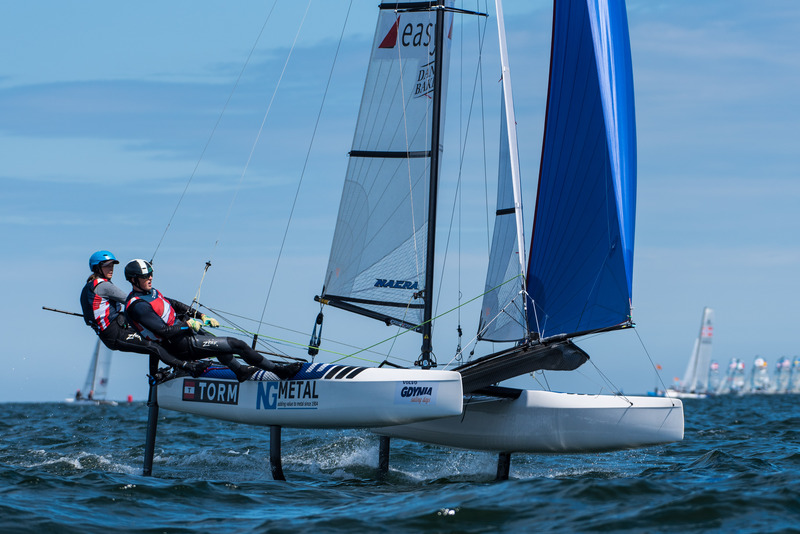 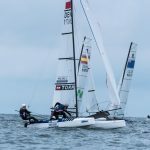 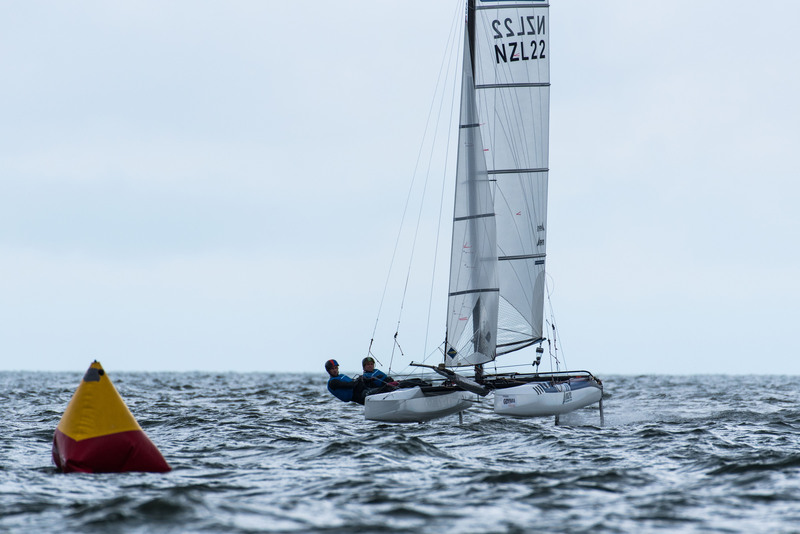 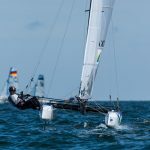 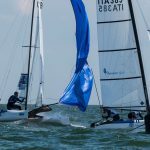 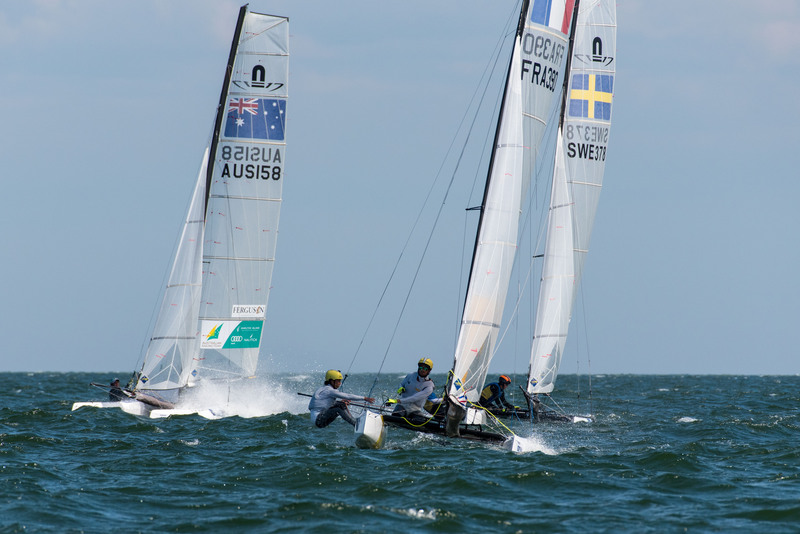 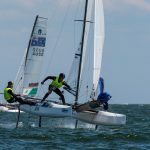 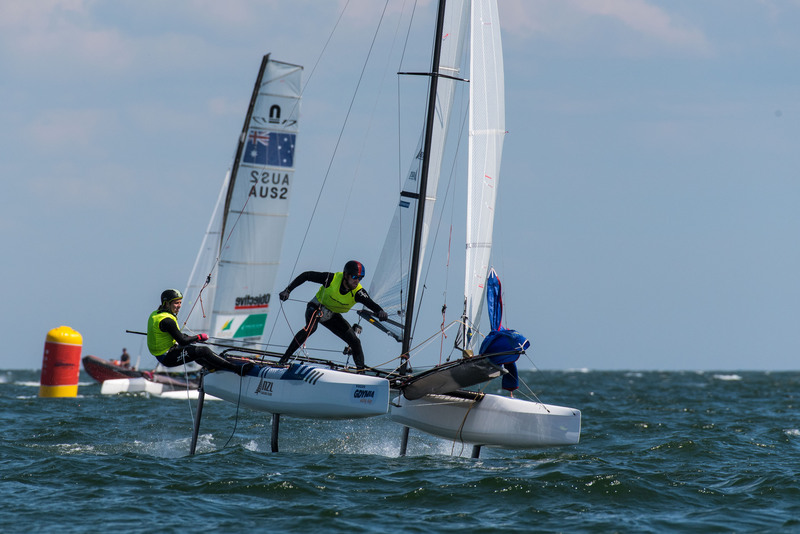 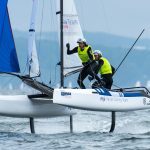 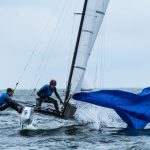 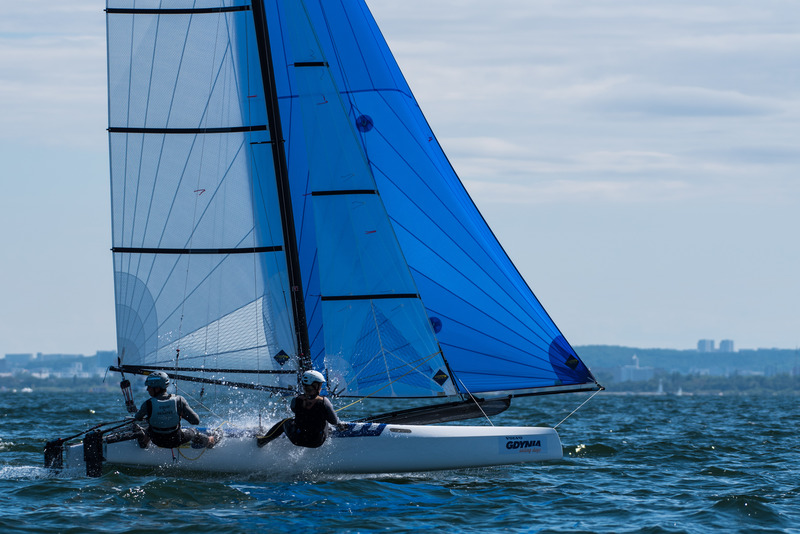 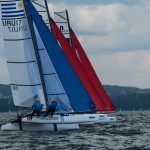 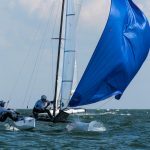 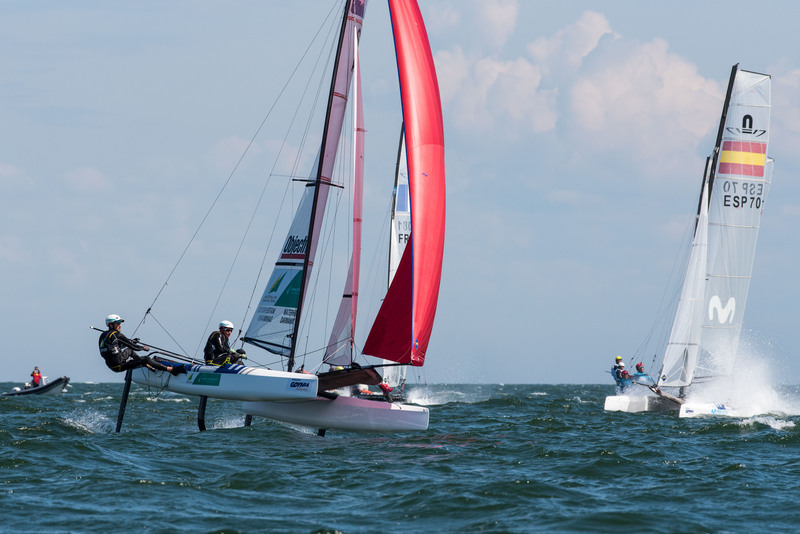 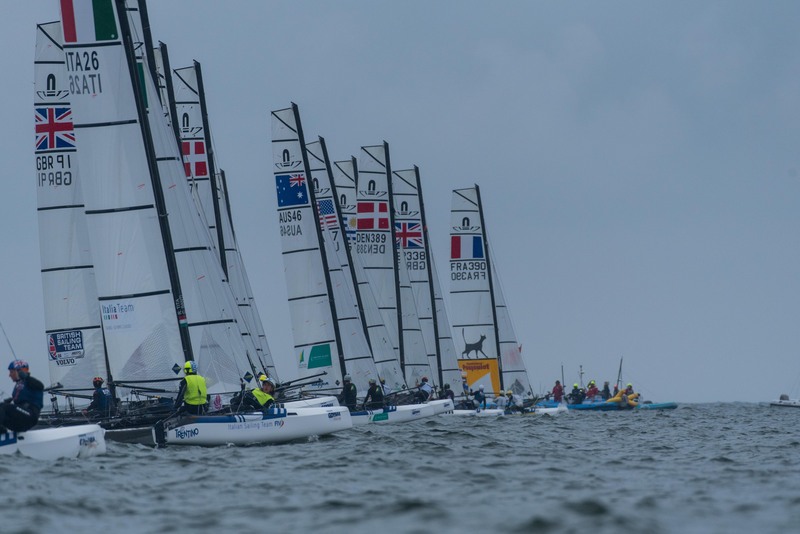 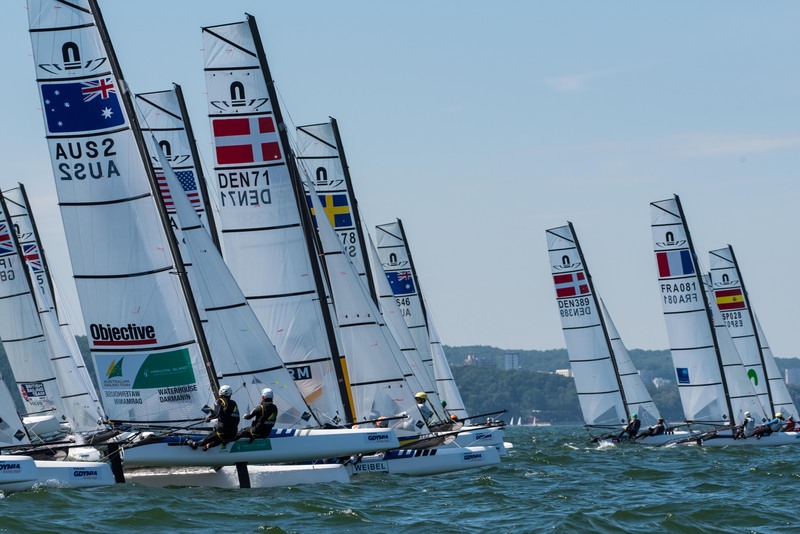 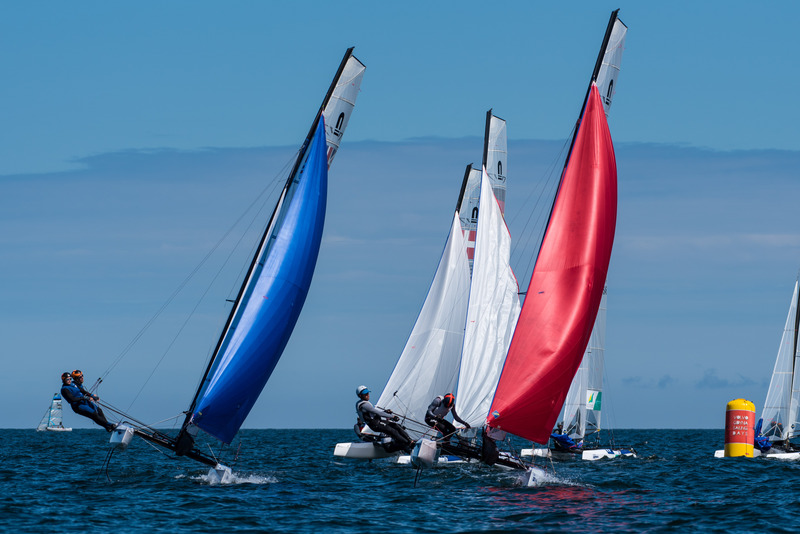 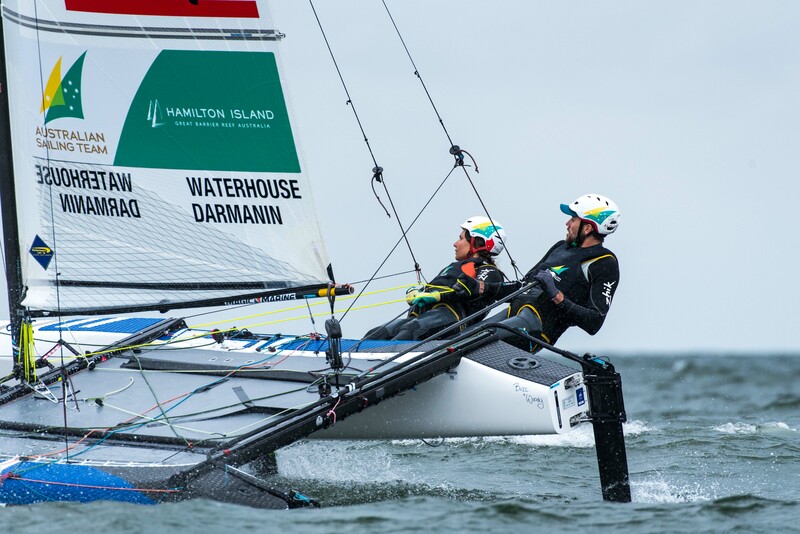 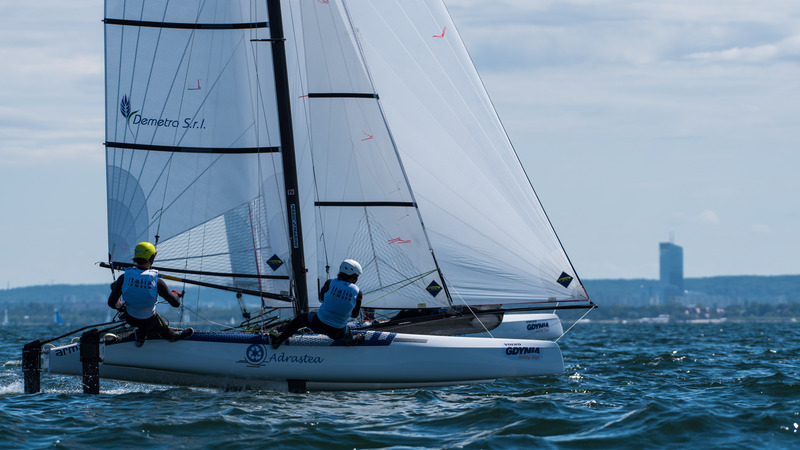 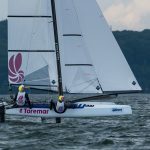 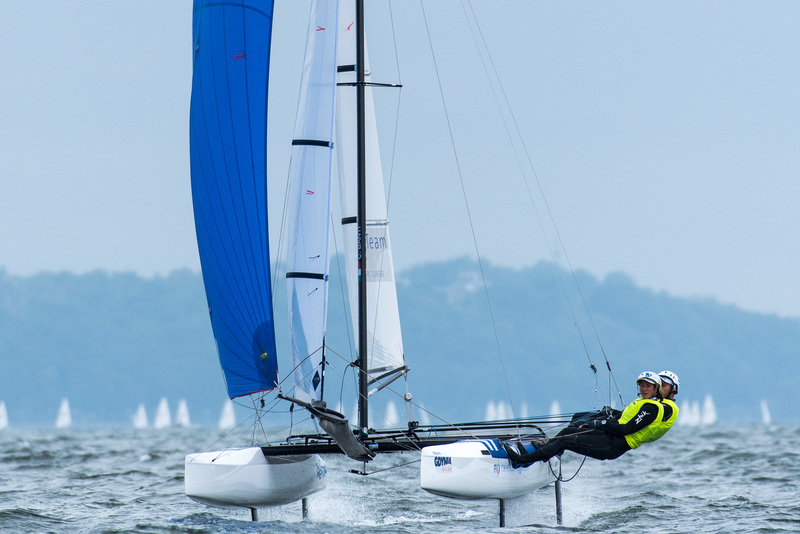 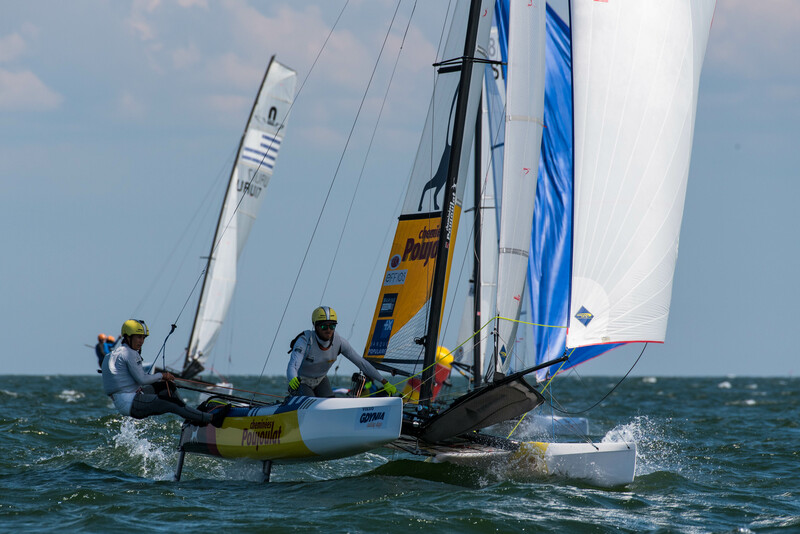 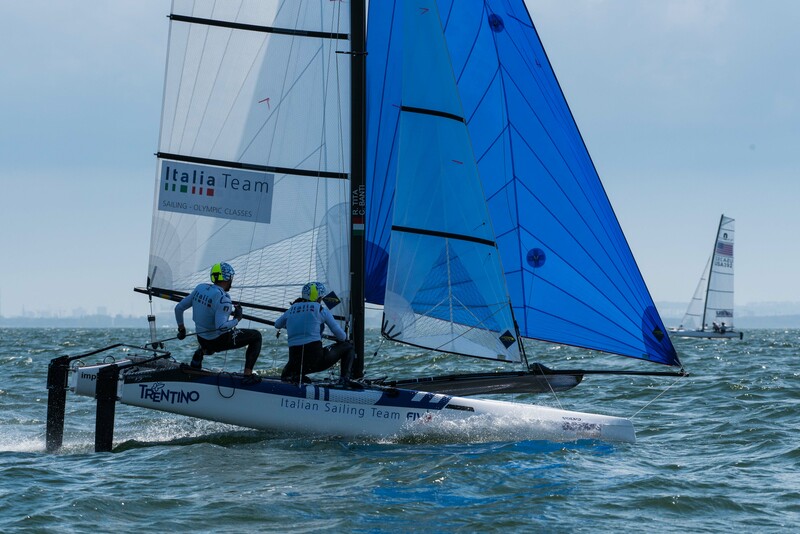 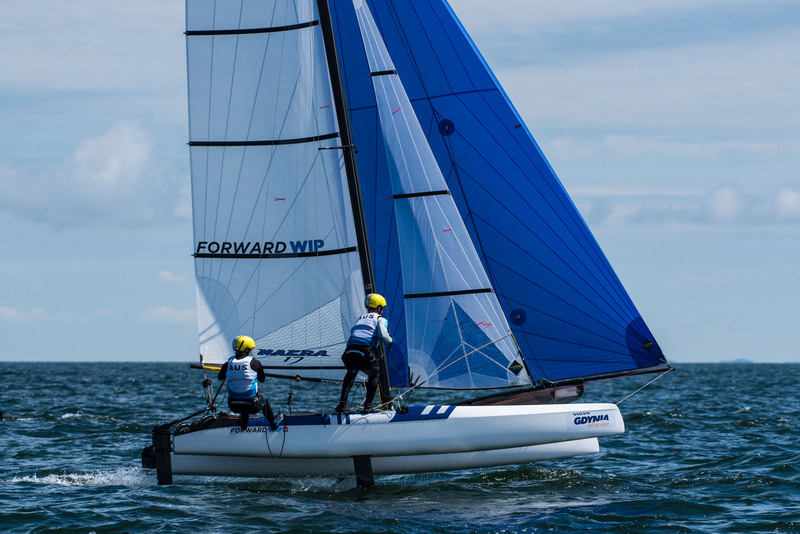 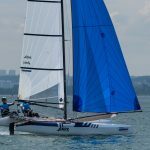 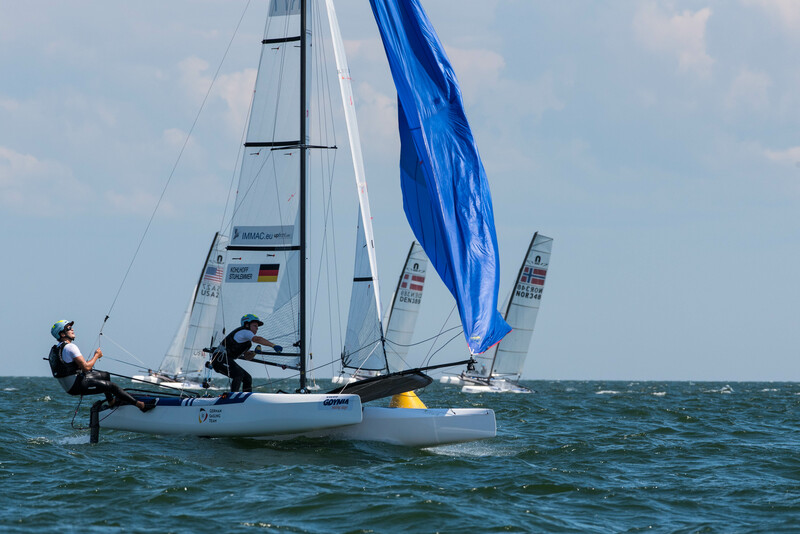 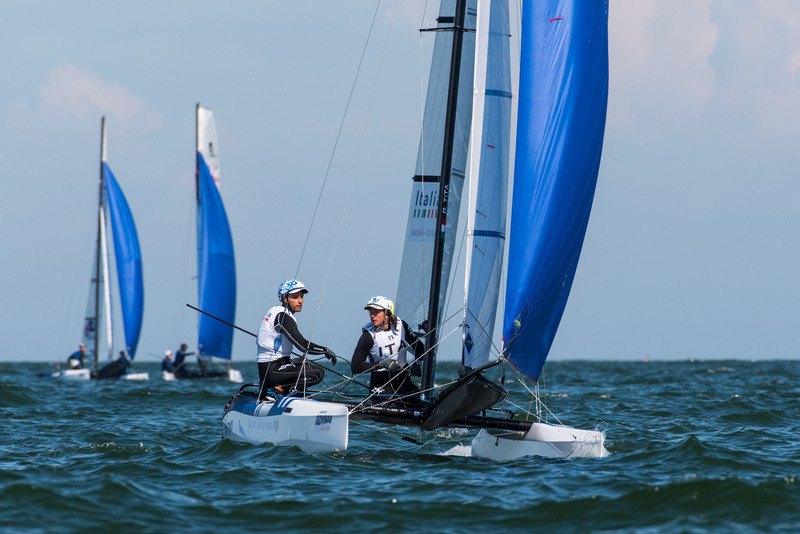 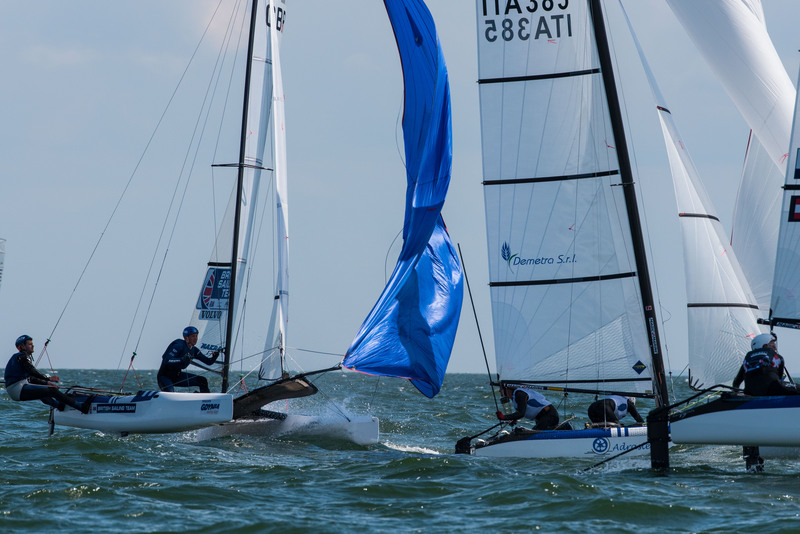 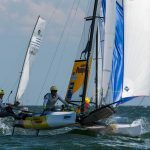 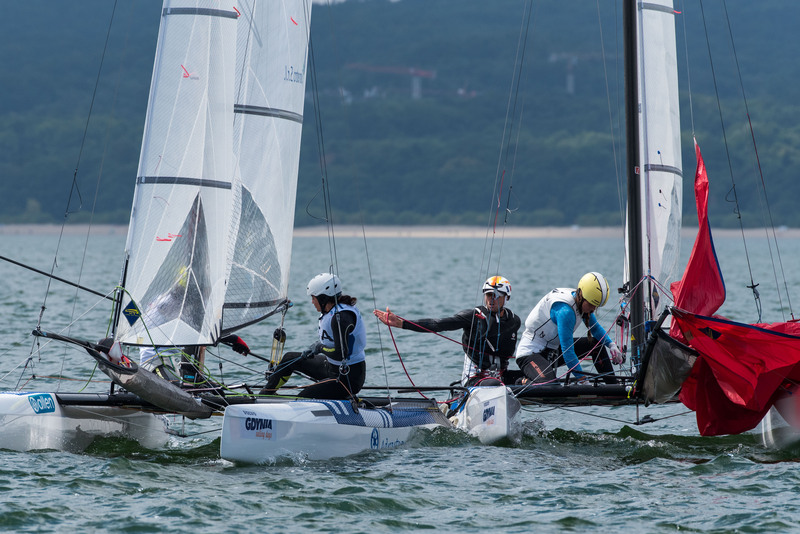 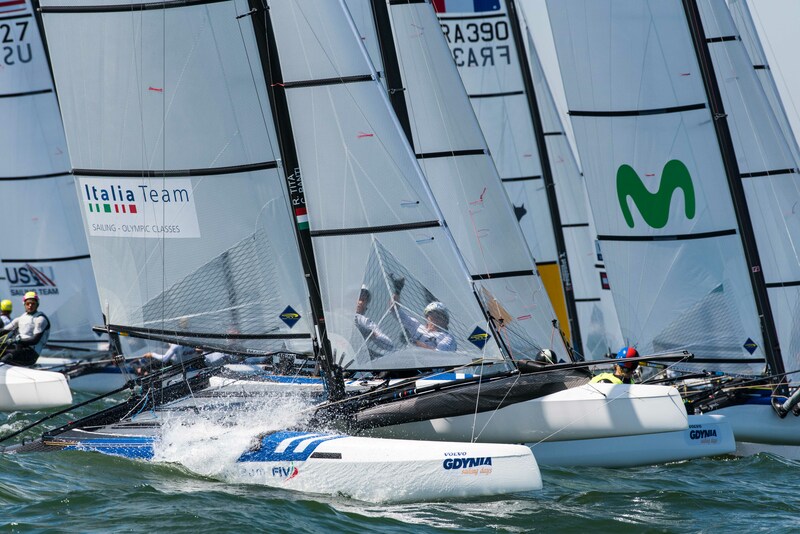 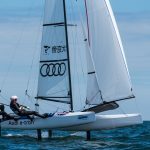 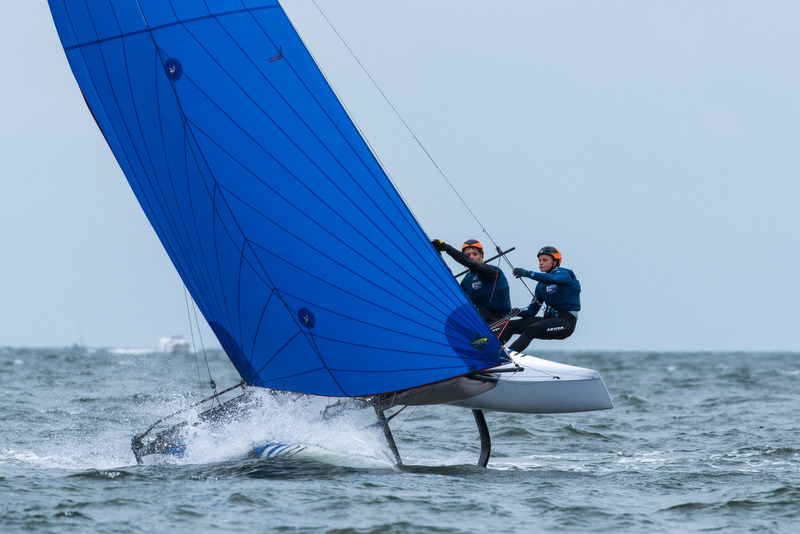 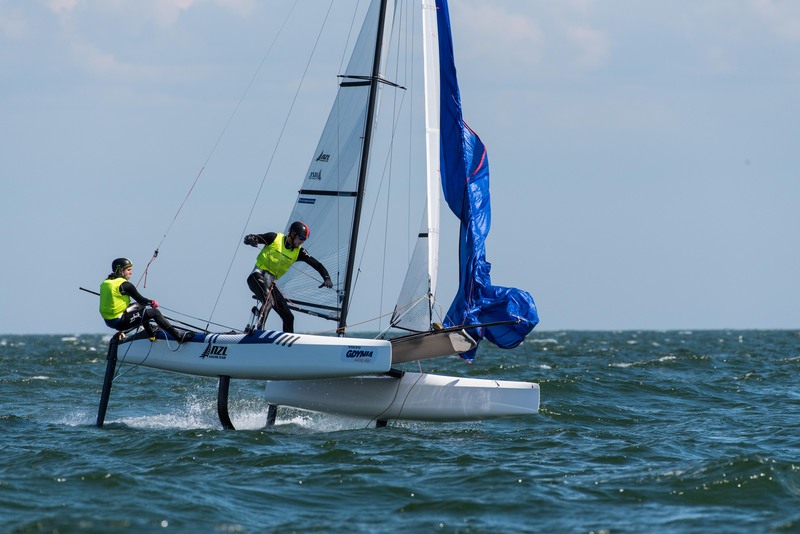 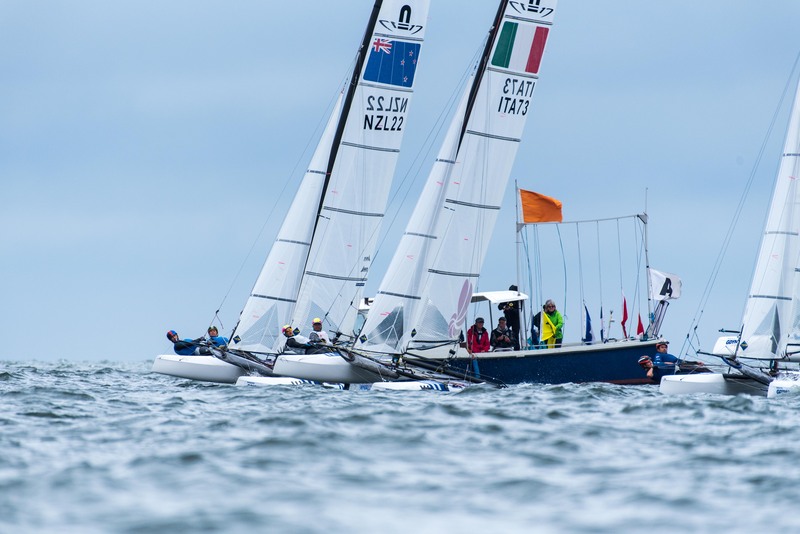 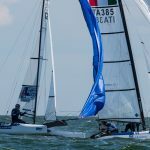 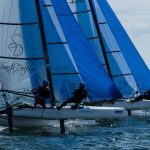 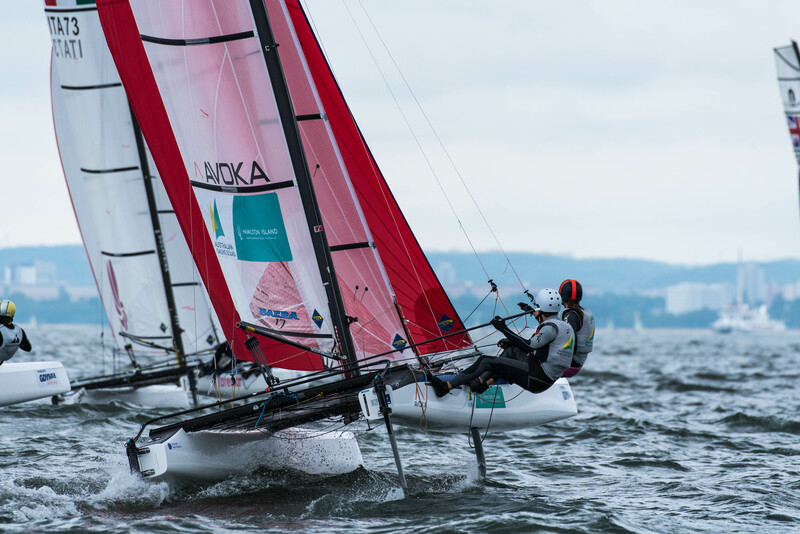 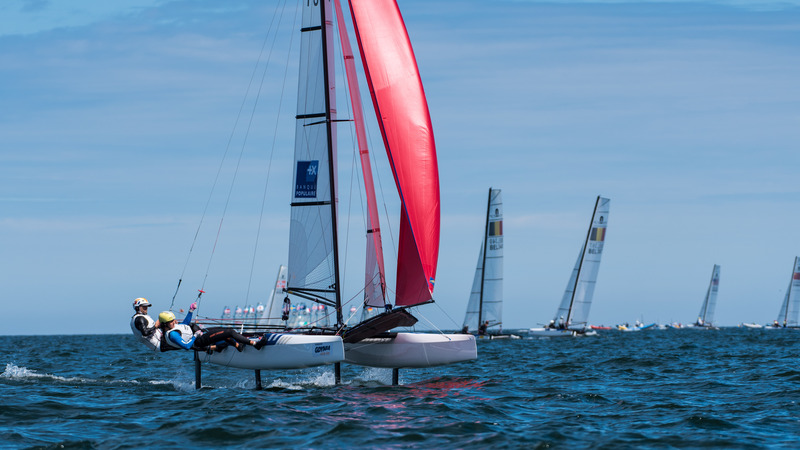 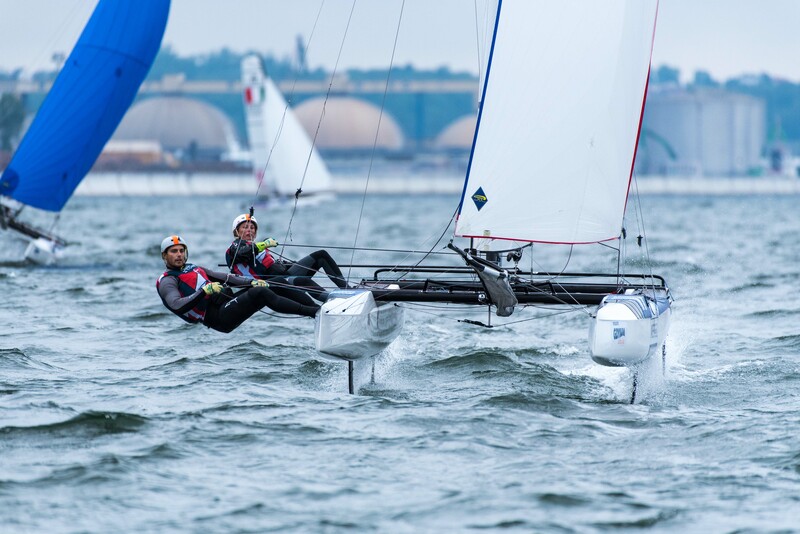 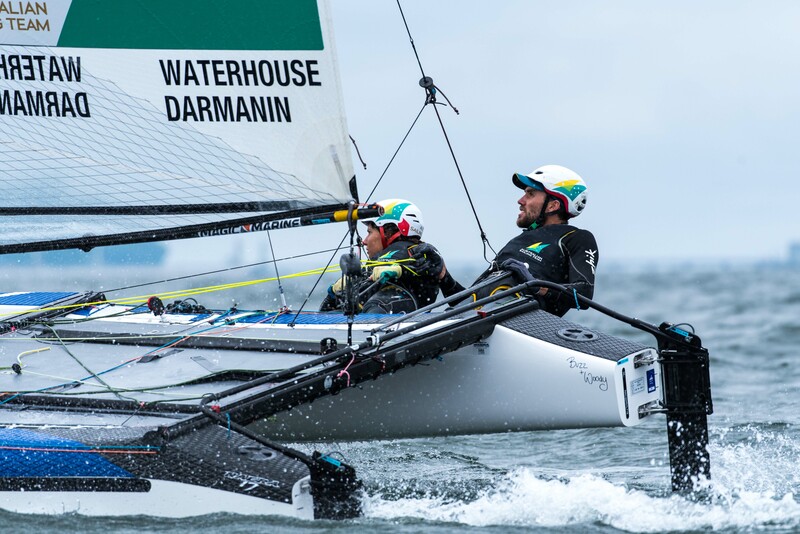 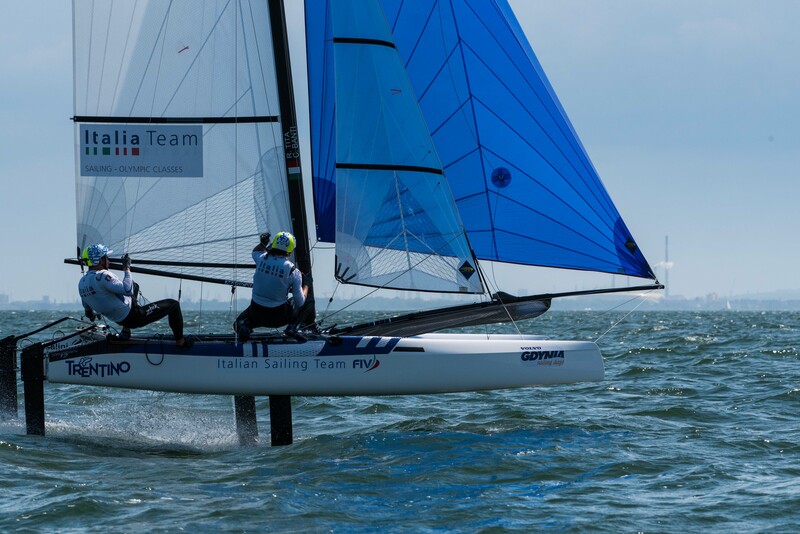 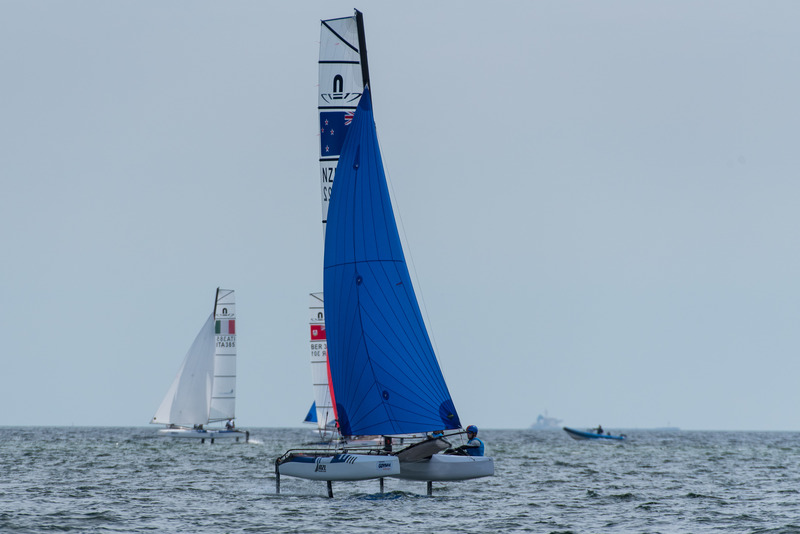 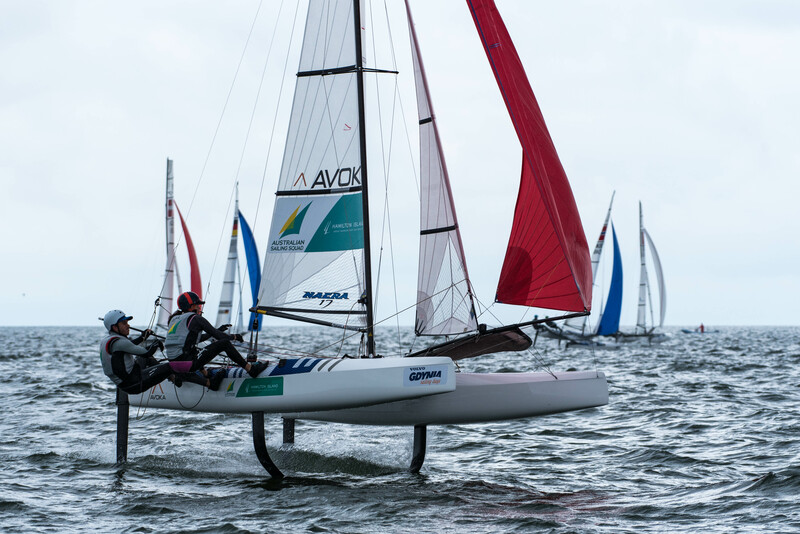 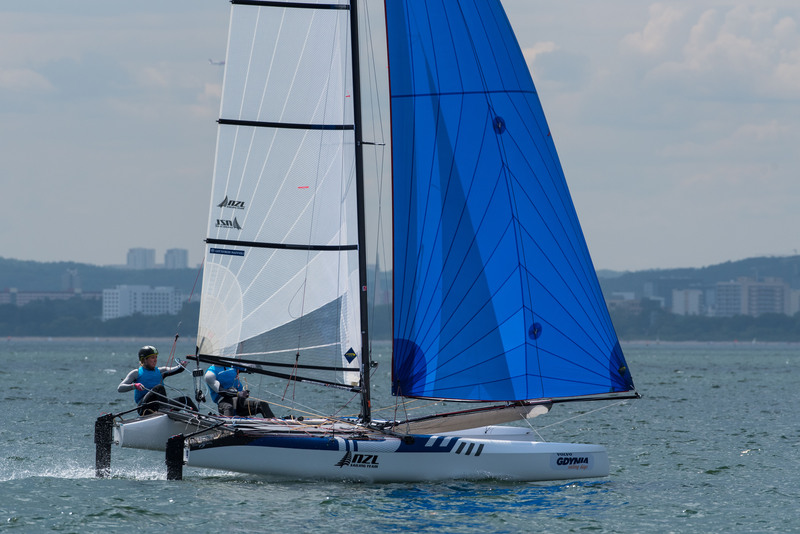 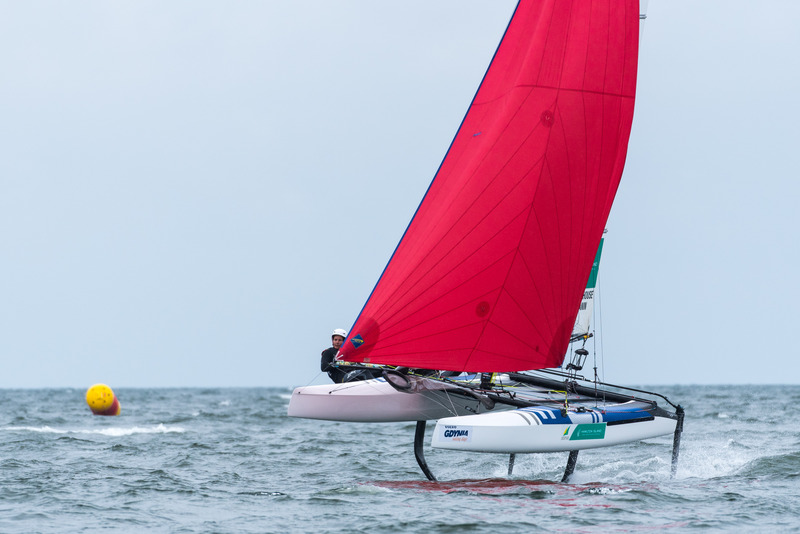 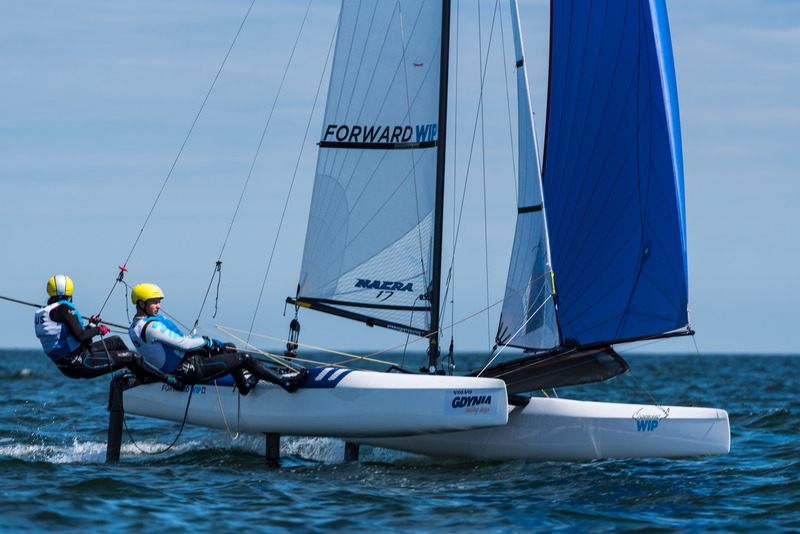 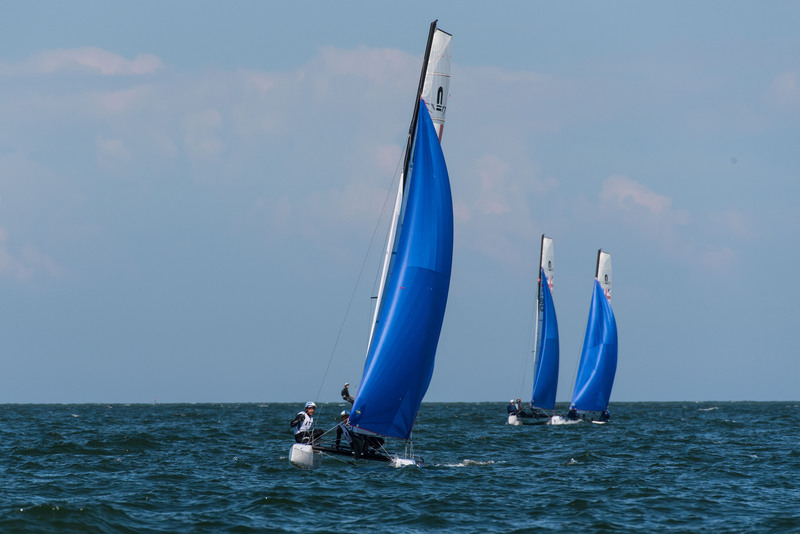 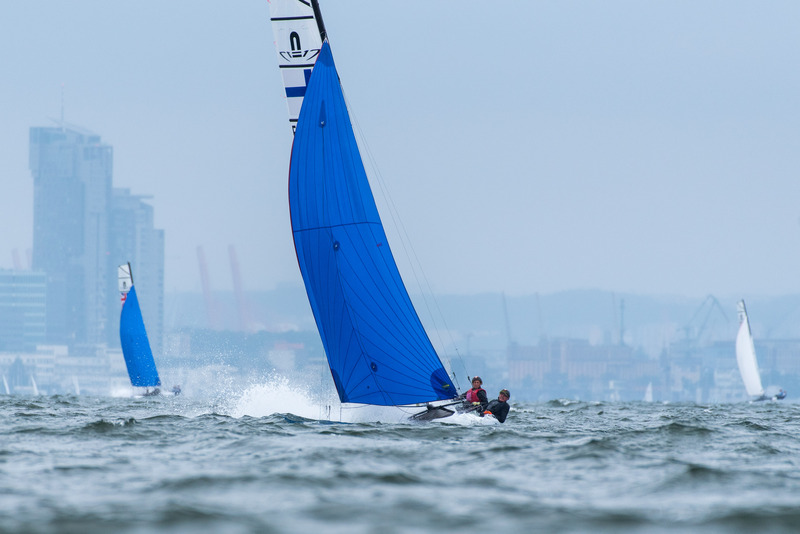 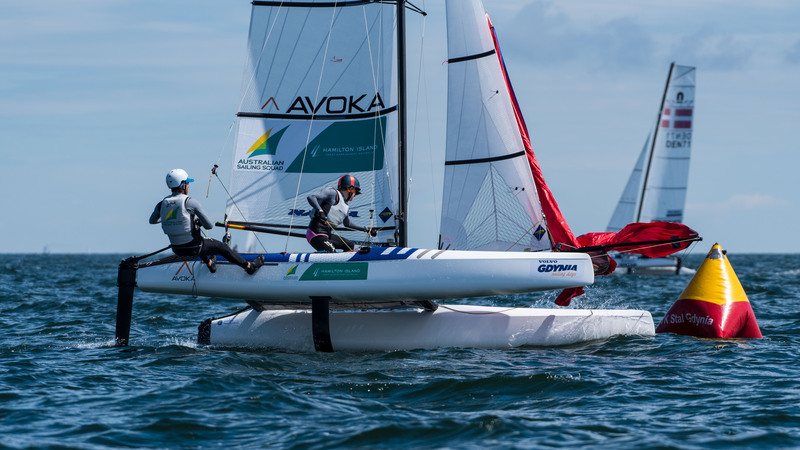 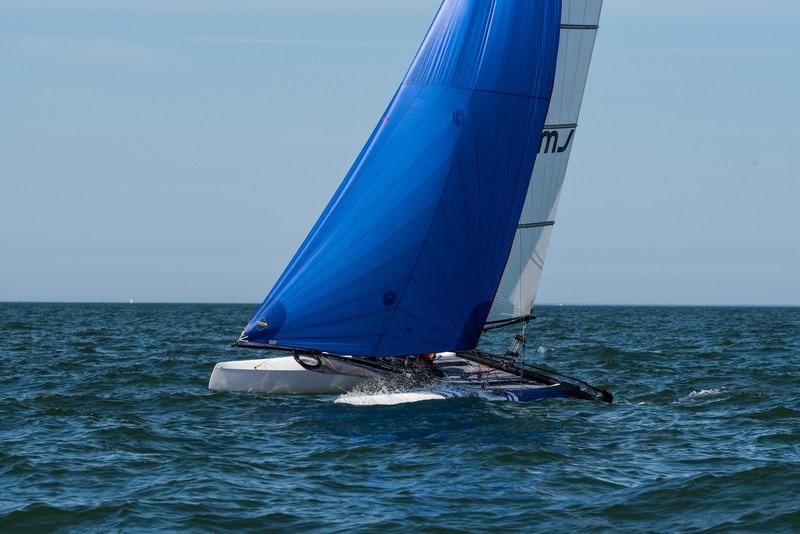 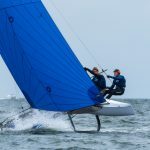 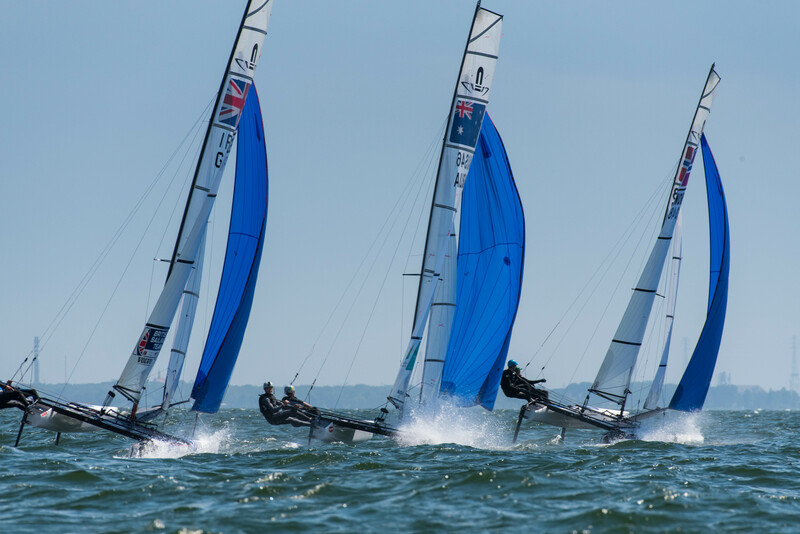 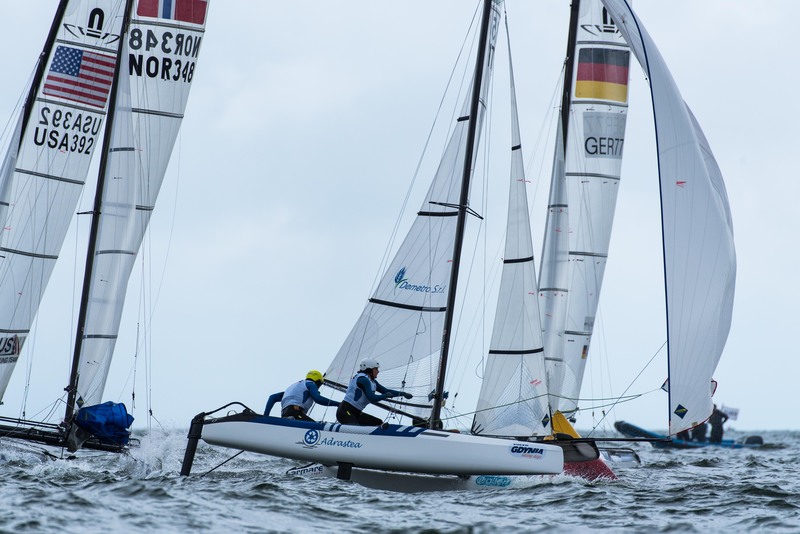 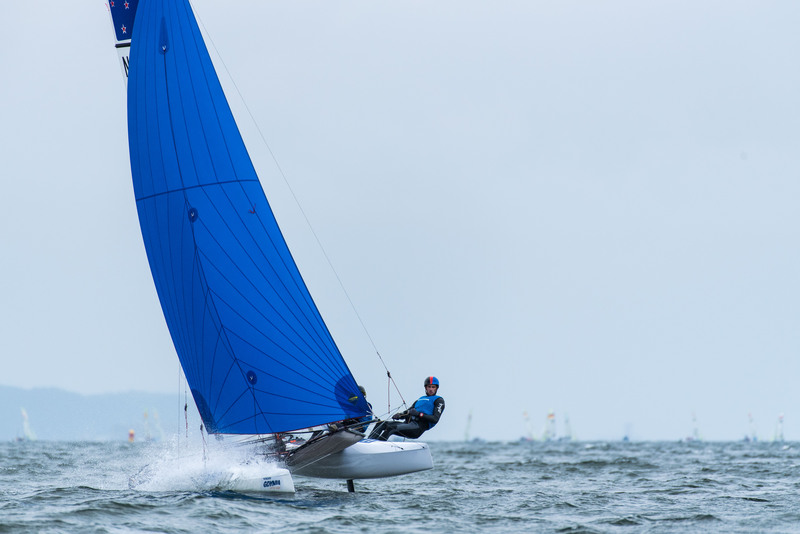 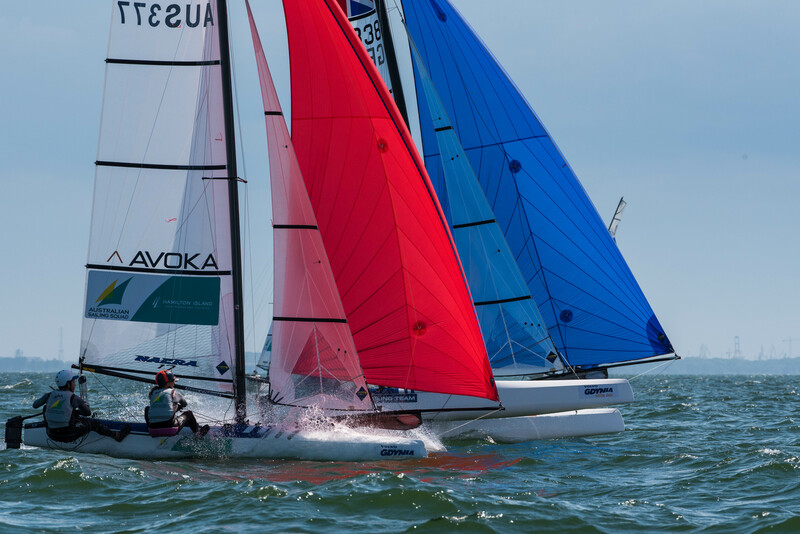 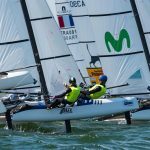 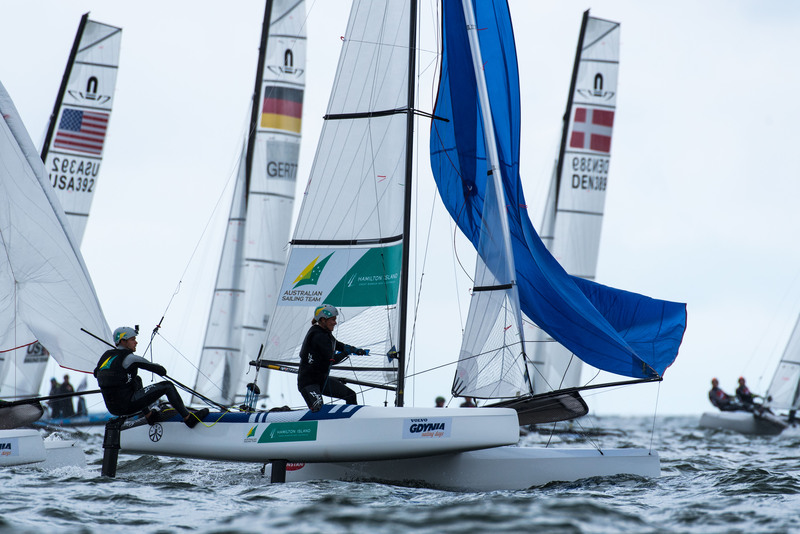 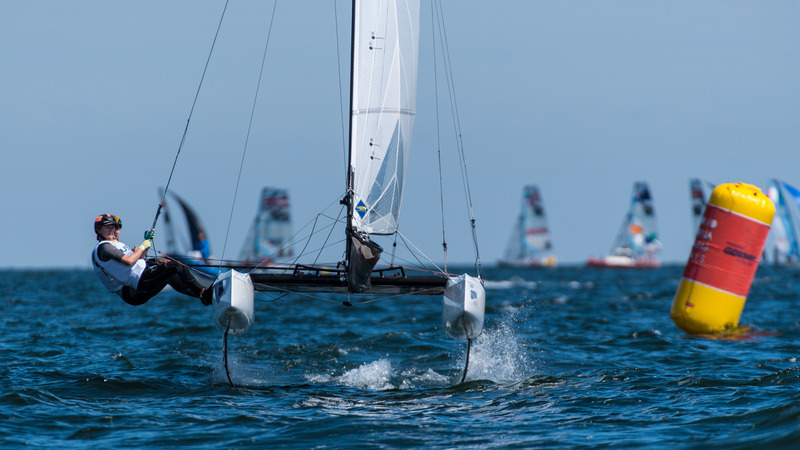 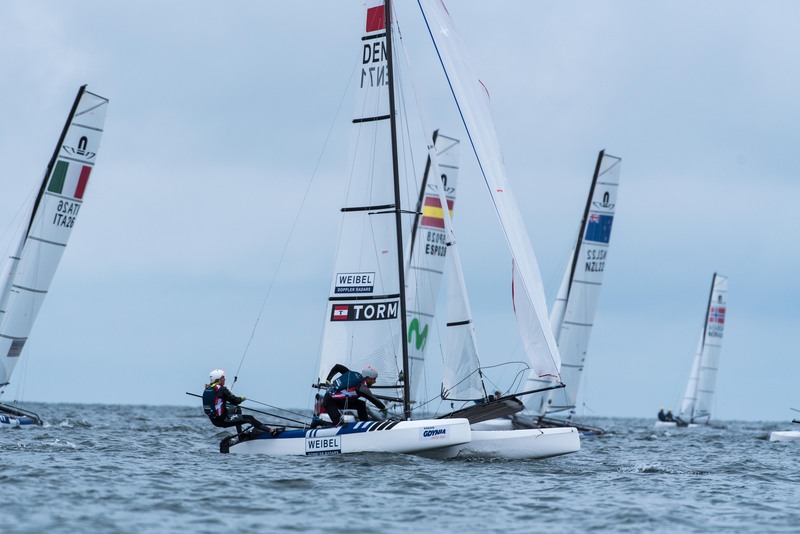 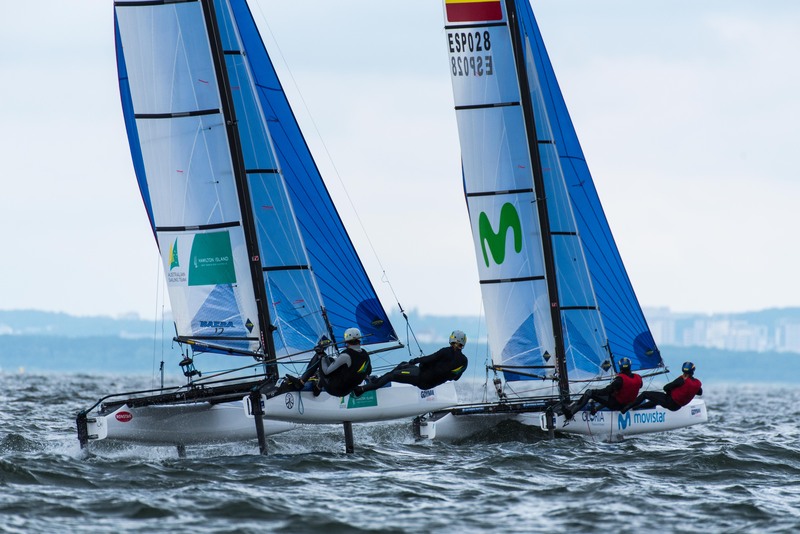 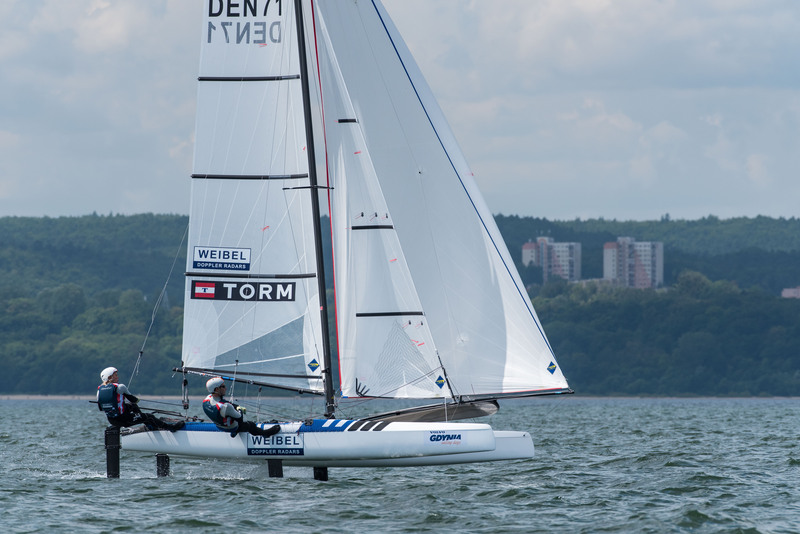 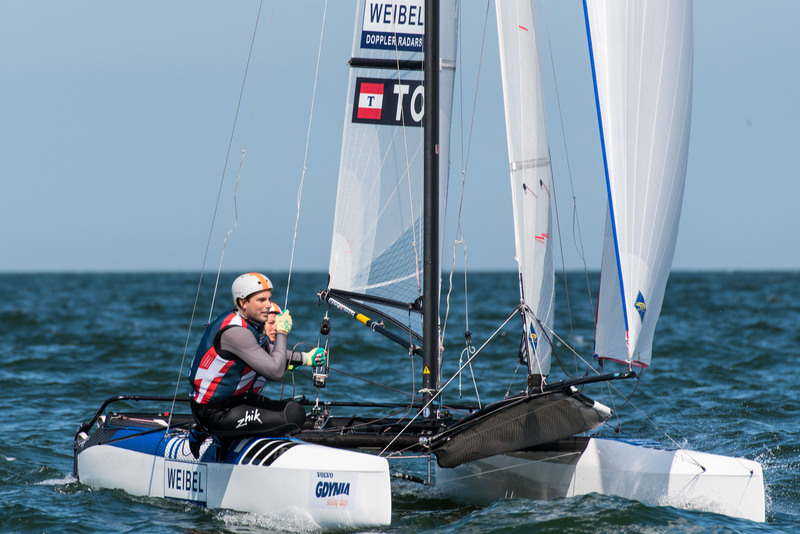 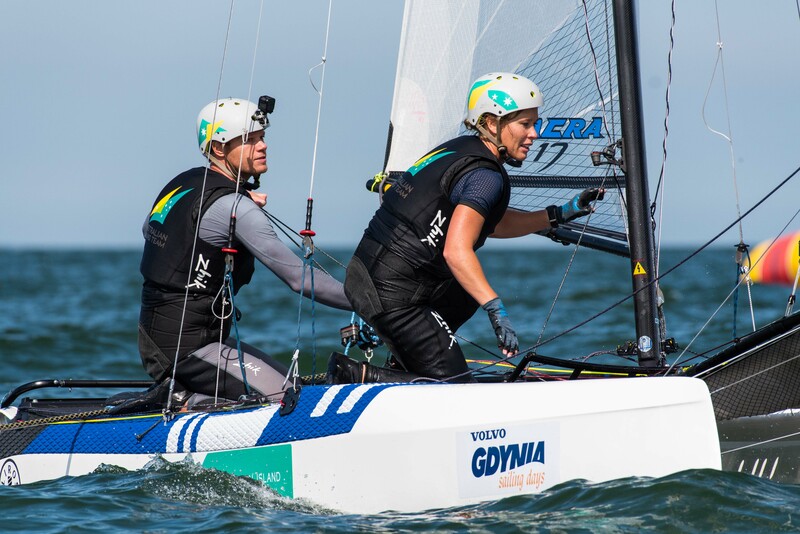 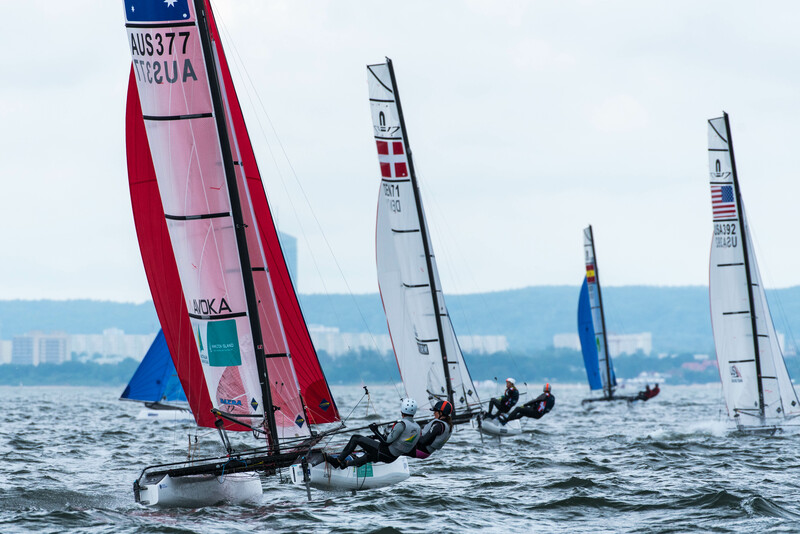 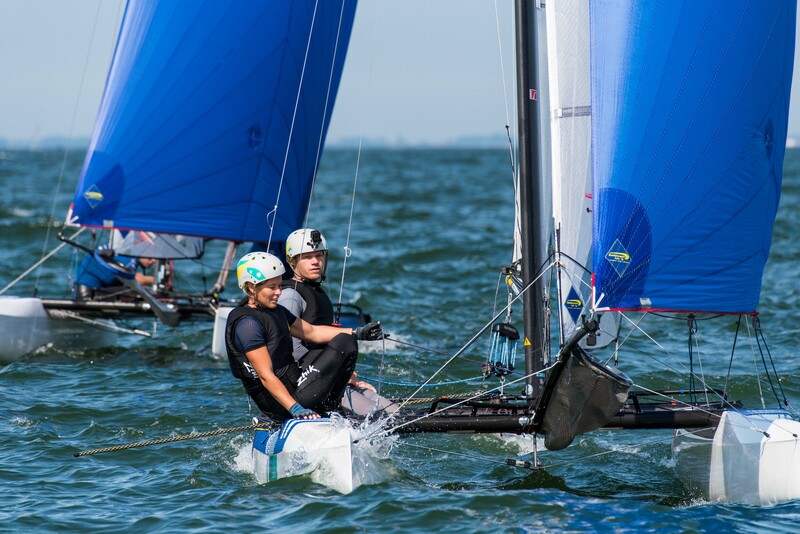 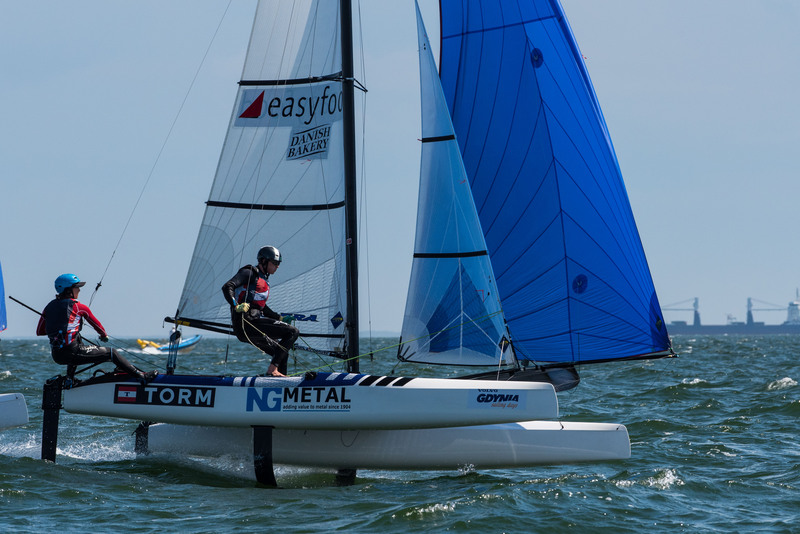 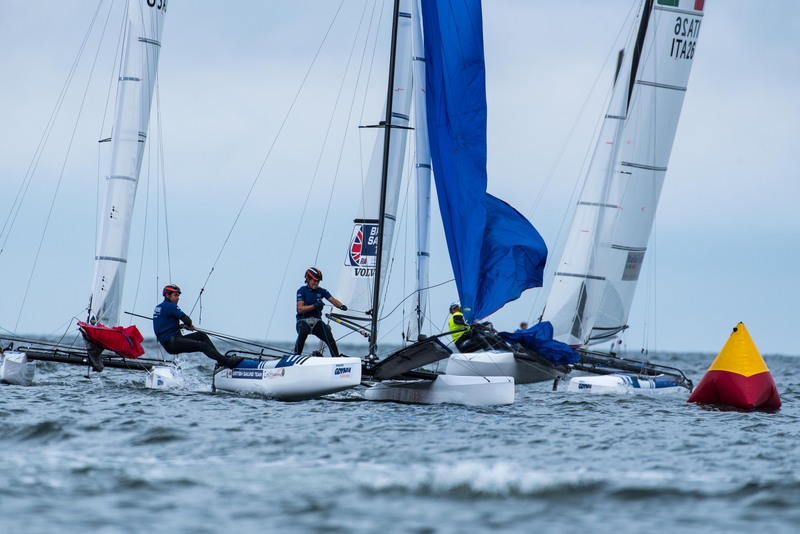 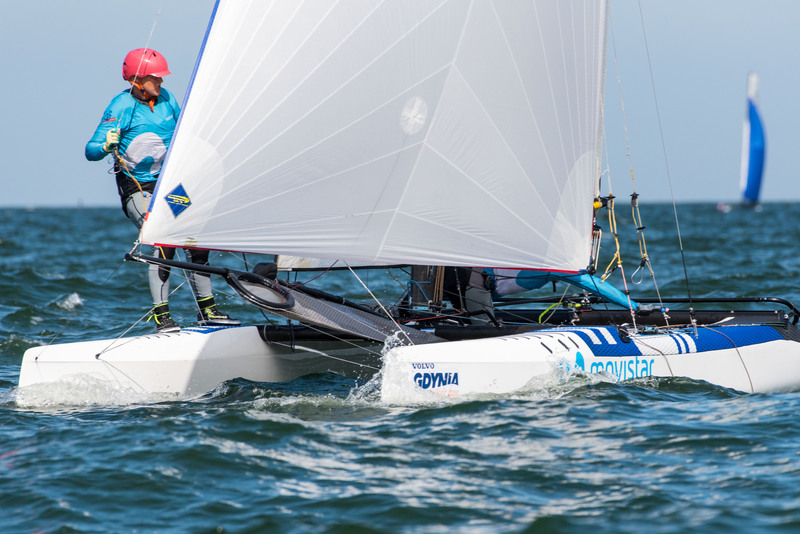 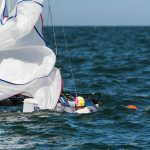 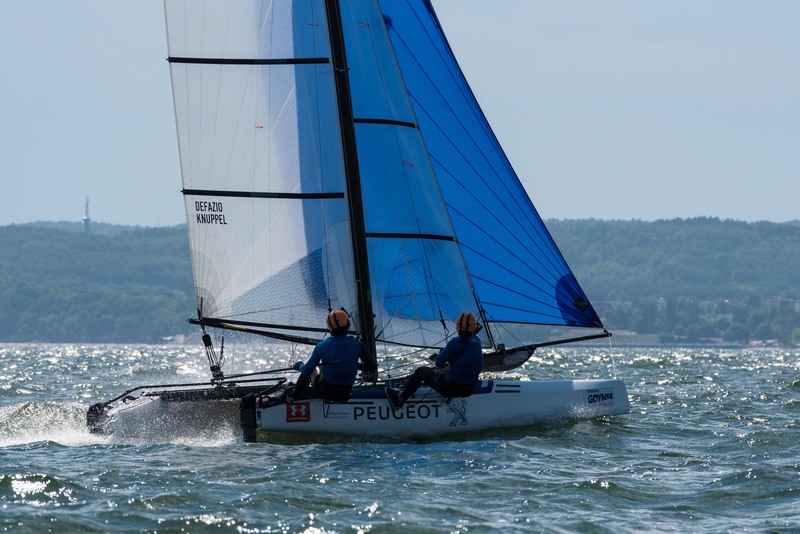 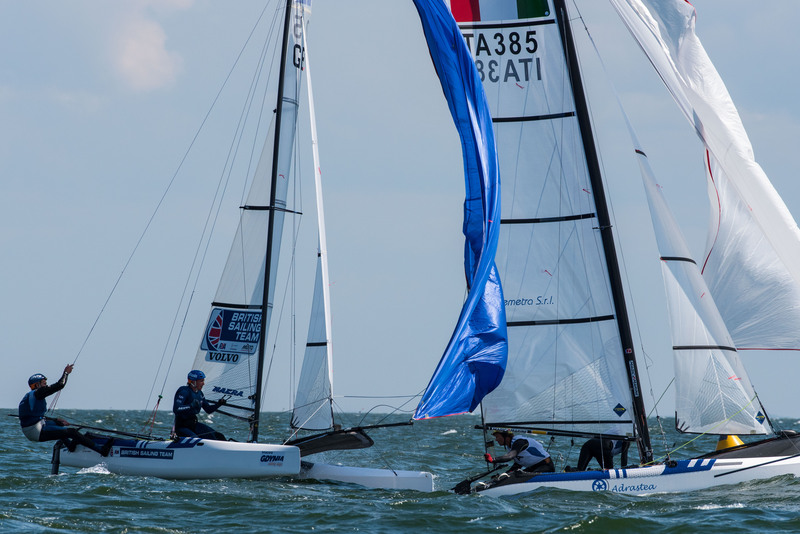 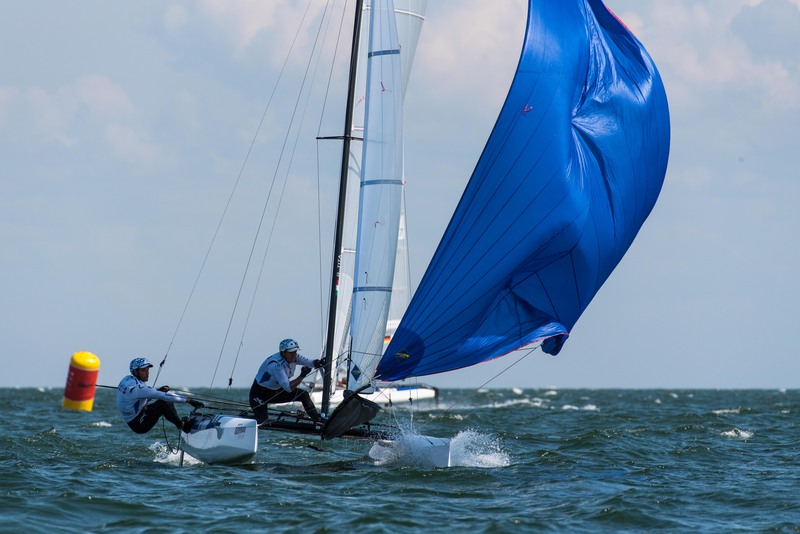 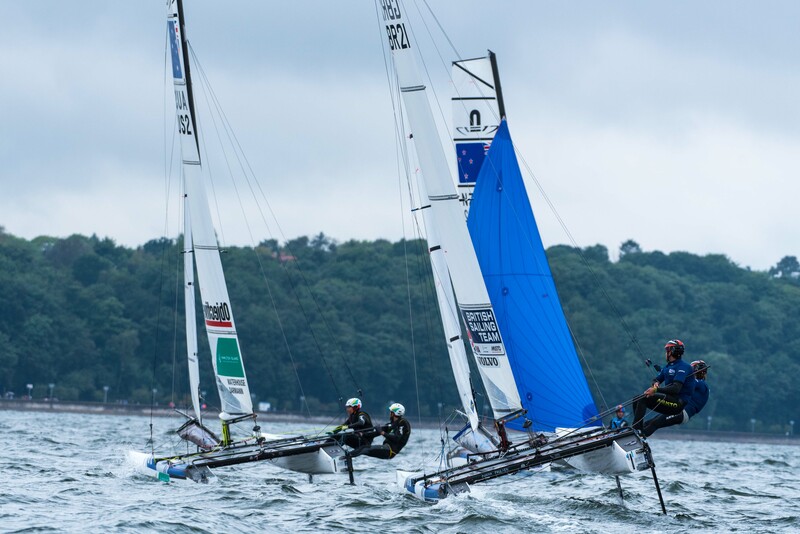 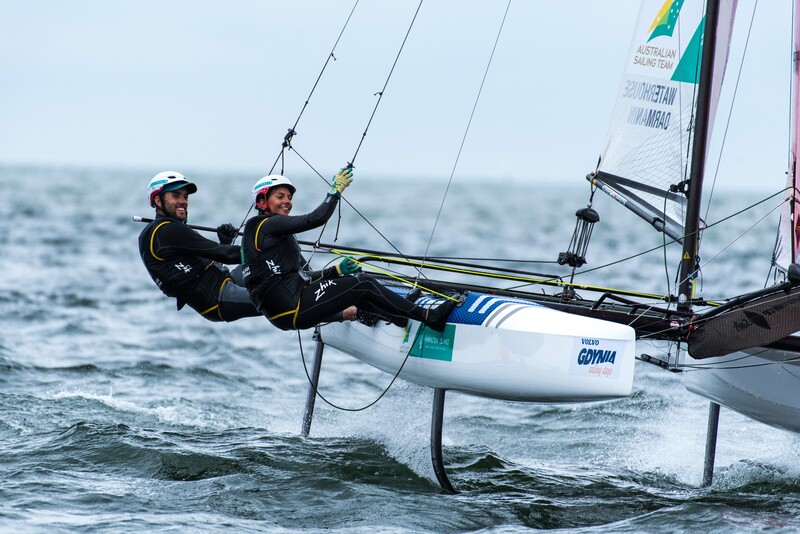 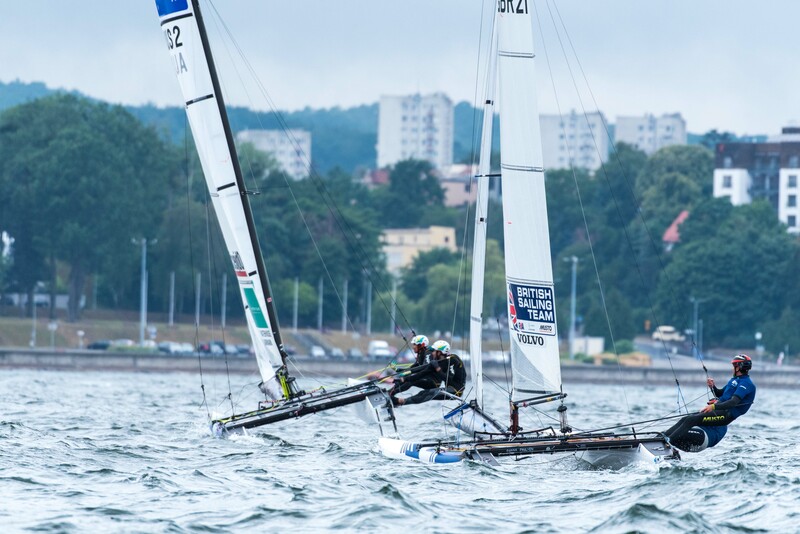 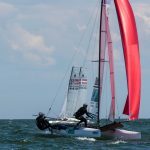 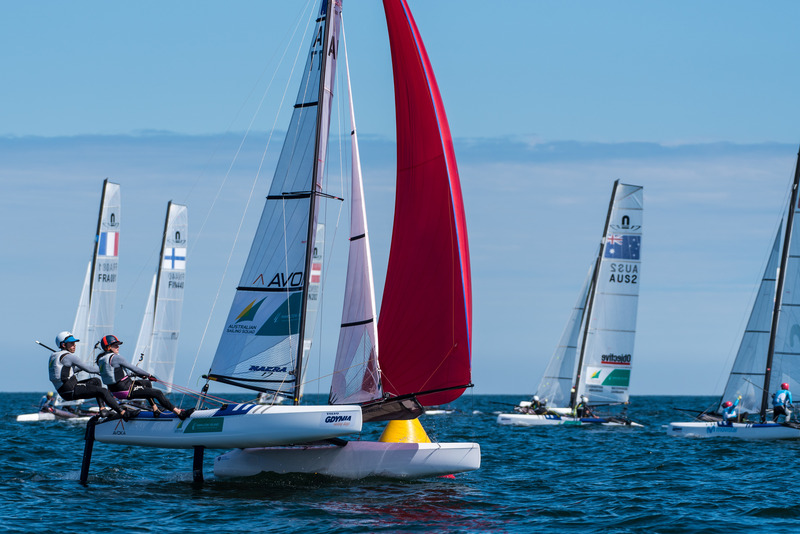 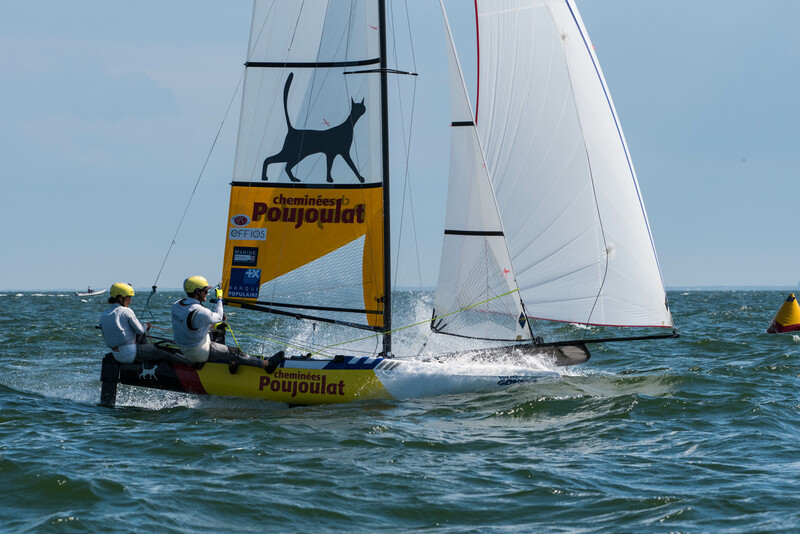 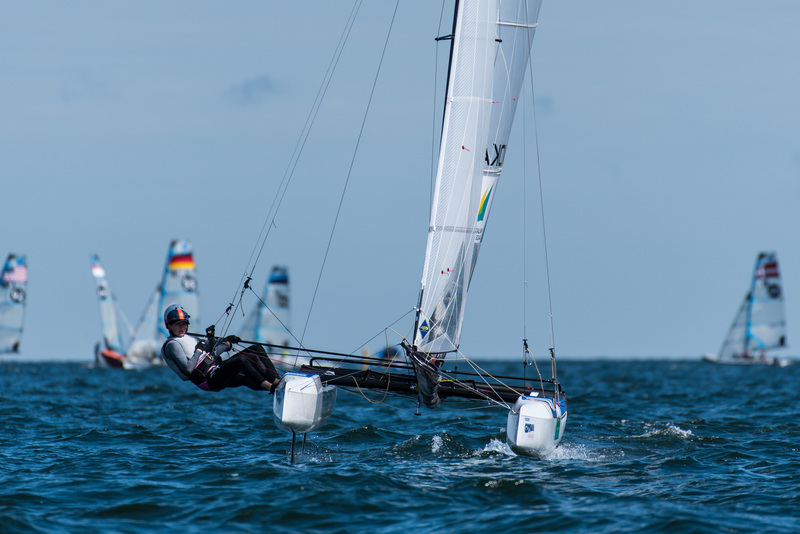 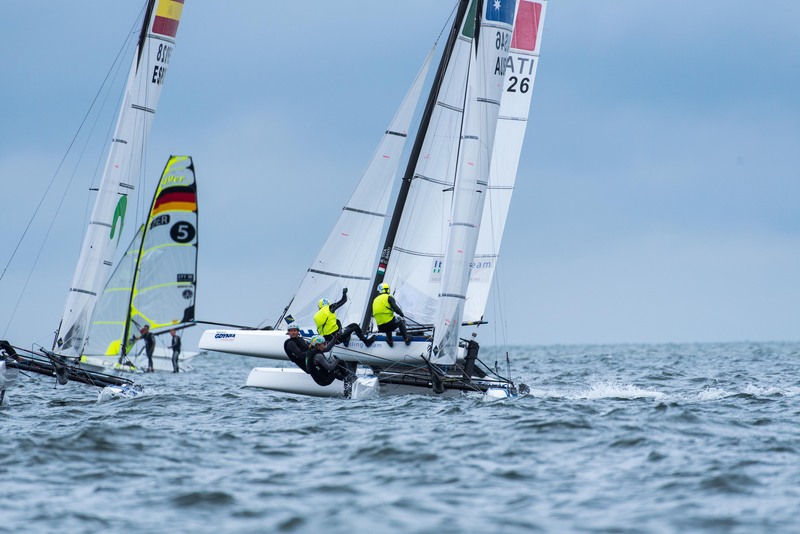 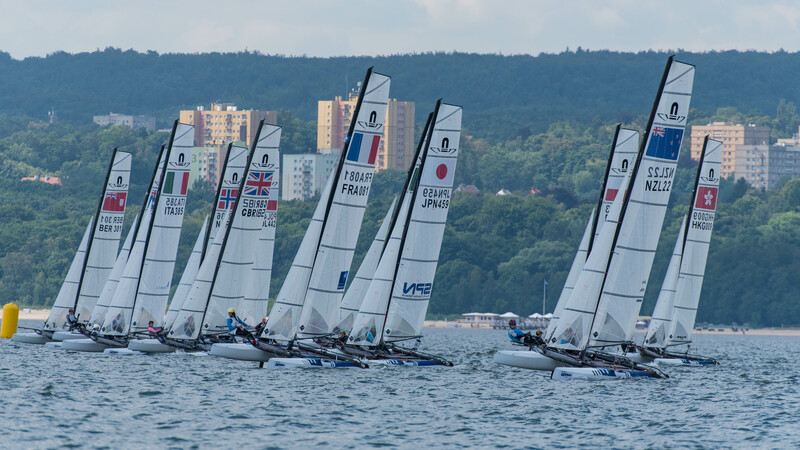 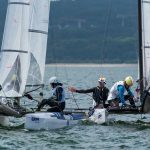 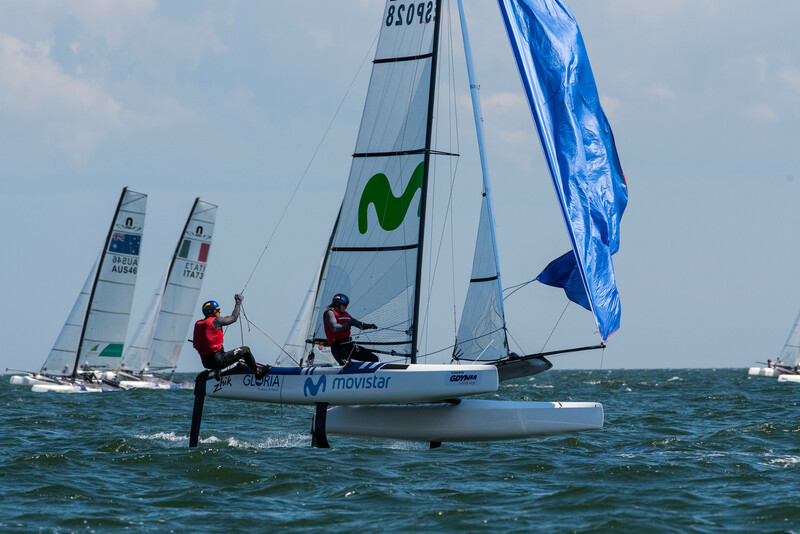 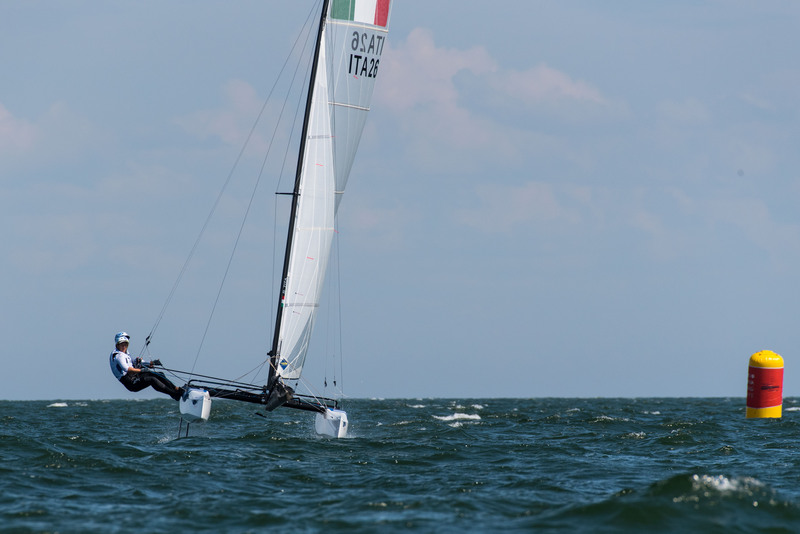 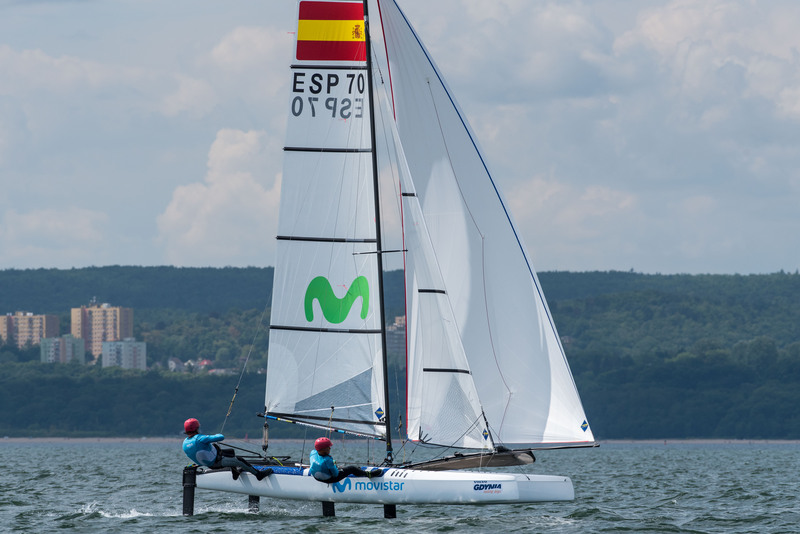 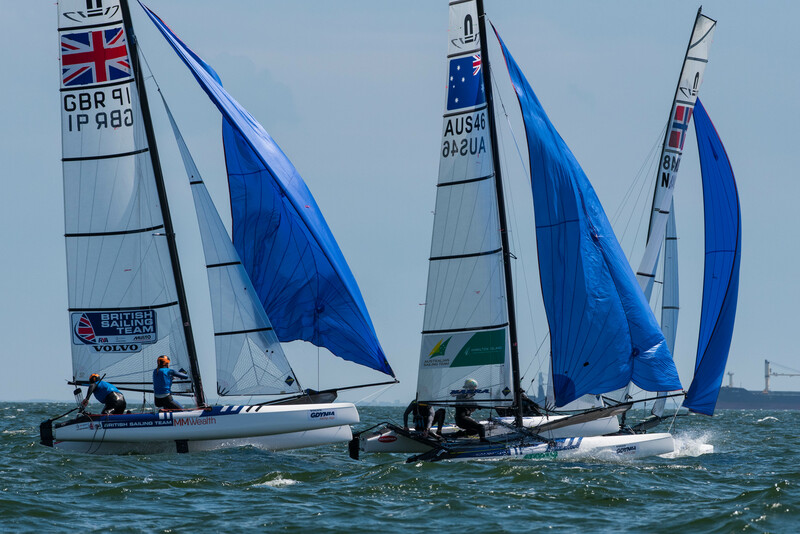 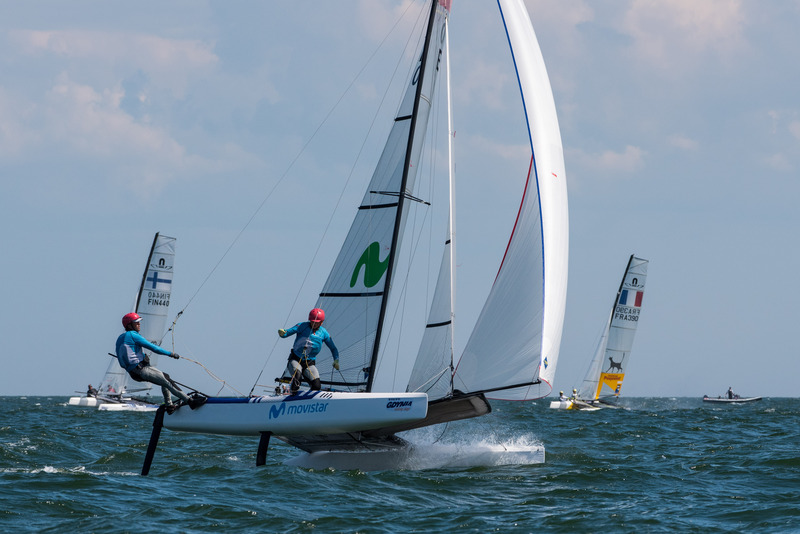 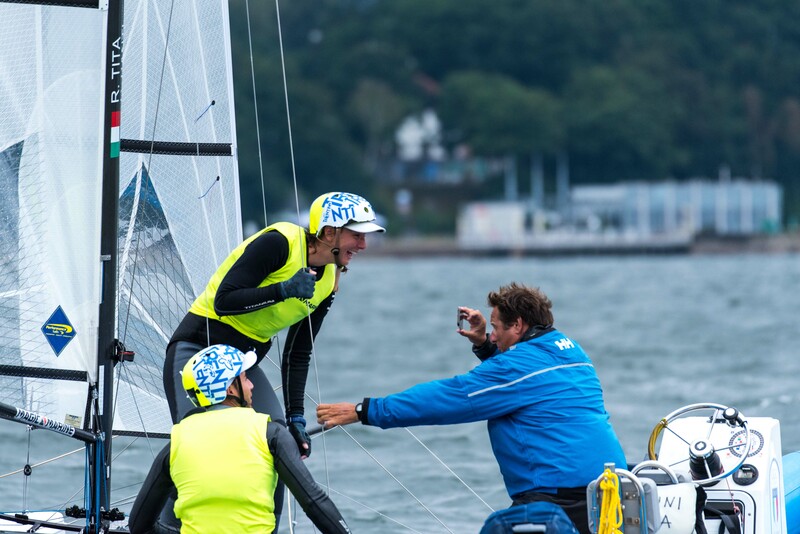 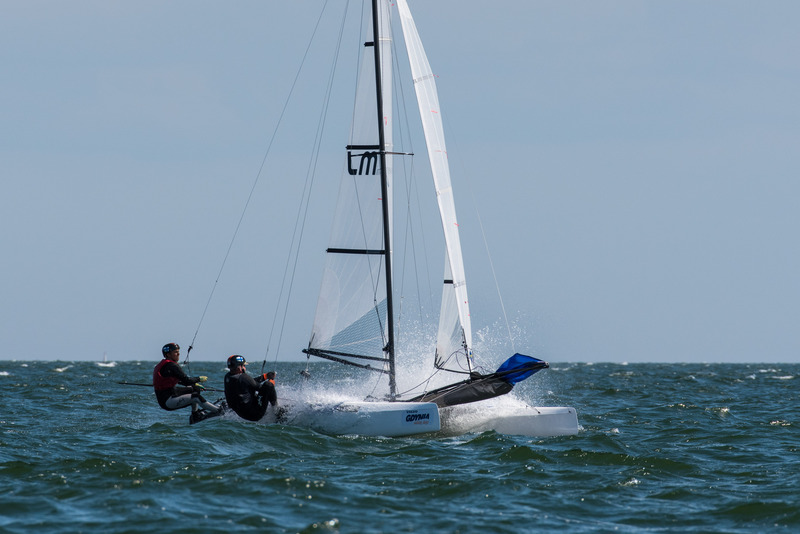 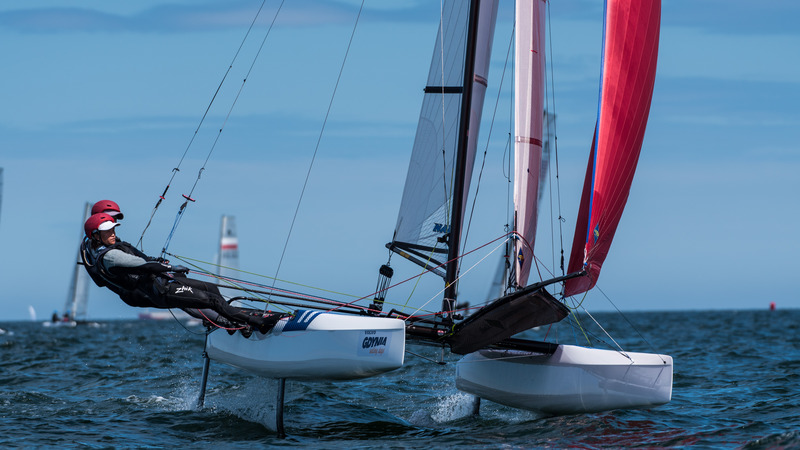 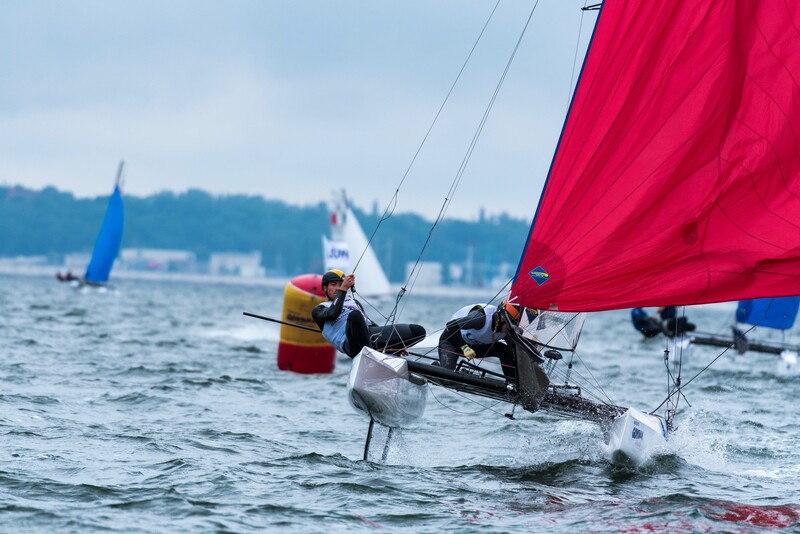 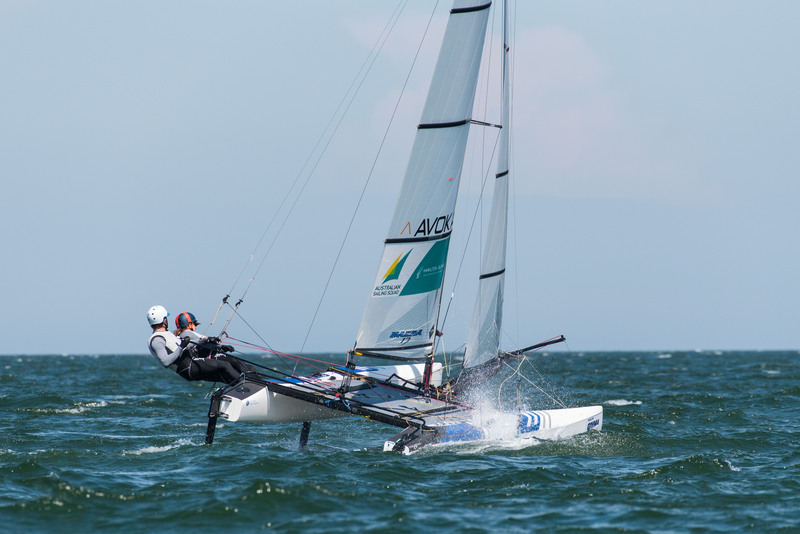 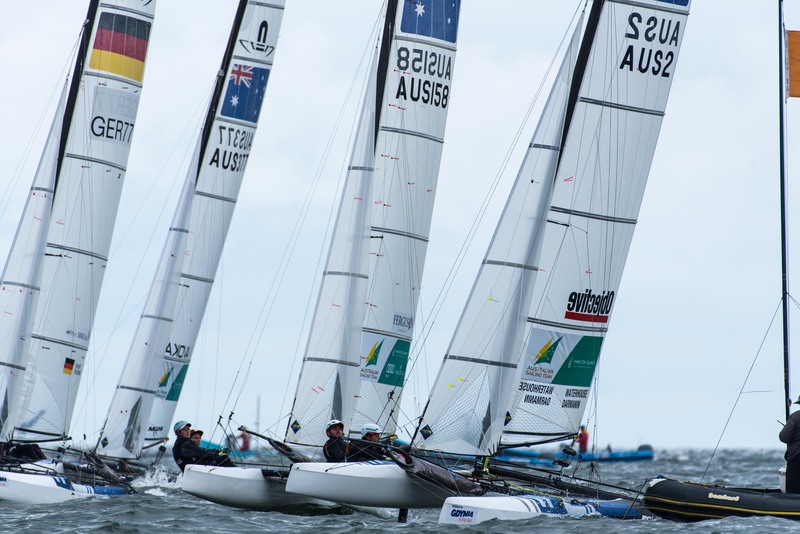 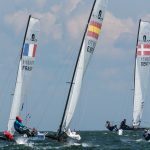 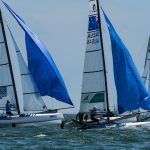 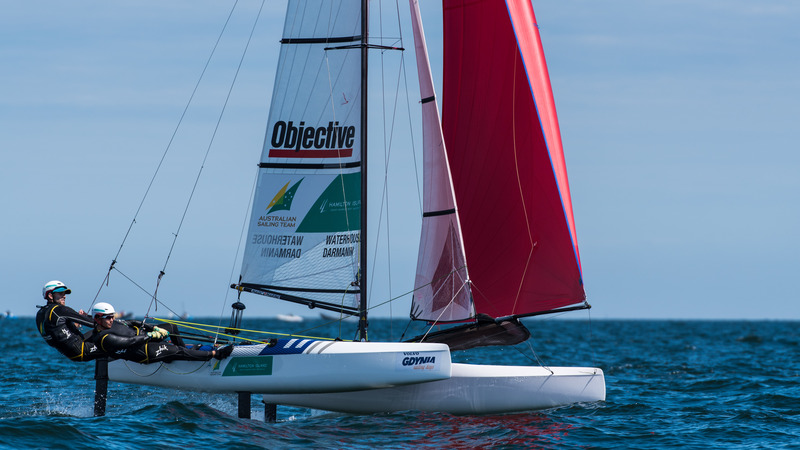 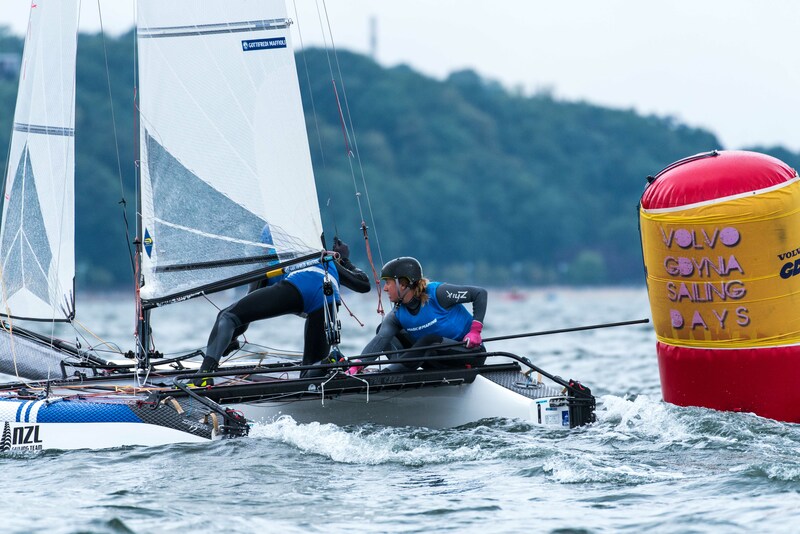 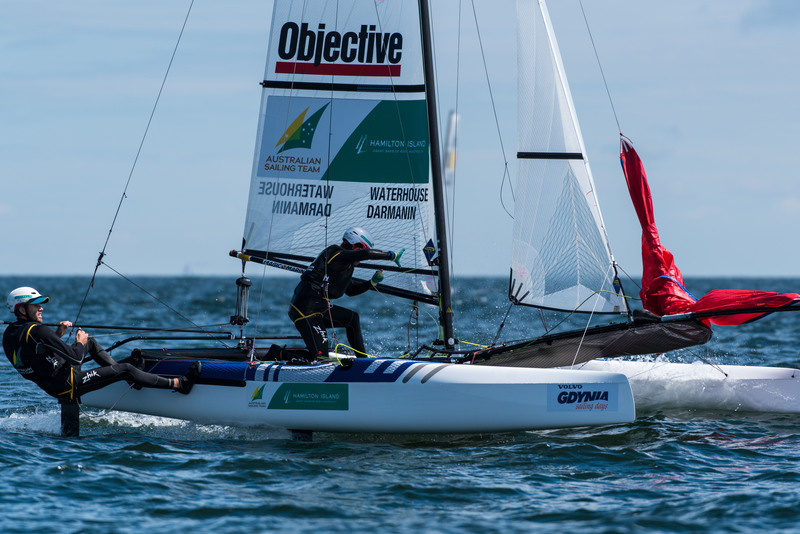 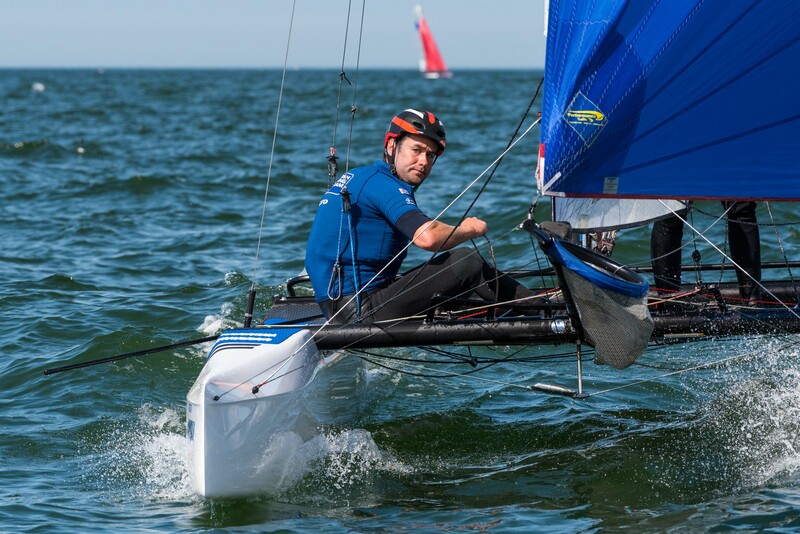 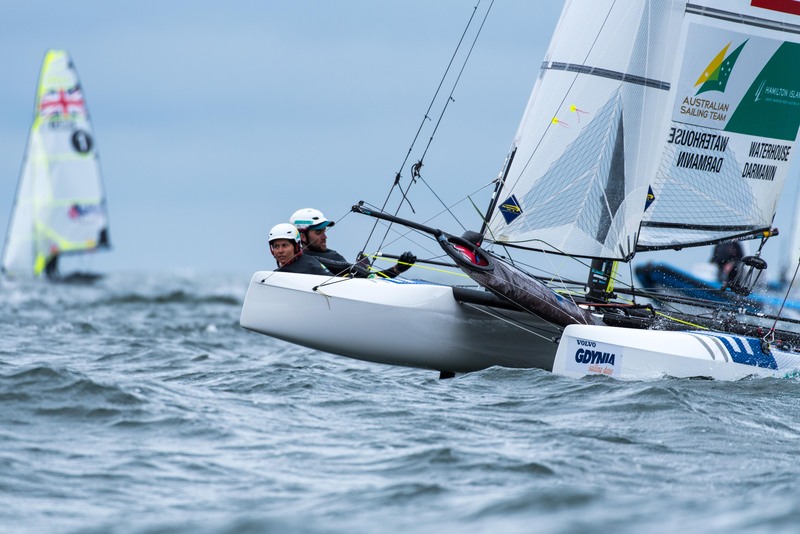 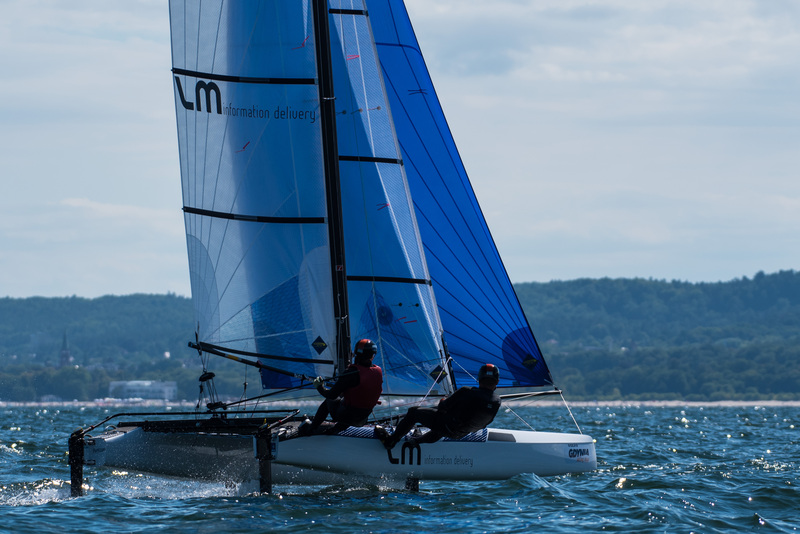 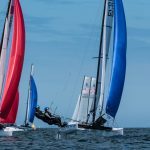 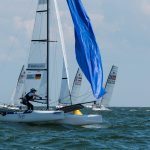 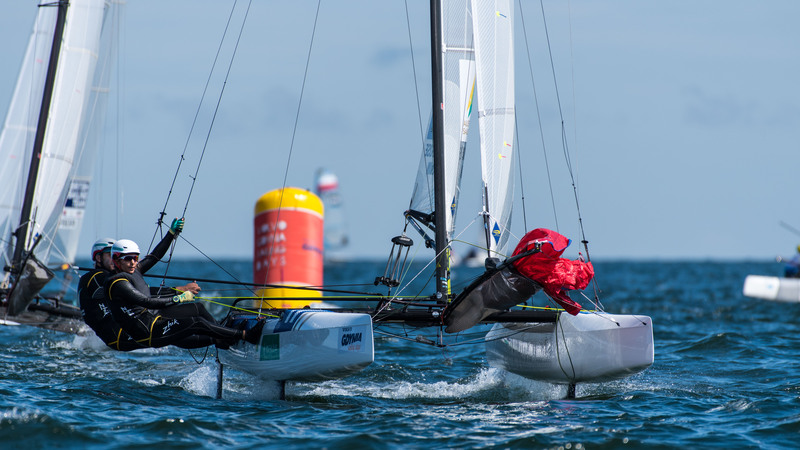 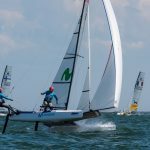 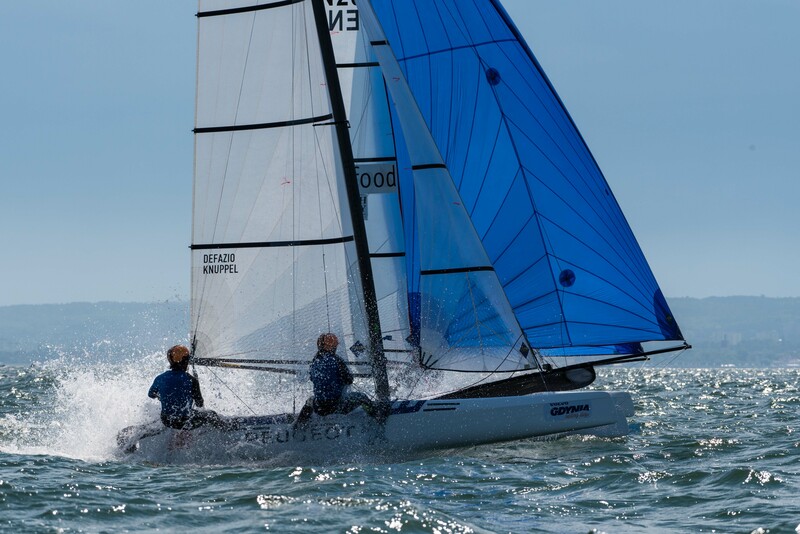 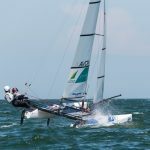 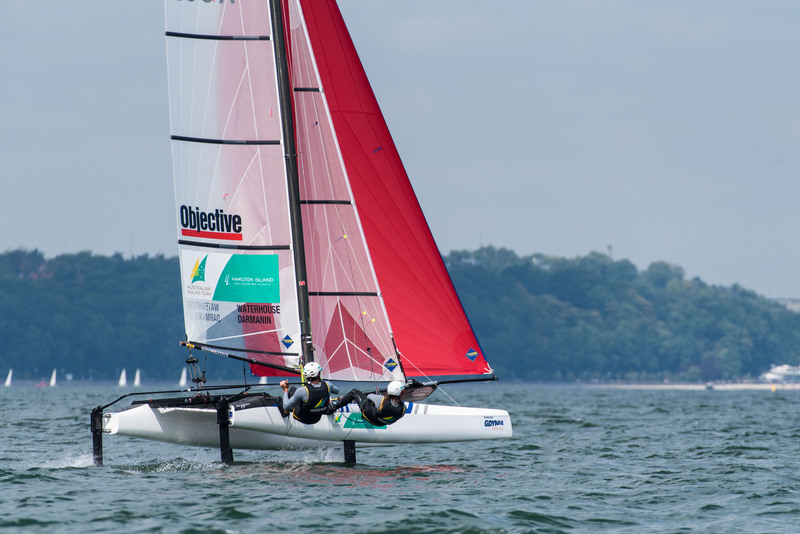 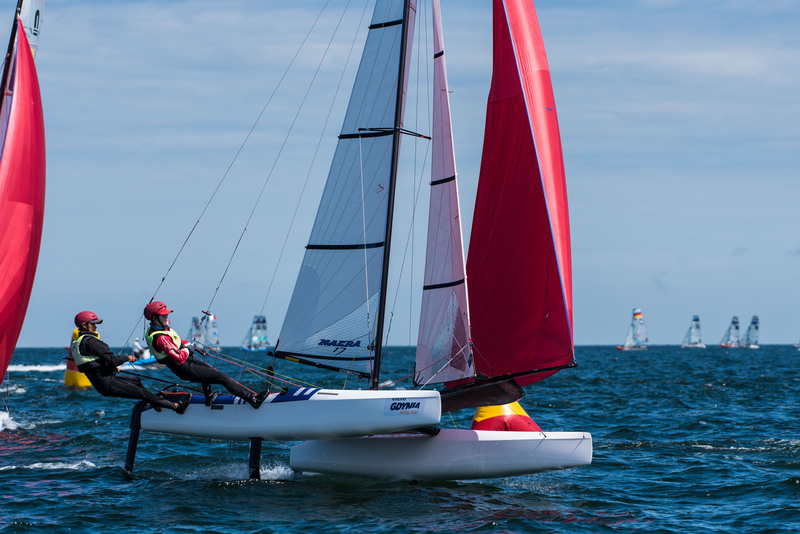 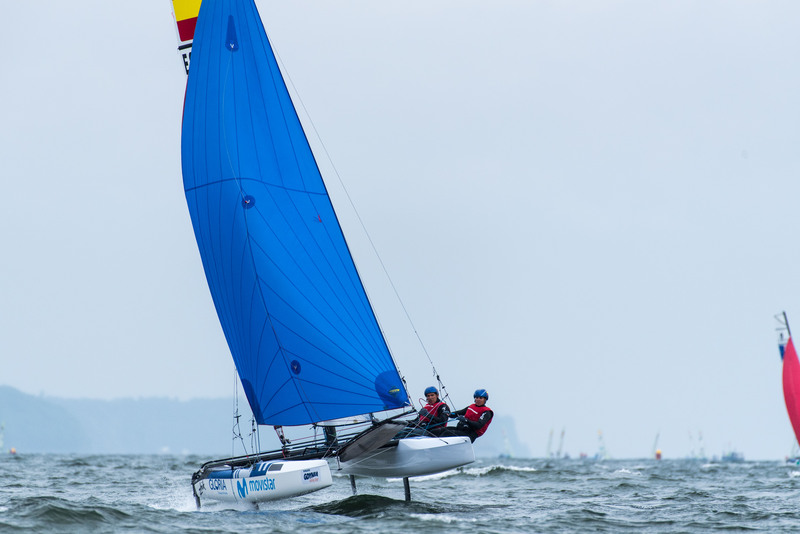 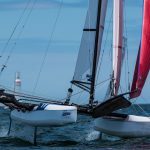 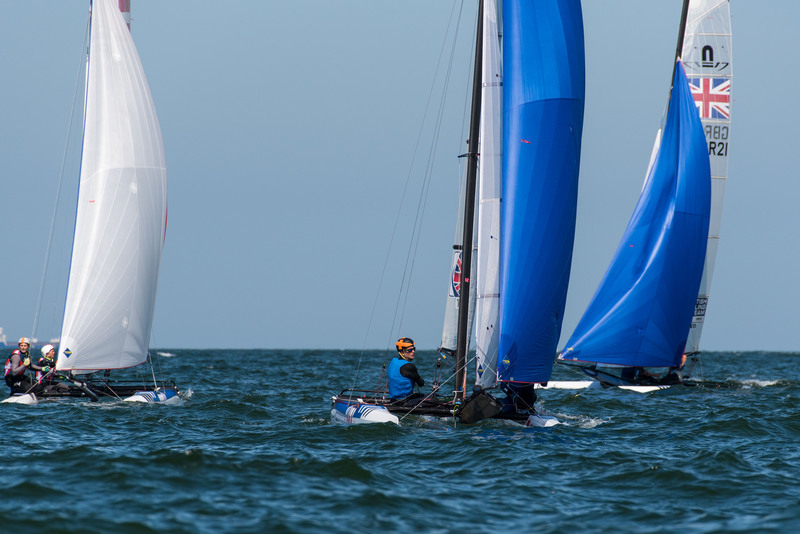 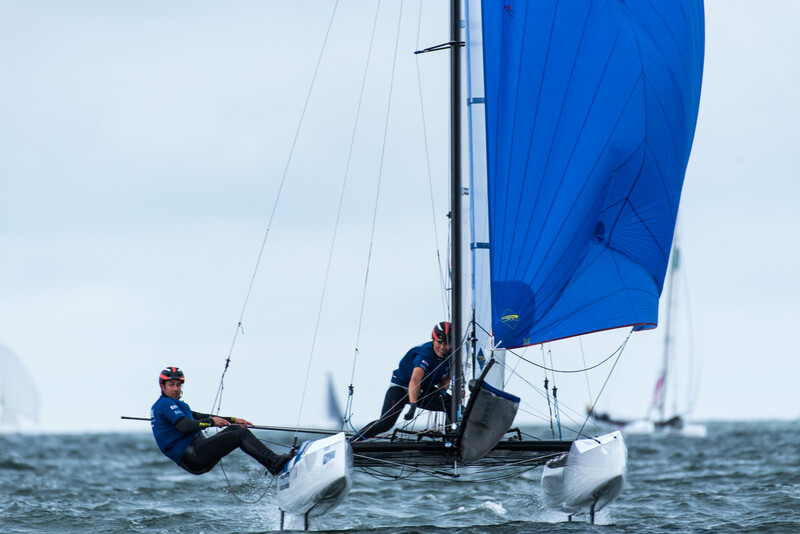 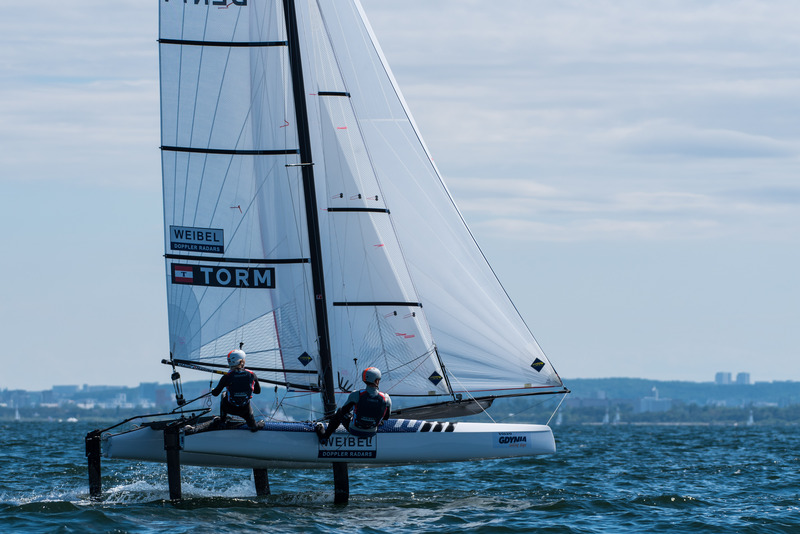 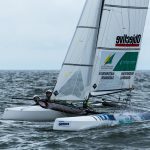 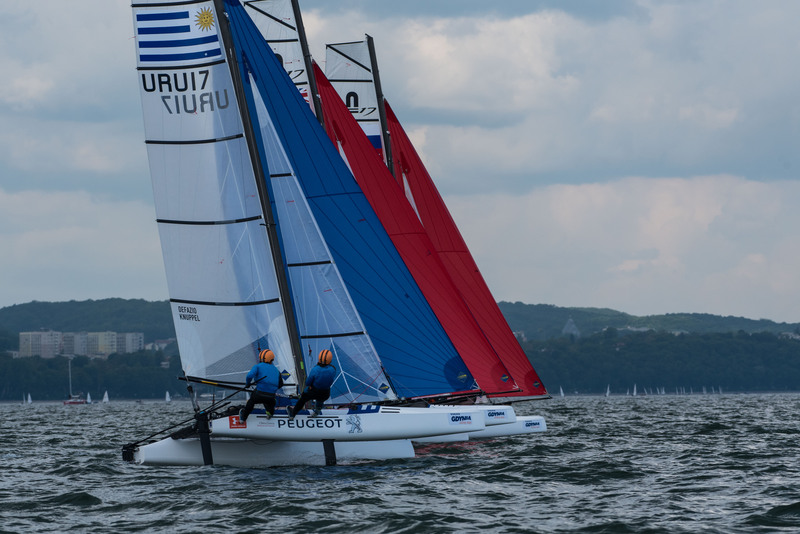 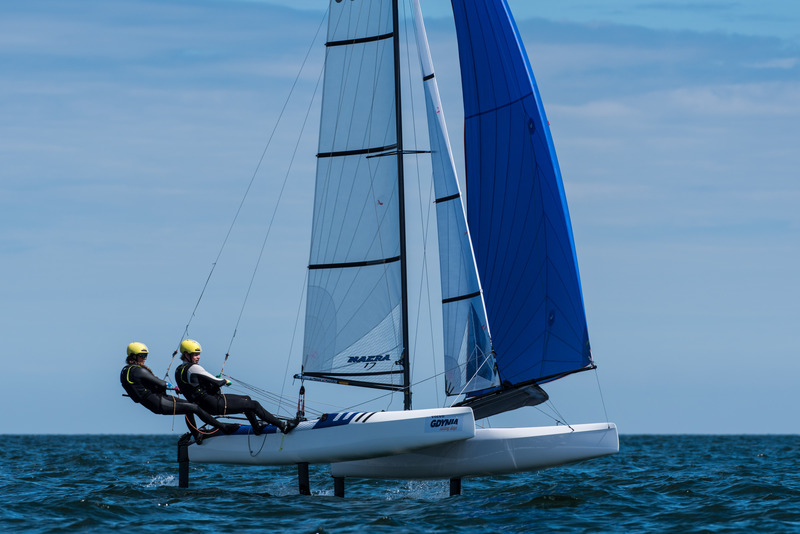 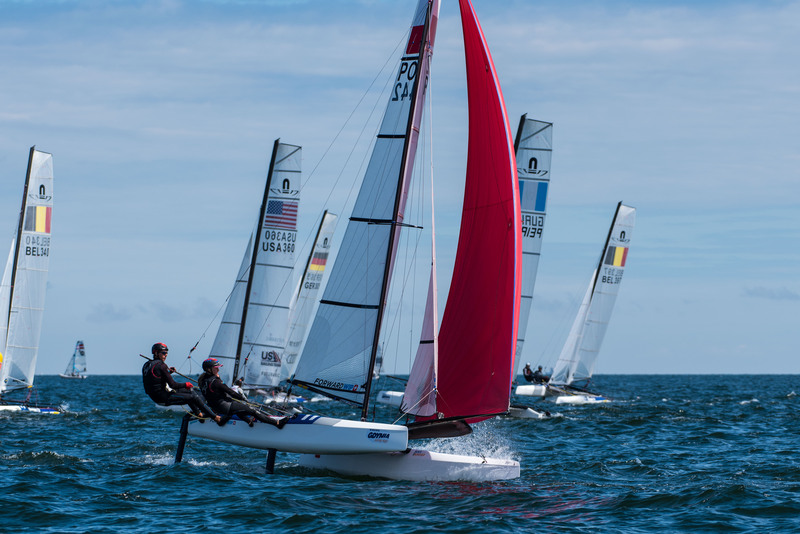 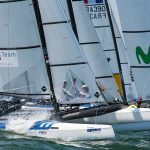 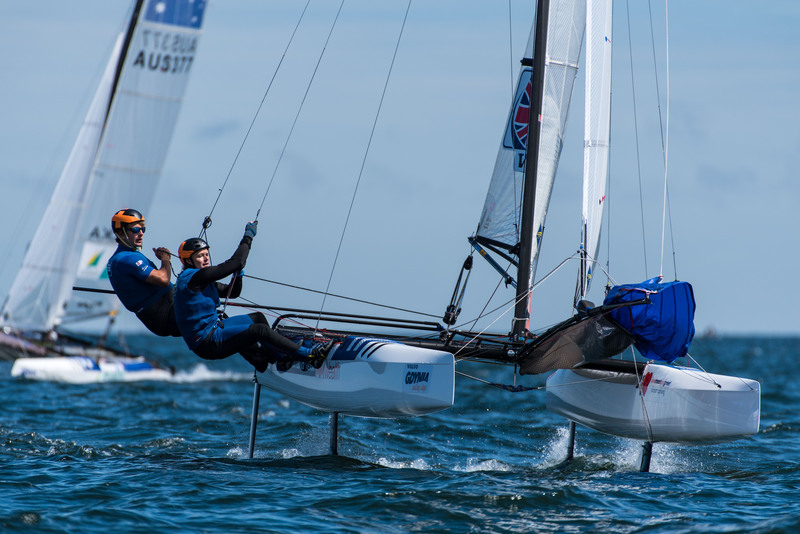 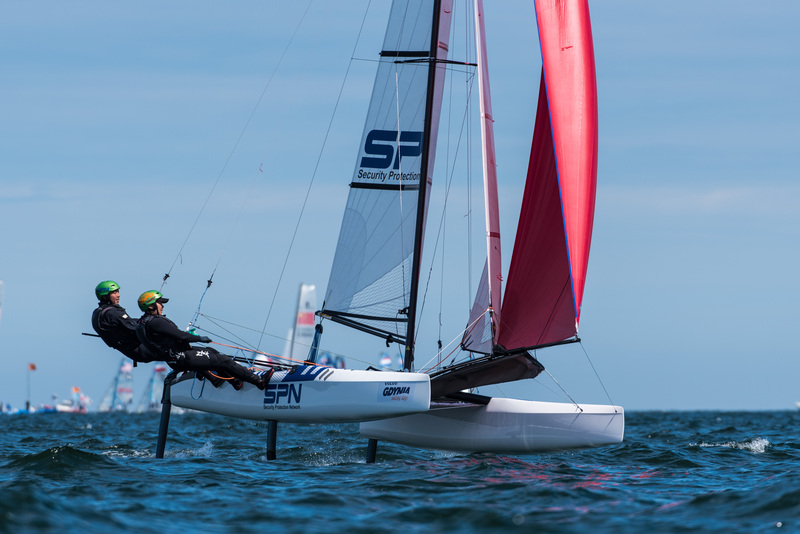 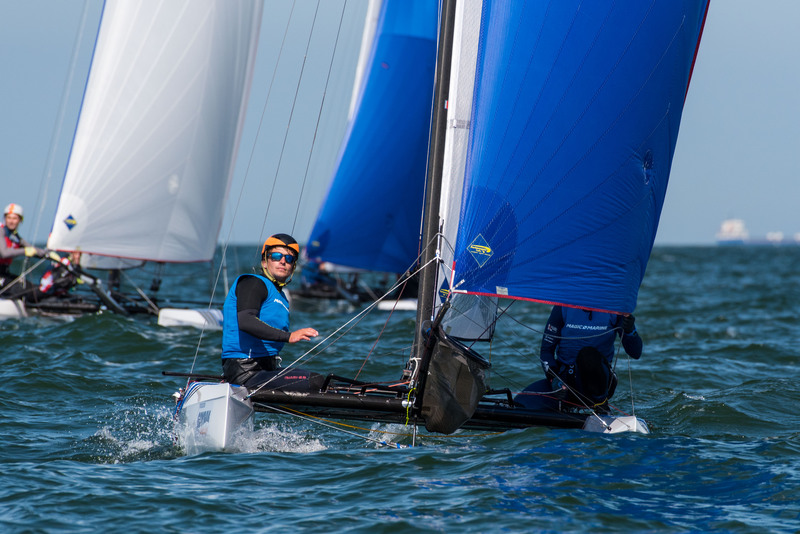 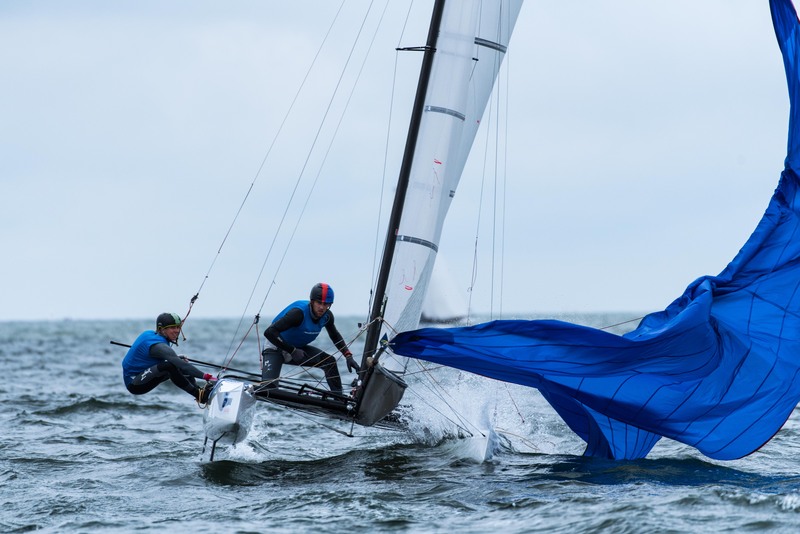 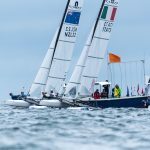 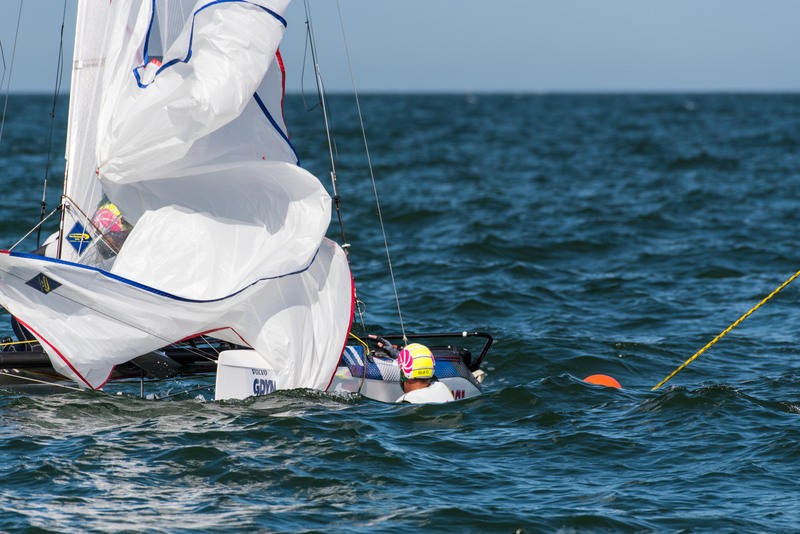 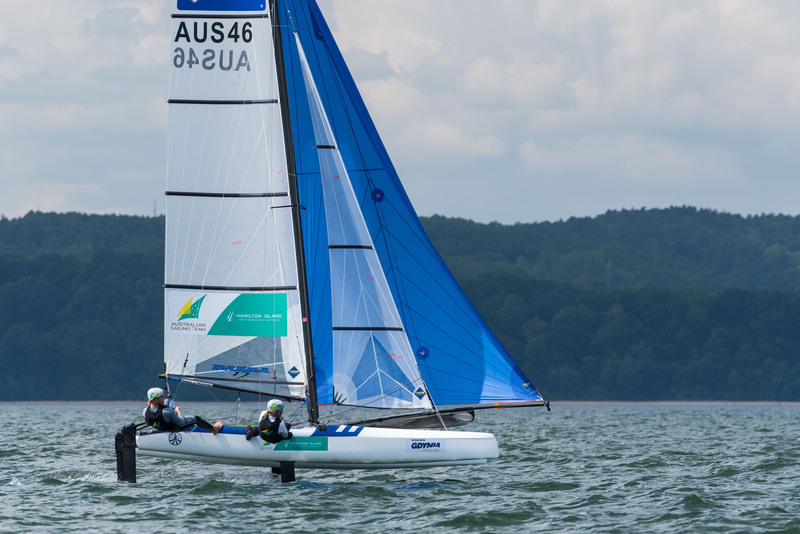 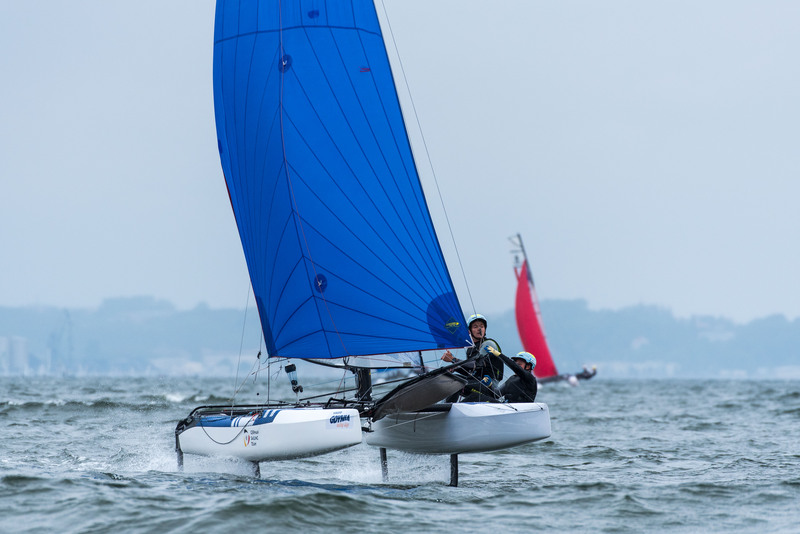 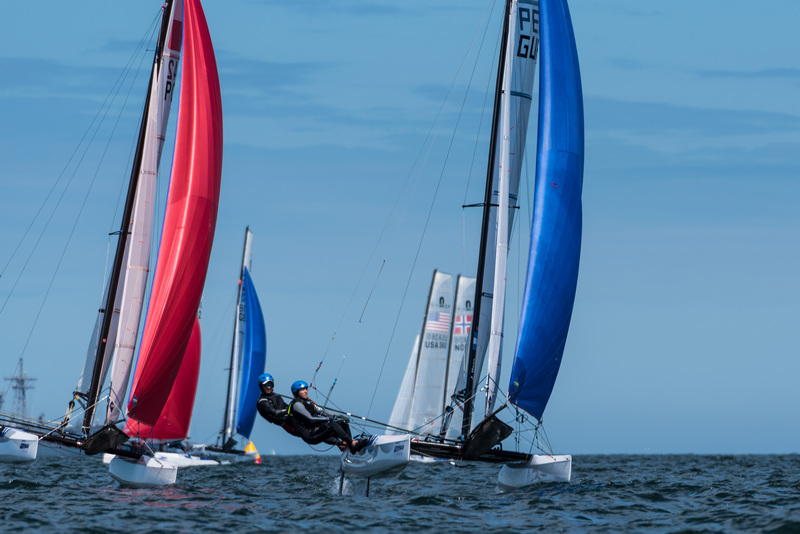 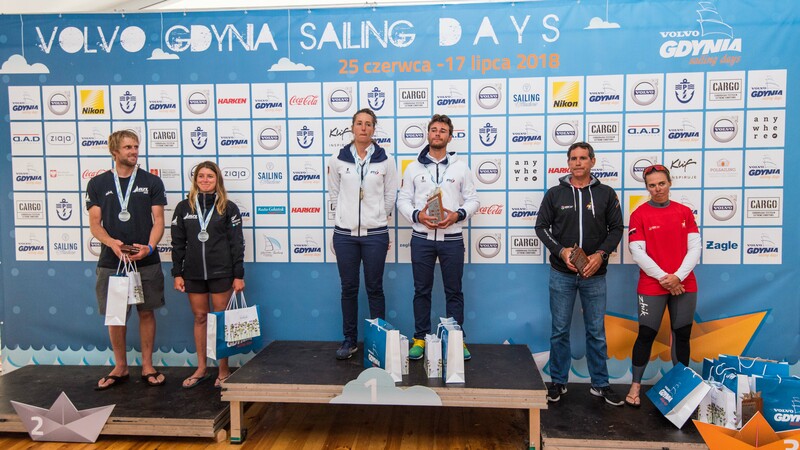 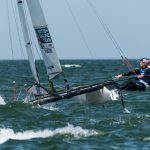 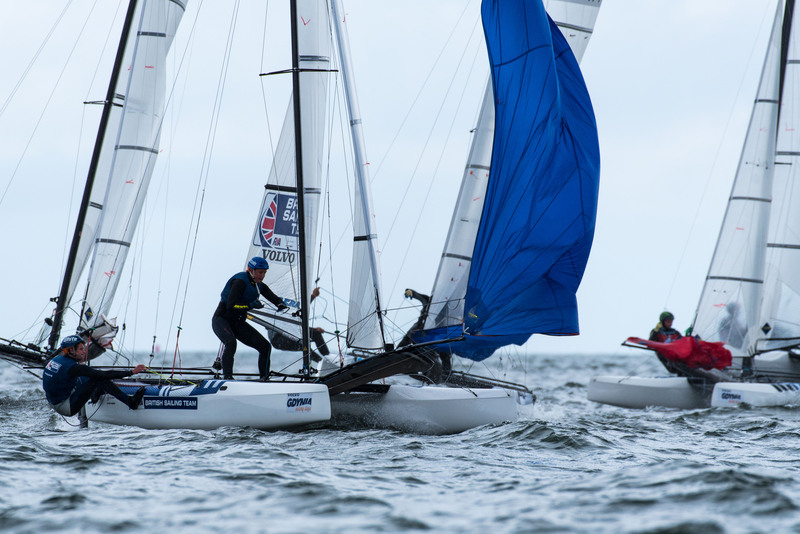 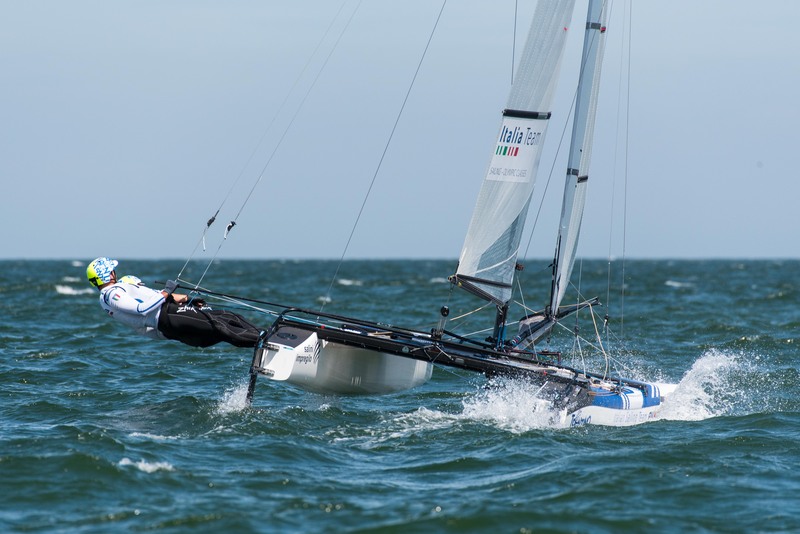 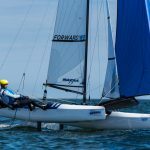 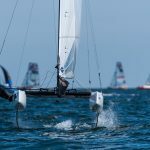 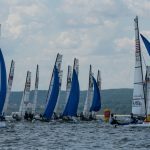 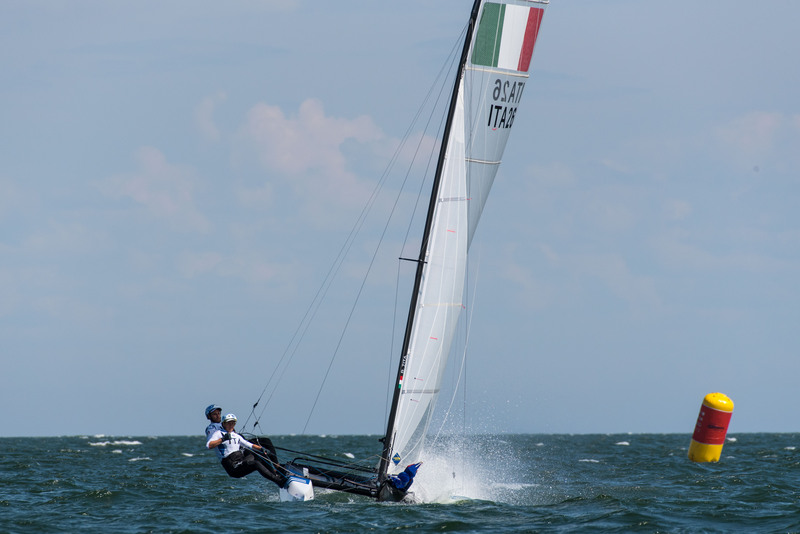 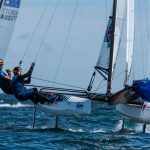 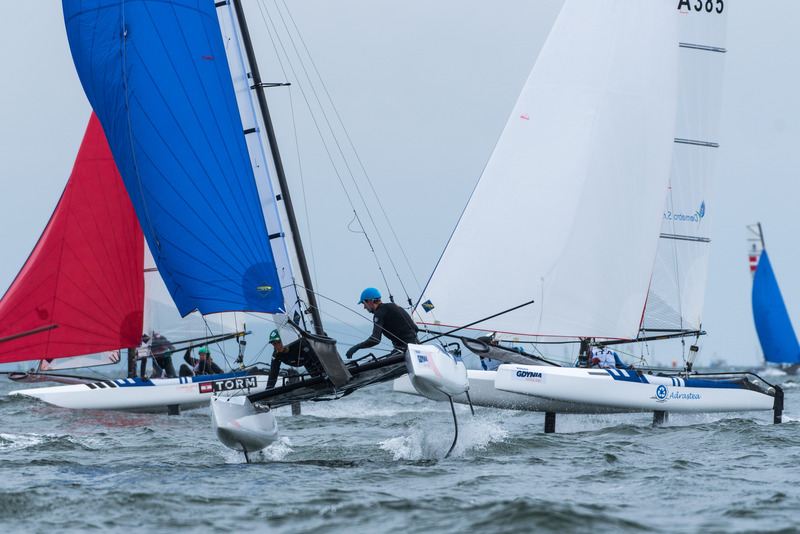 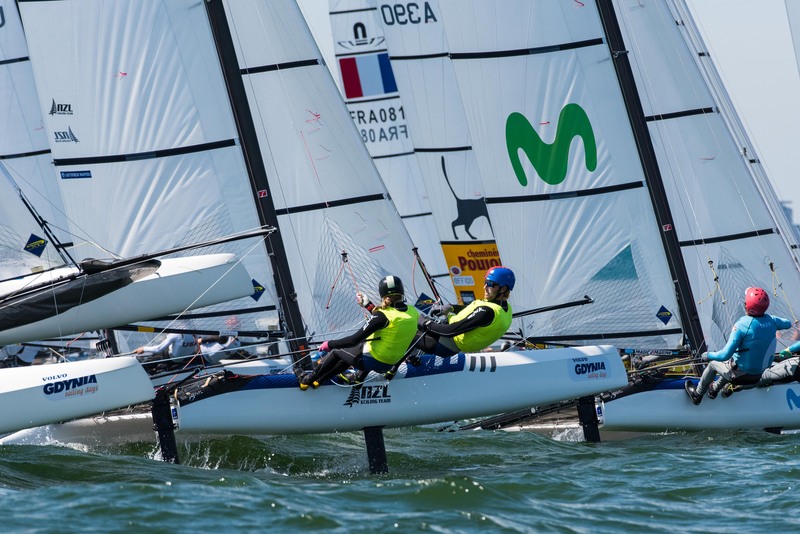 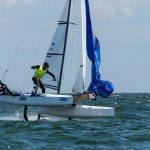 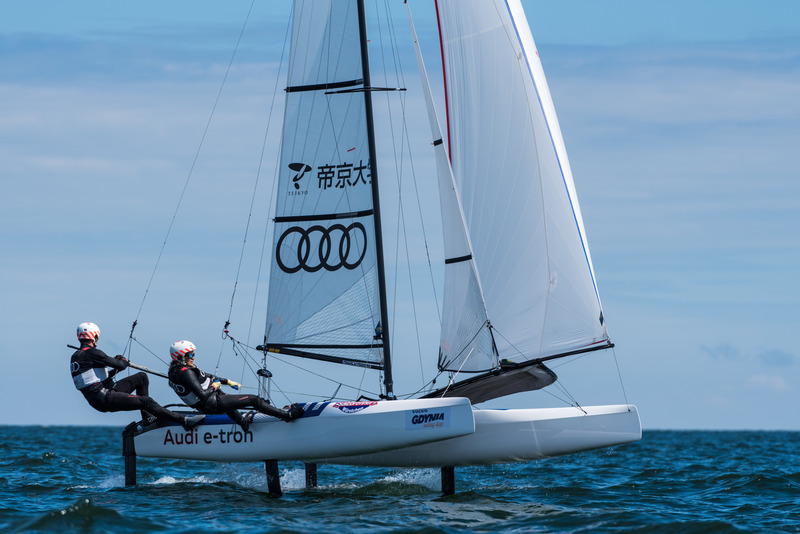 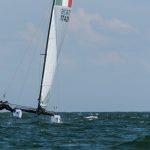 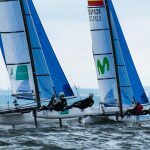 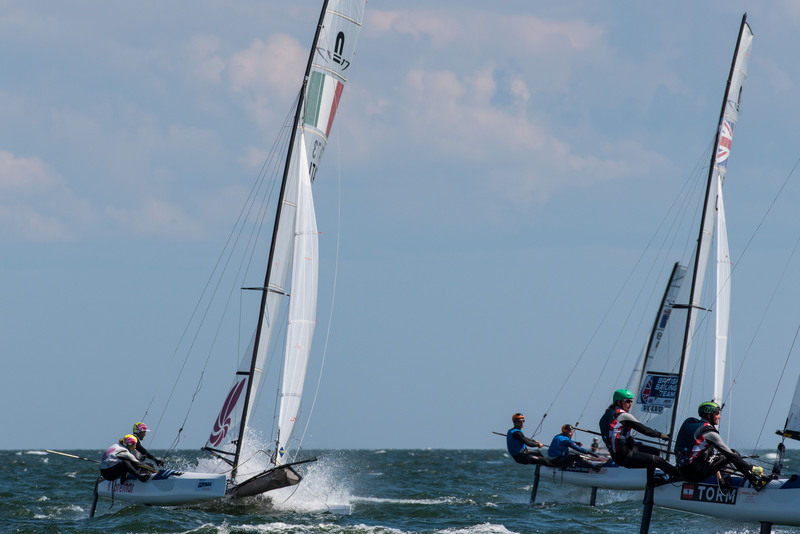 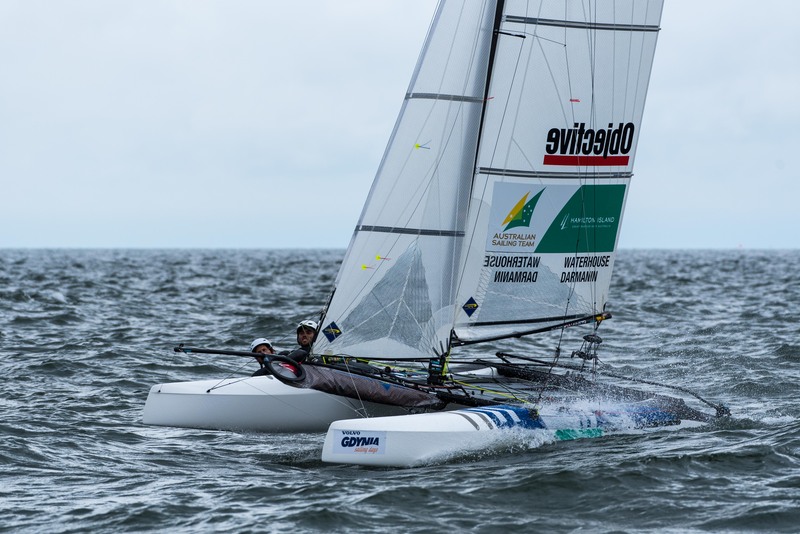 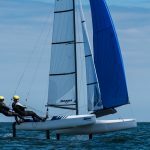 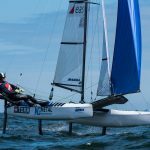 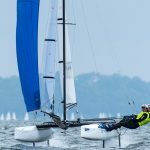 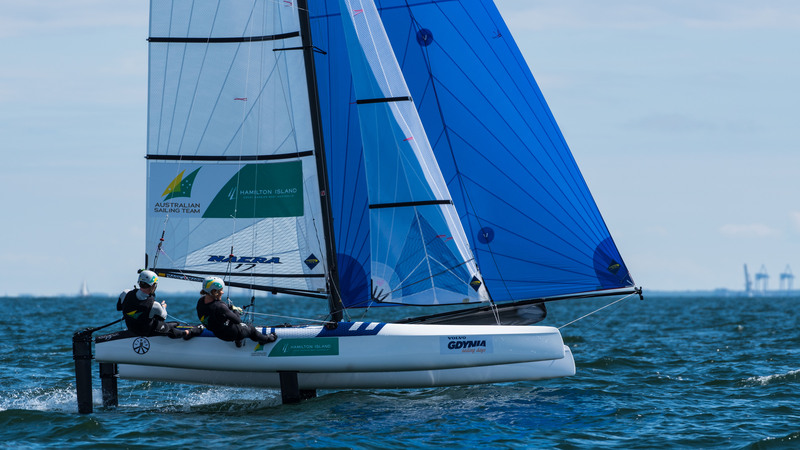 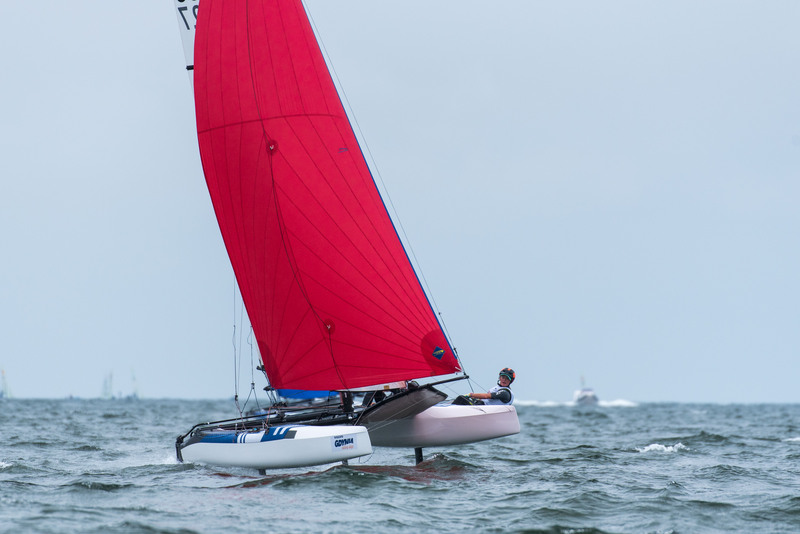 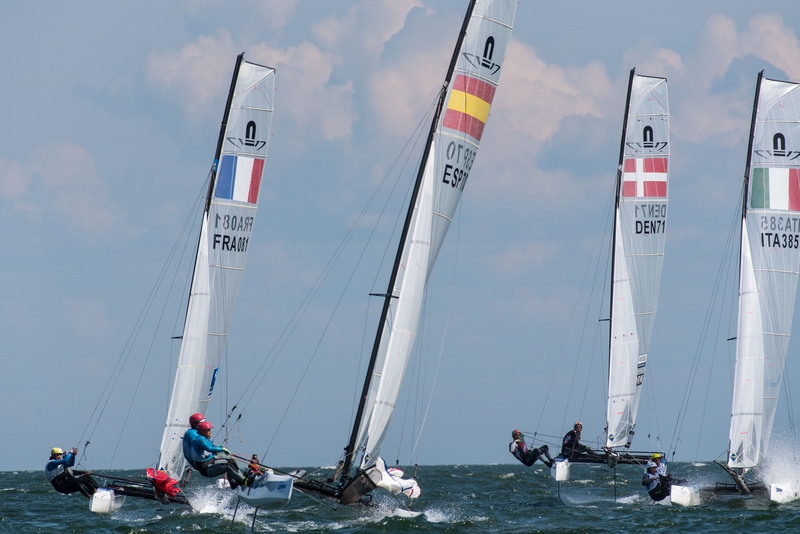 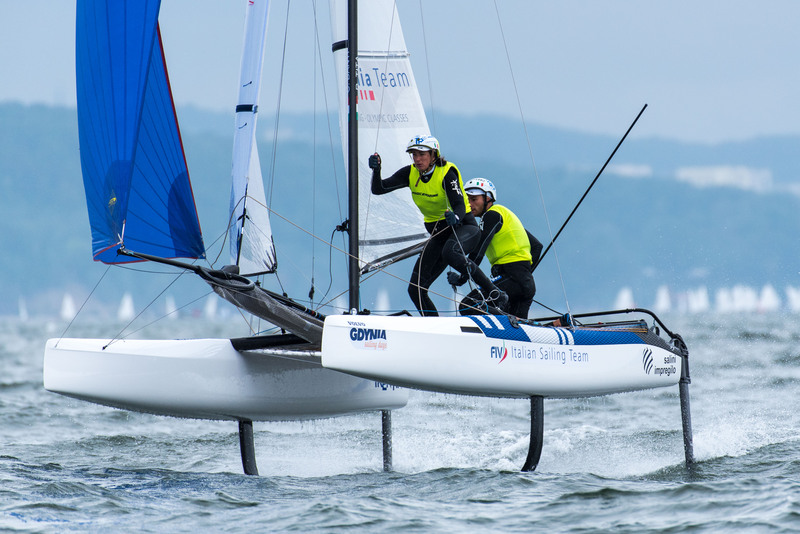 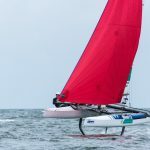 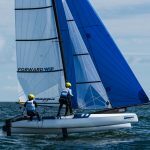 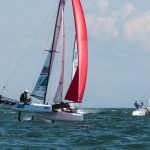 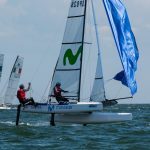 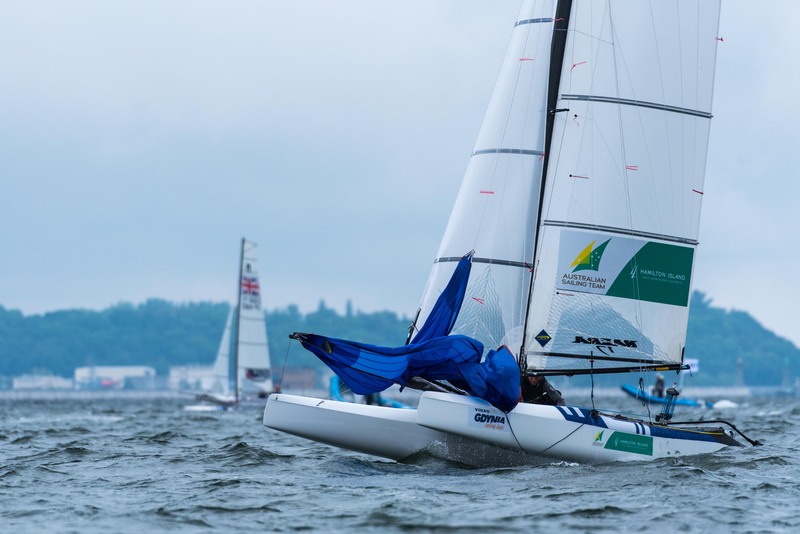 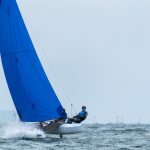 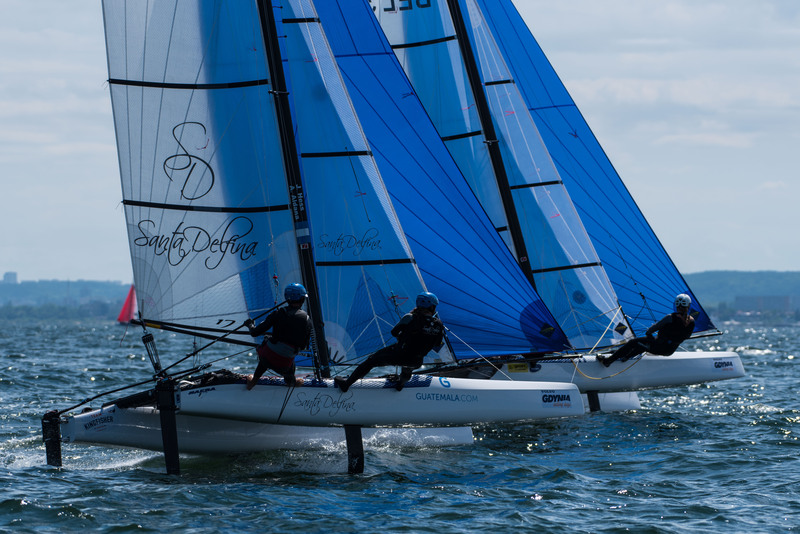 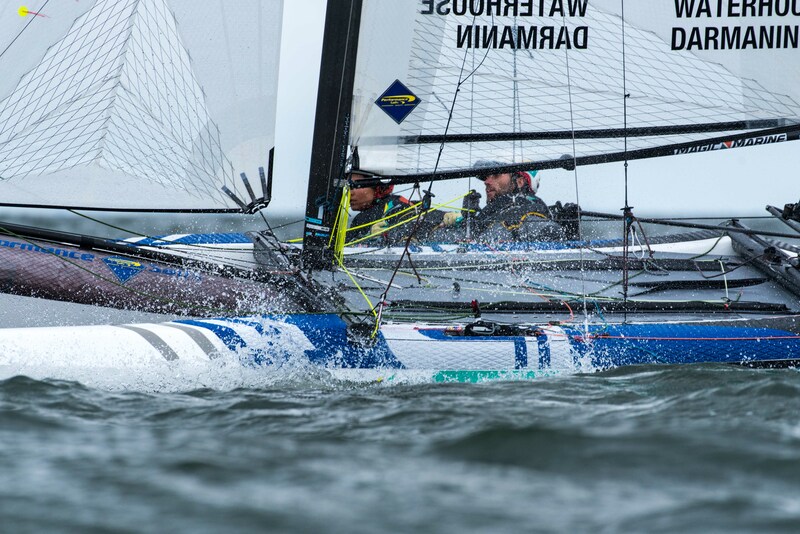 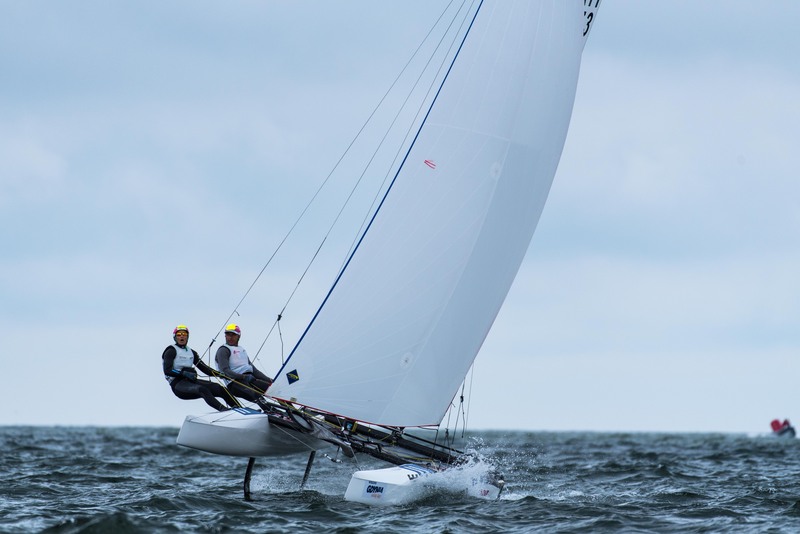 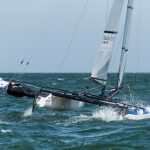 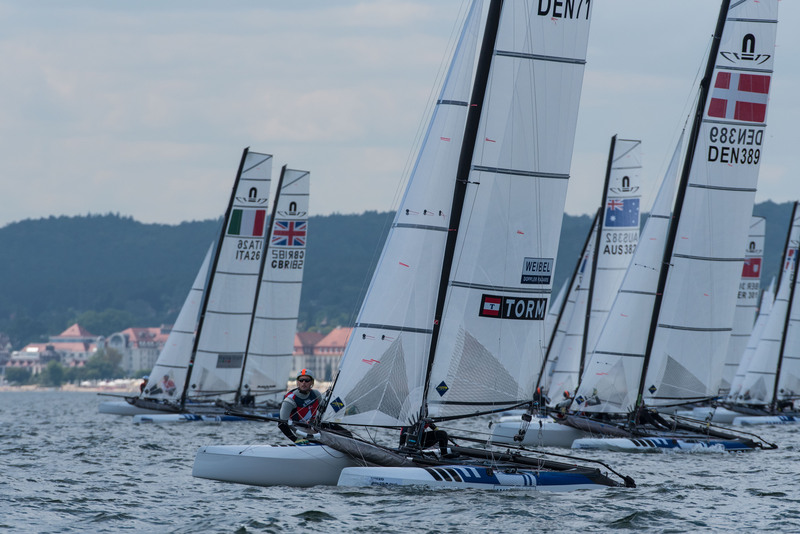 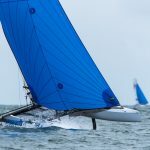 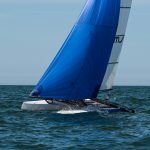 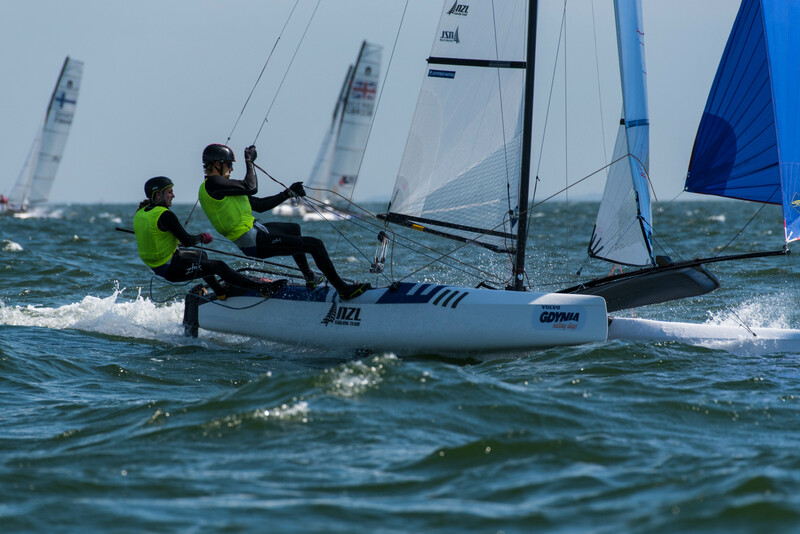 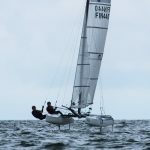 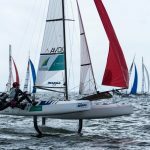 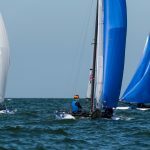 The two Nacra 17 qualifying fleets suffered the worst at the hands of capricious breeze and lumpy chop, with multiple recalls and race abandonments calling an end to the foiling catamarans’ day after scoring just one race in both qualifying fleets. 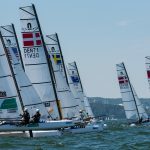 The usual suspects moved through easily to gold fleet with few changes on the day, though a few new faces will join Gold Fleet tomorrow. 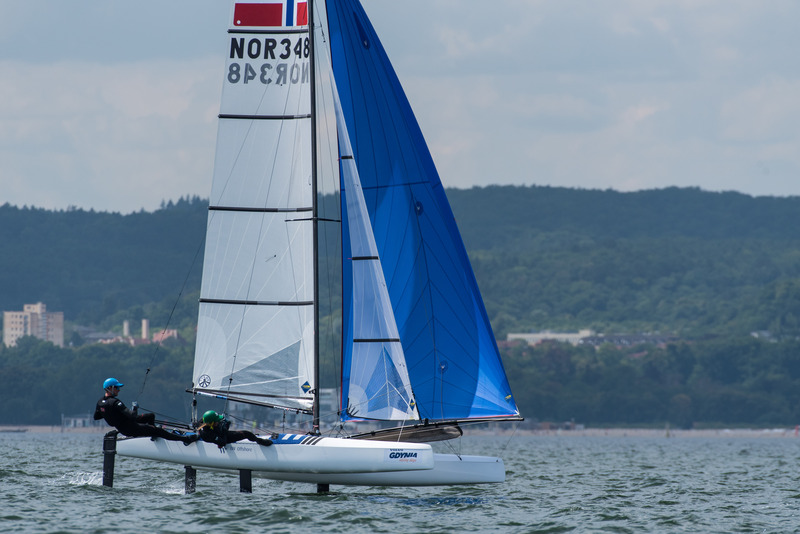 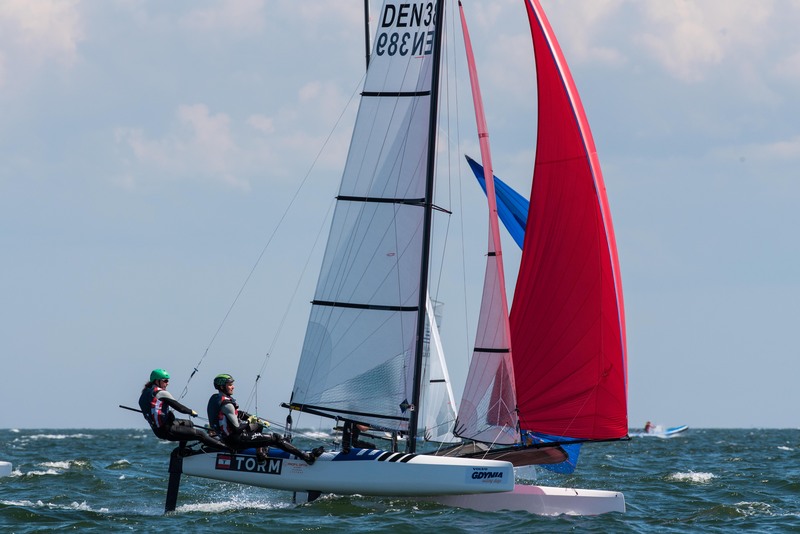 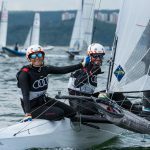 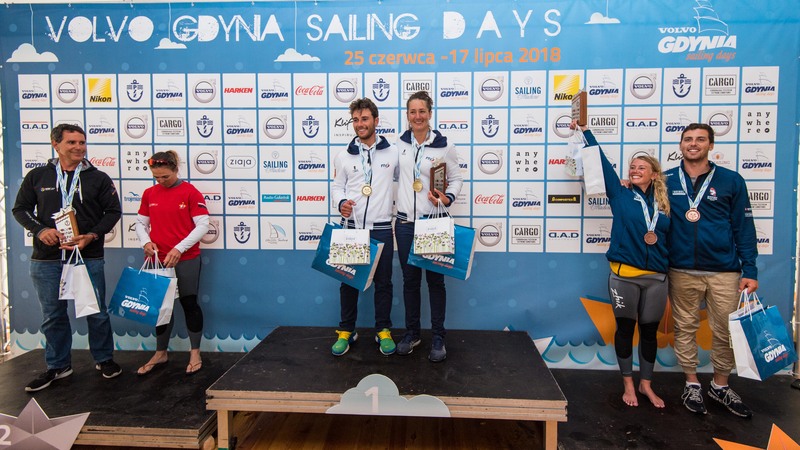 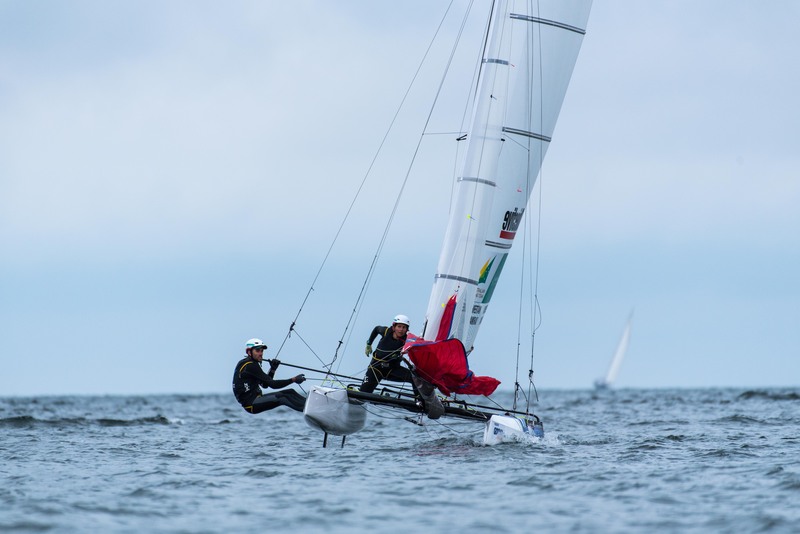 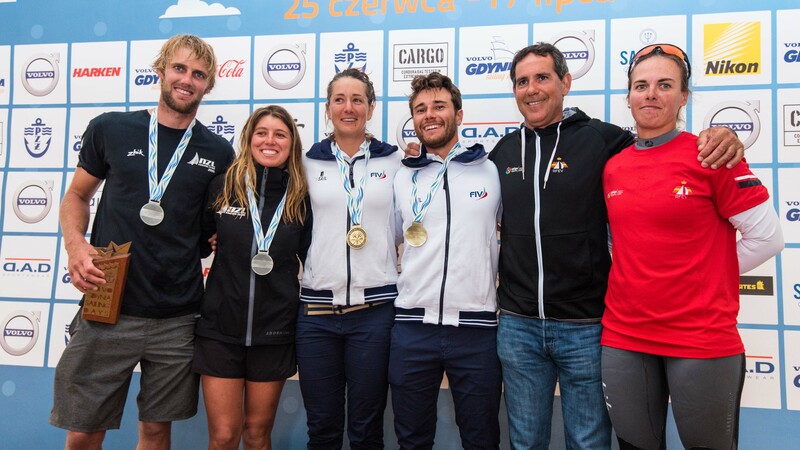 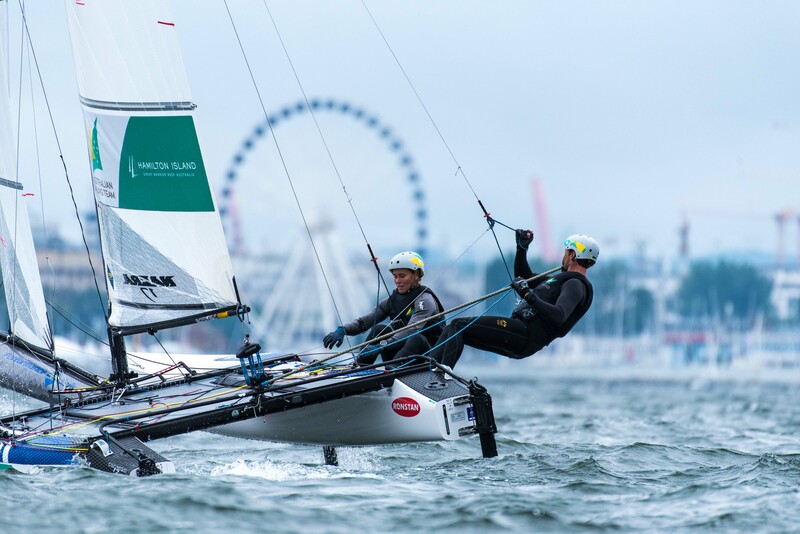 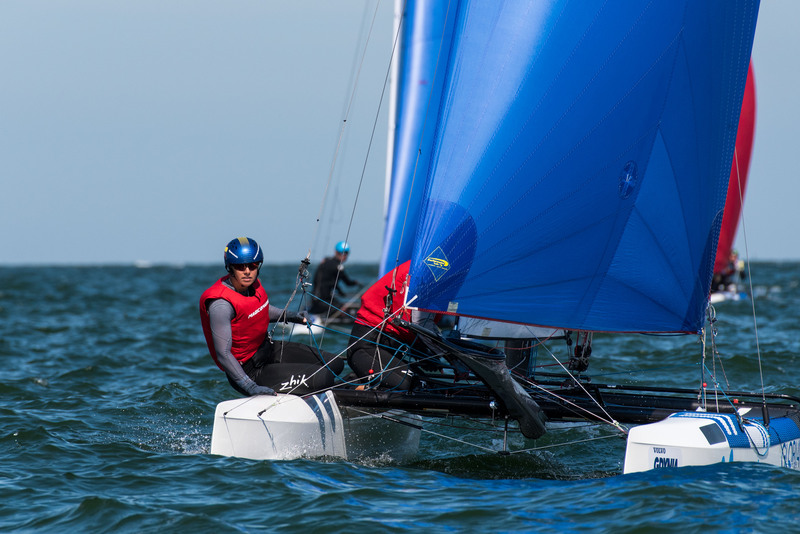 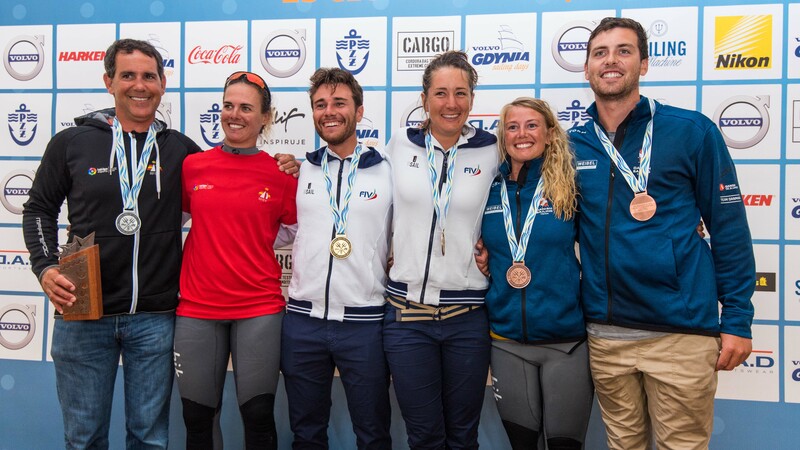 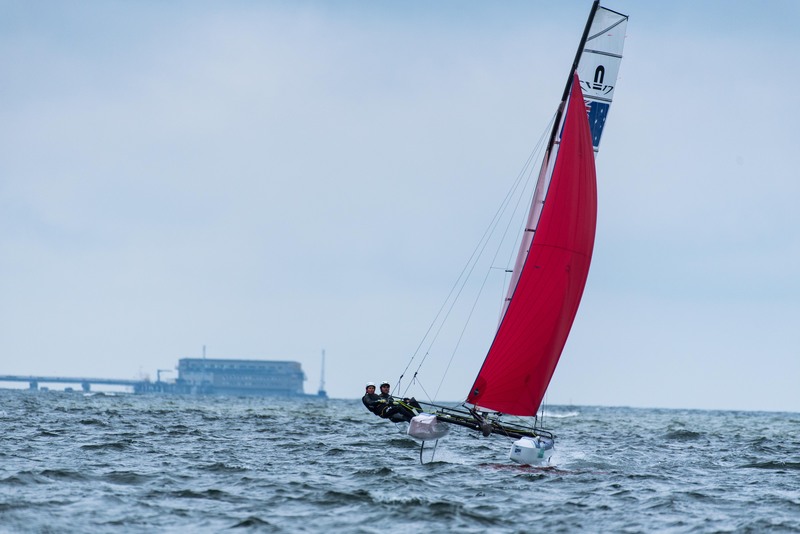 Despite sailing in the Nacra together for 5 years, top Norwegians Nicholas Martinsen and Martine Mortensen were all smiles when they found out they’d not only made their first Gold Fleet at Europeans, but they’d made it comfortably, in 20th place. 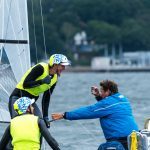 “It’s great to finally get some results, to be up there,” said Mortensen. 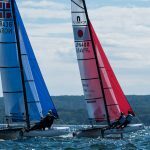 Martinsen said they’d made big changes to their campaign this winter, and they are really making a difference. 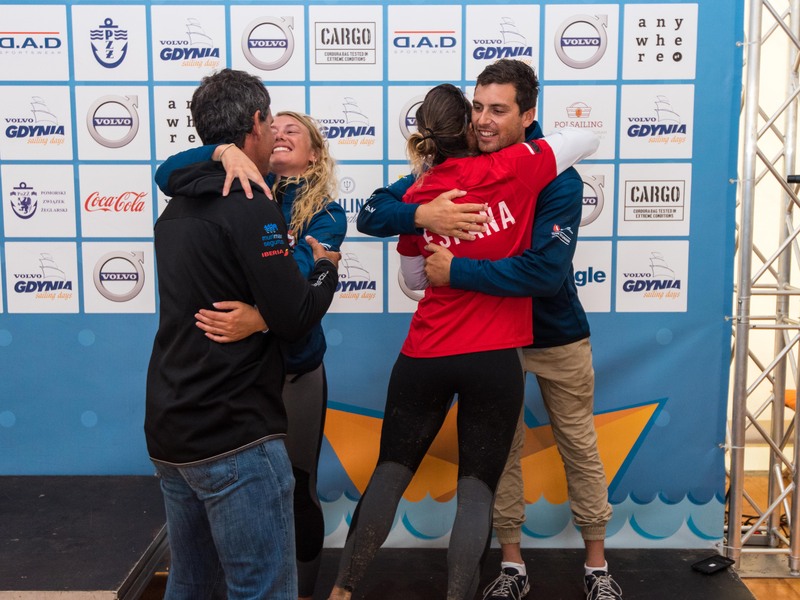 “For the first years we were all by ourselves with no partners or coaches,” he explained. 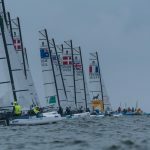 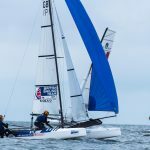 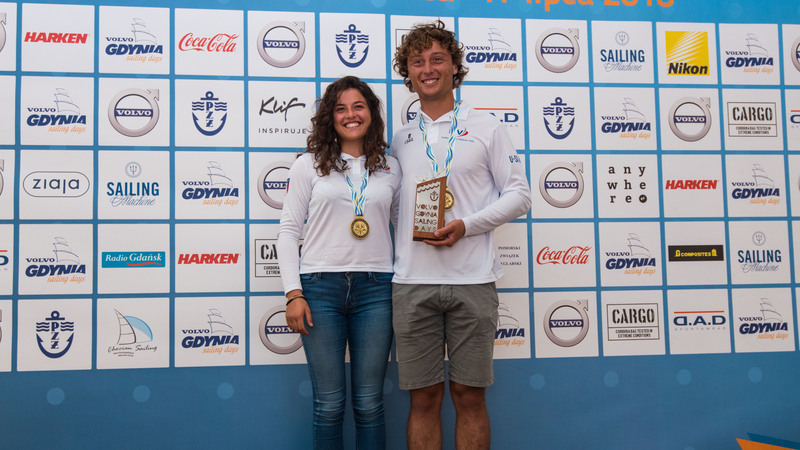 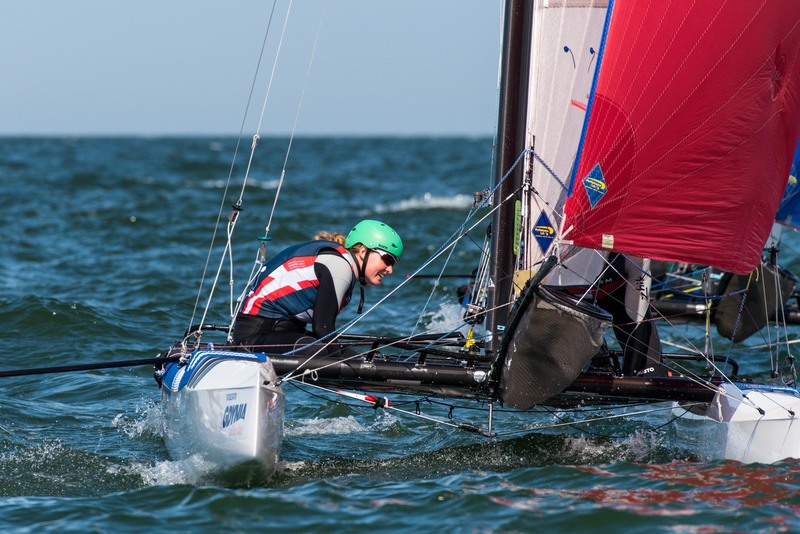 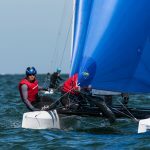 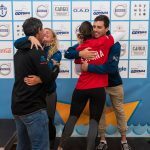 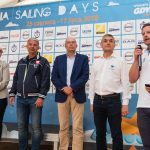 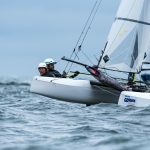 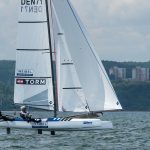 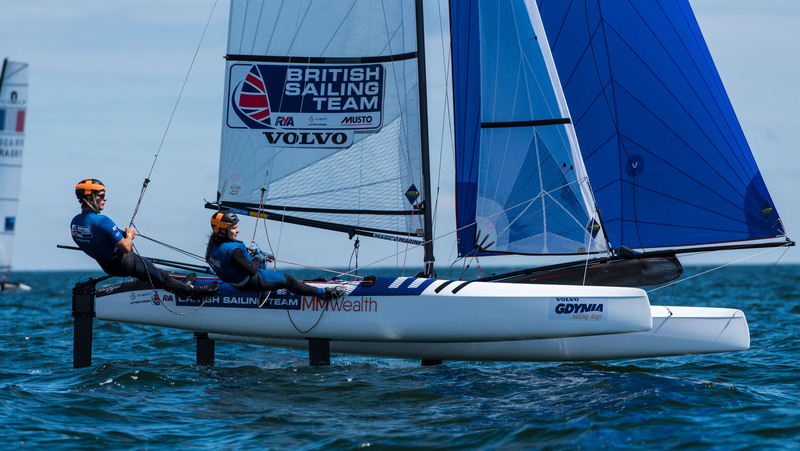 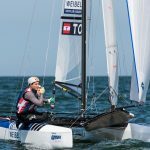 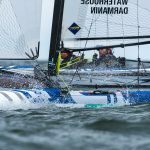 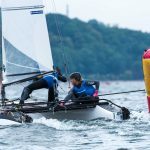 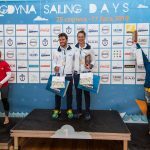 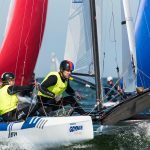 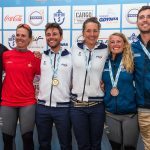 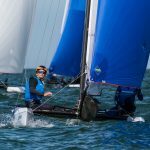 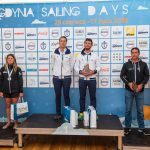 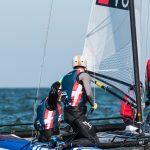 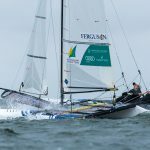 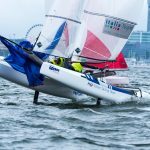 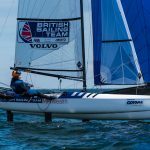 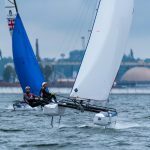 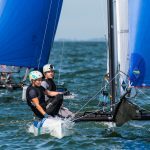 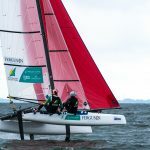 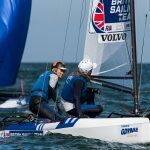 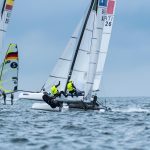 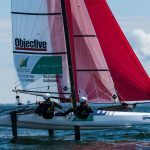 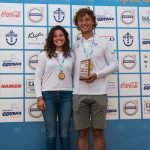 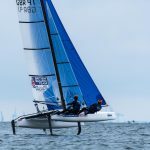 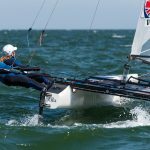 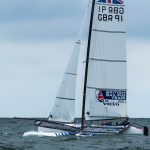 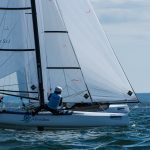 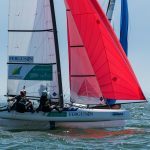 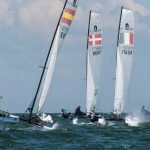 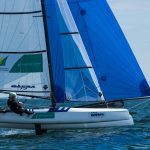 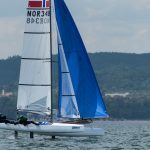 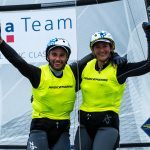 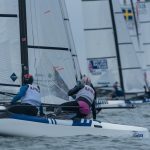 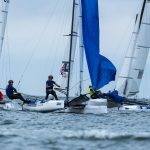 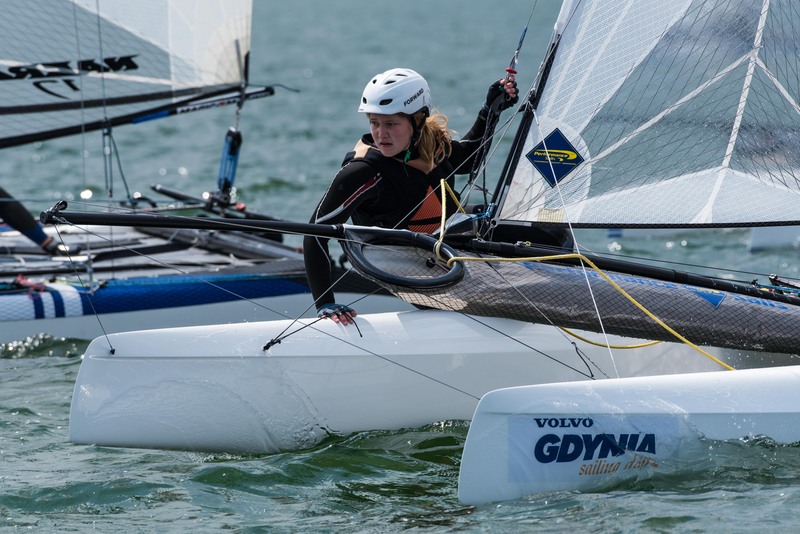 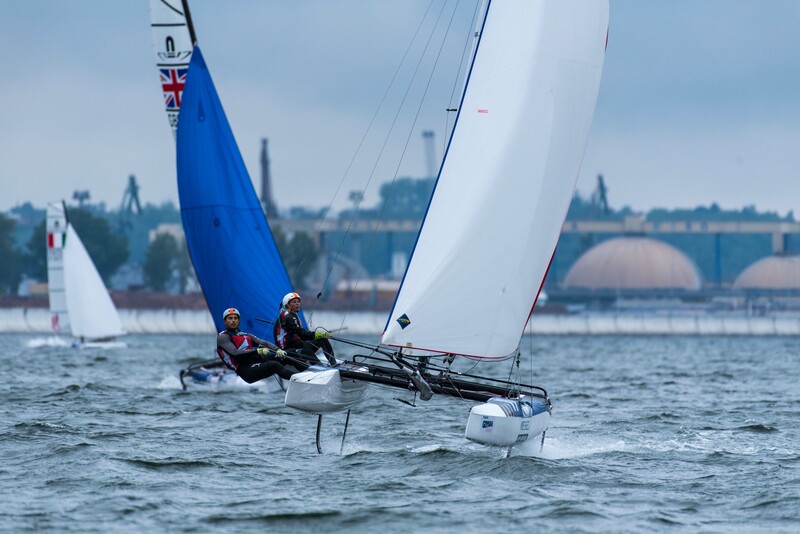 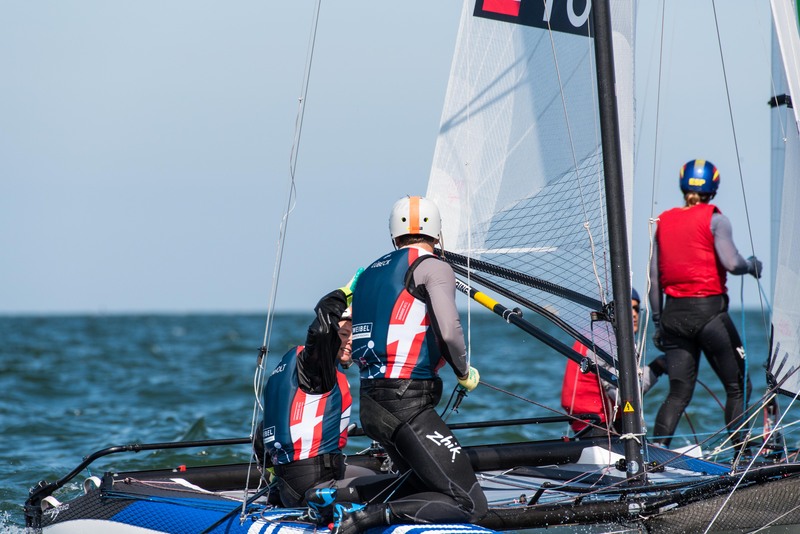 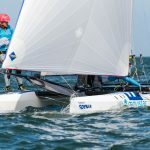 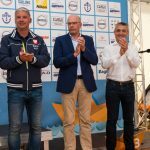 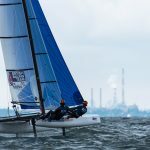 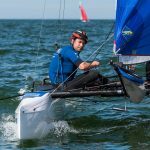 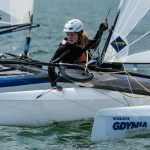 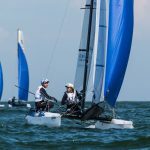 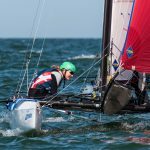 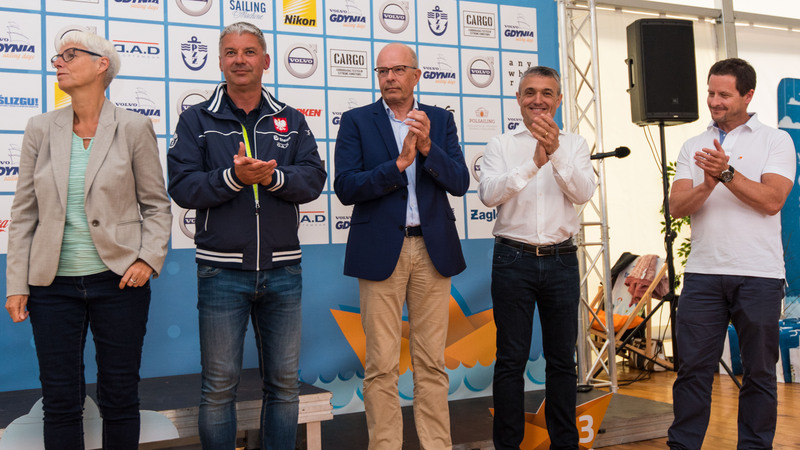 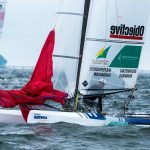 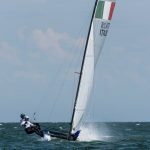 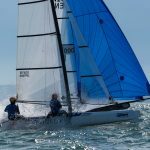 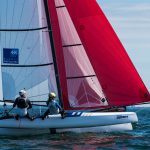 “We now have some support from Norway Sailing Federation, and the coach they provided is really helping our game out.” Martinsen also said that their winter training camp with a number of other teams in Cagliari, Sardinia helped their game as well. 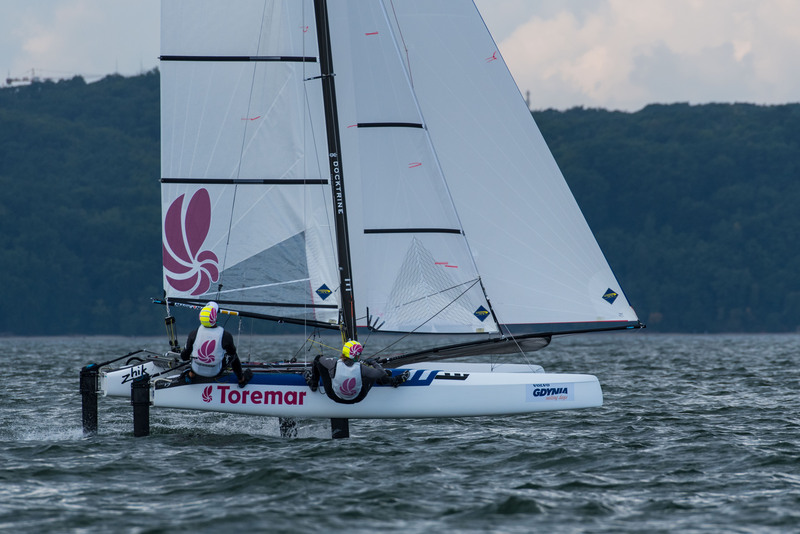 “Winter was lots of racing, lots of boathandling, lots of starts, and lots of fun,” said Martinsen. 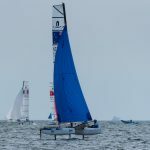 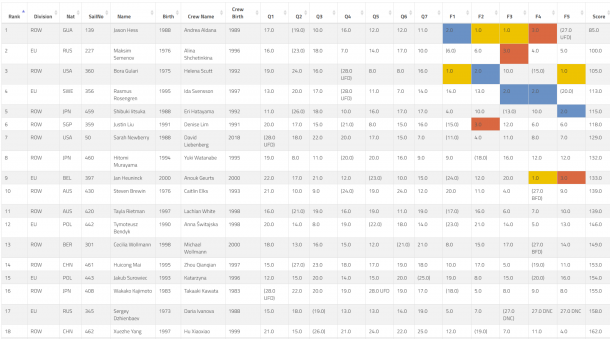 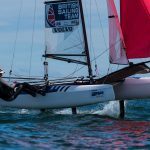 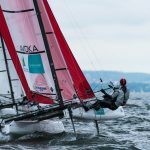 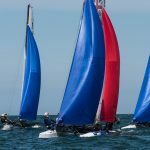 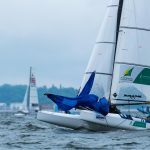 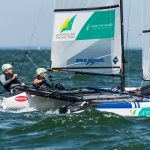 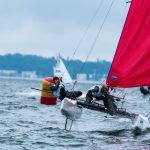 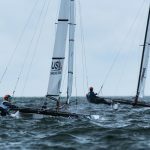 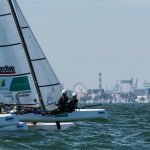 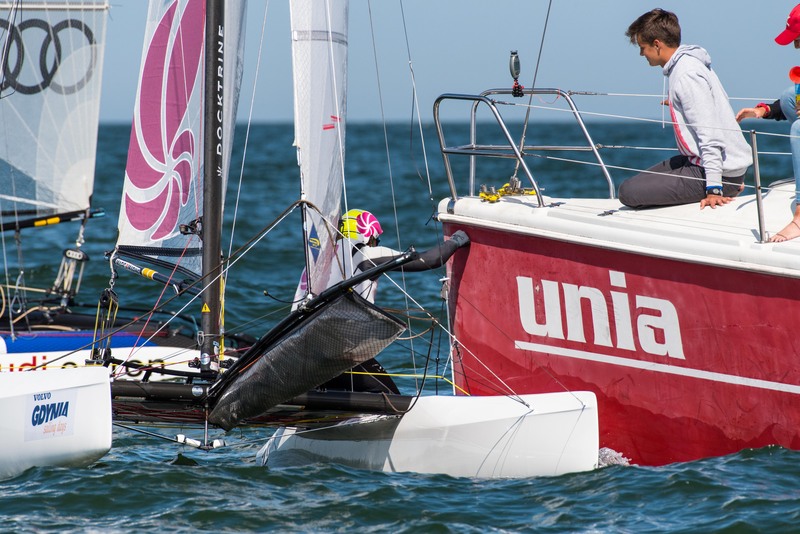 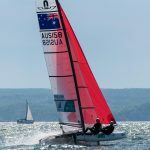 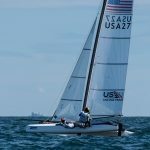 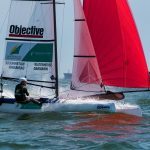 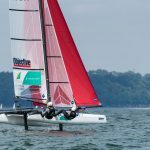 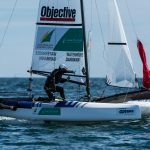 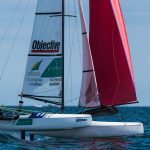 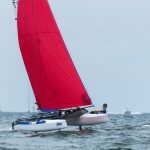 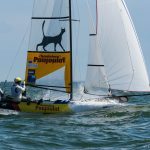 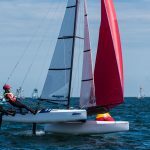 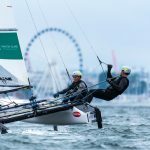 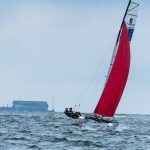 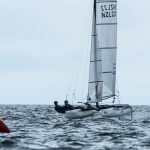 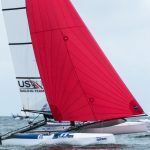 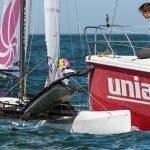 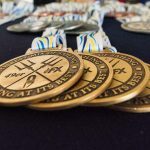 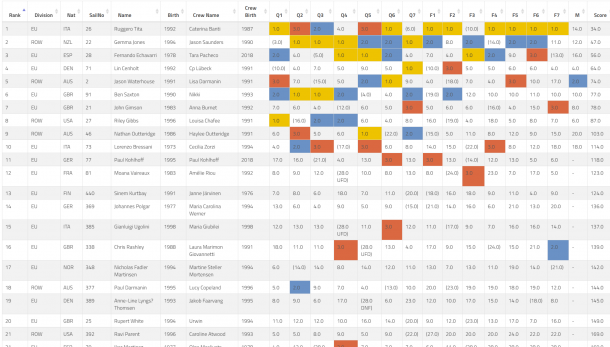 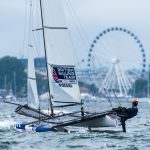 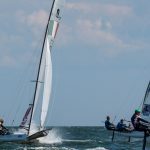 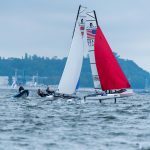 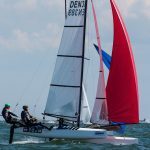 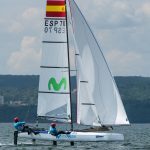 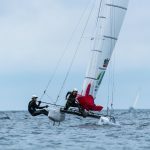 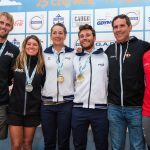 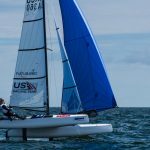 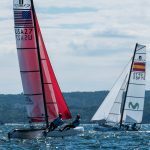 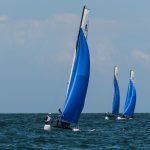 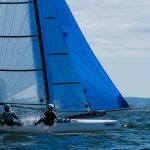 Those 22 disqualifications effected teams throughout the 49er fleet, knocking a number of teams well back into the standings, with several falling below the 25th position and out of Gold Fleet when the finals begin tomorrow. 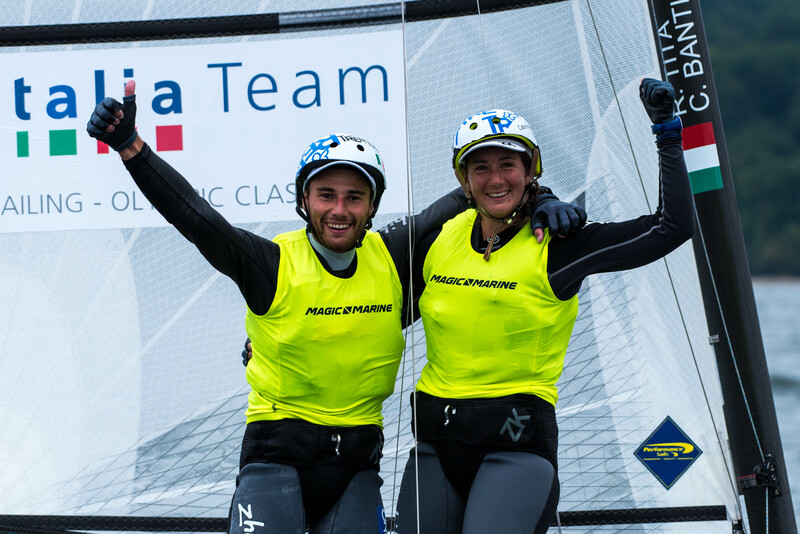 Top French duo Fischer/Jauvin were pushed back to 27th place, while last year’s 4th place finisher at Europeans – Plazzi/Tesei – fell all the way back to 30th at the end of the qualification round. 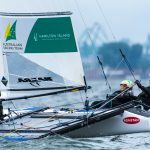 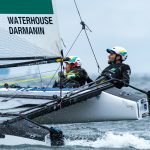 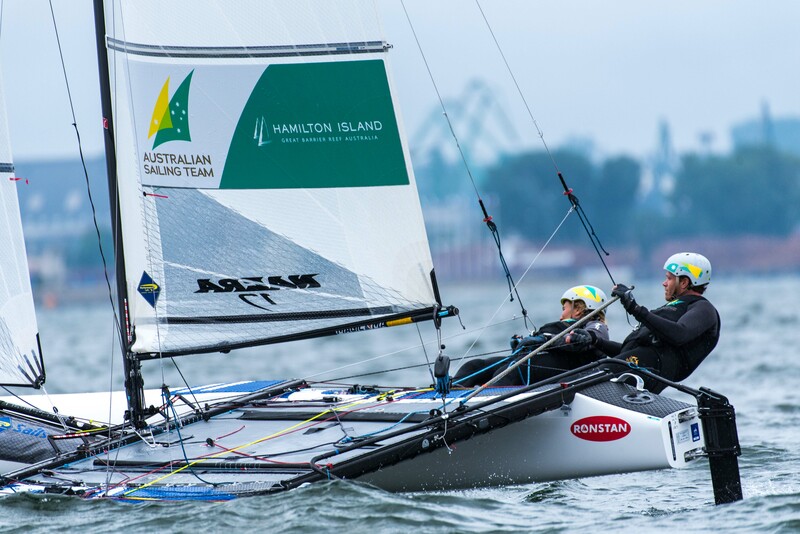 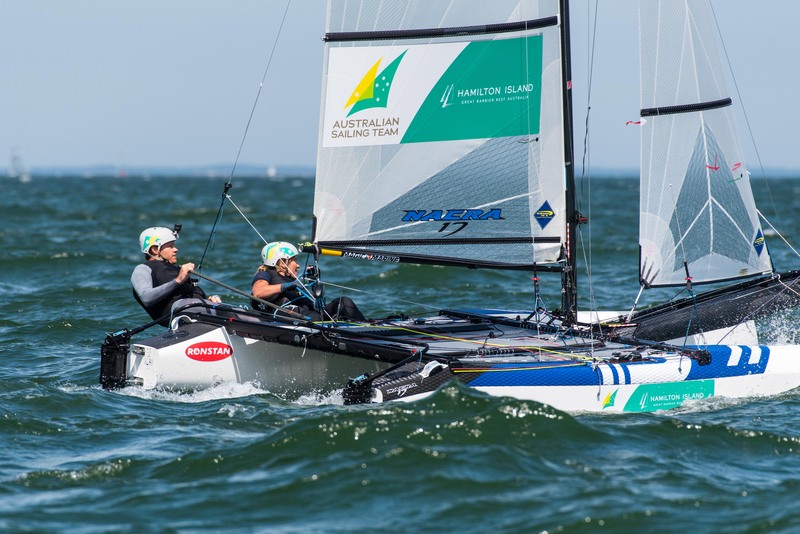 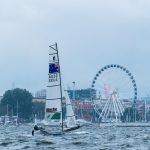 No one fell harder than Lachy Gilmour and Ryan Donaldson though – the young Aussies were sailing a blinder, holding onto 16th place until this morning’s gun. 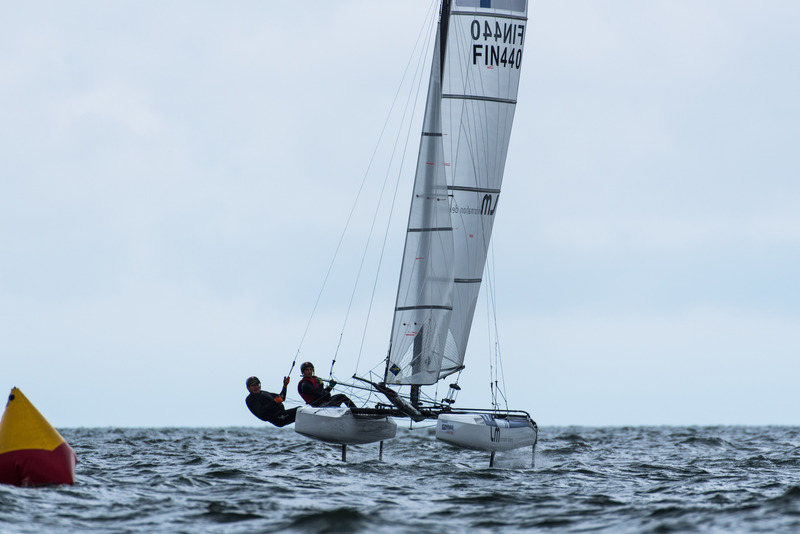 After sailing a 32 (BFD), 32 (UFD), 11.0 score, they dropped all the way to 32nd, well out of gold fleet. 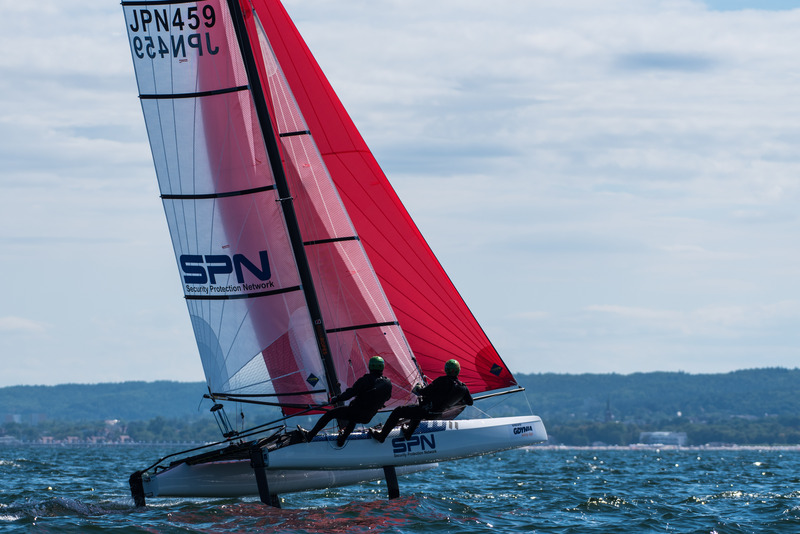 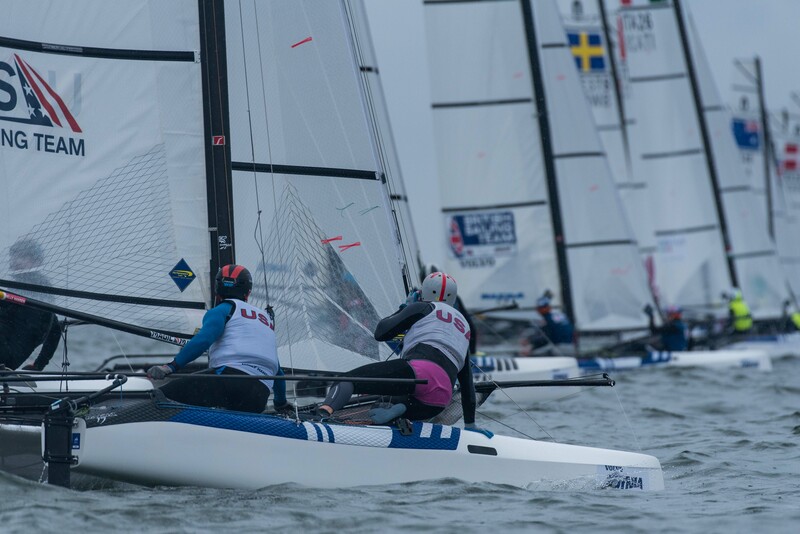 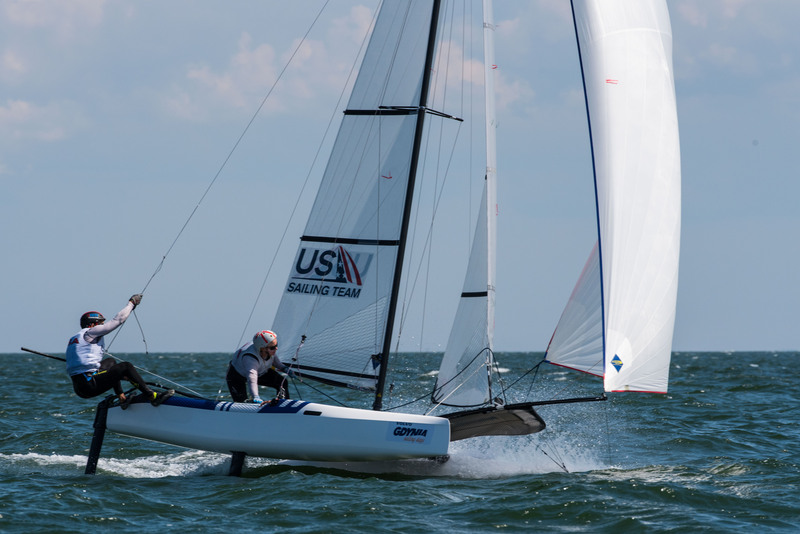 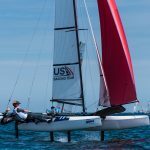 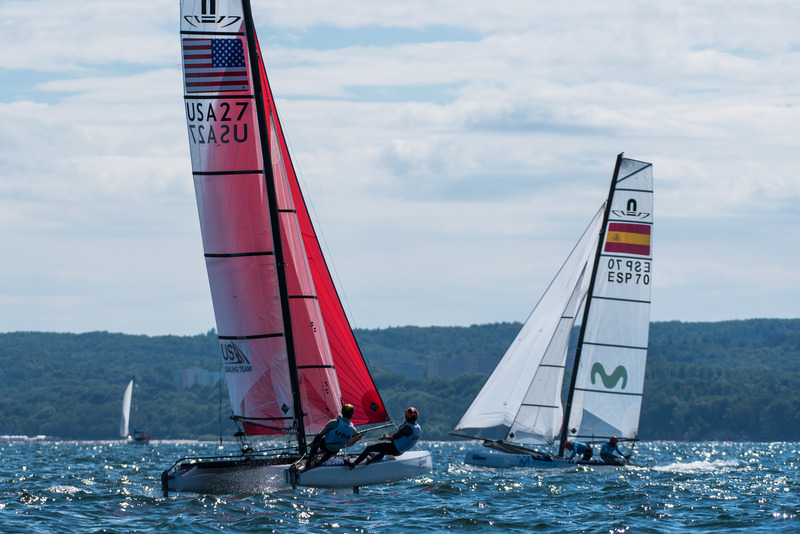 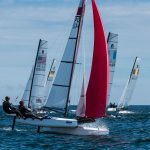 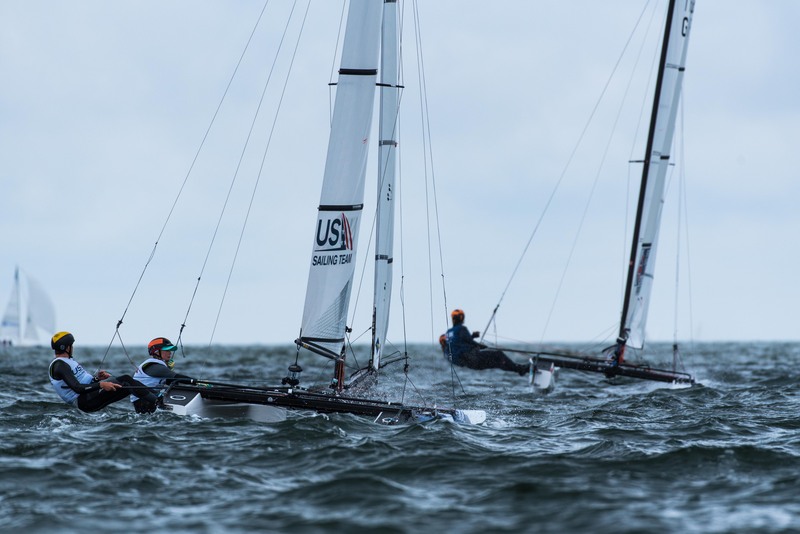 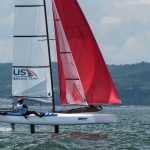 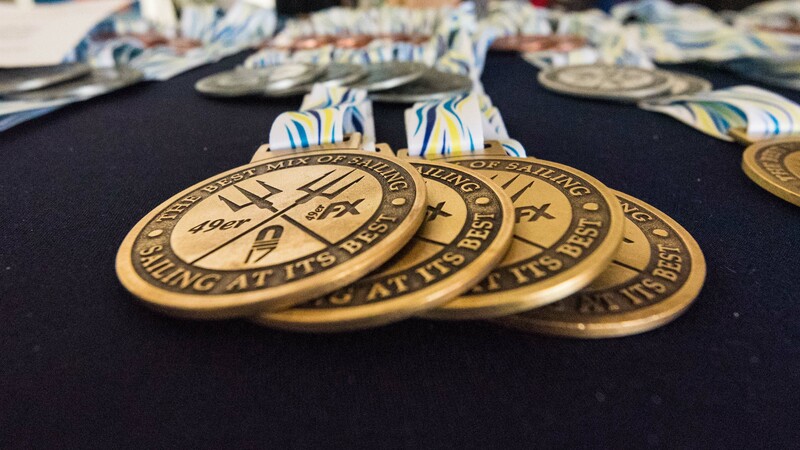 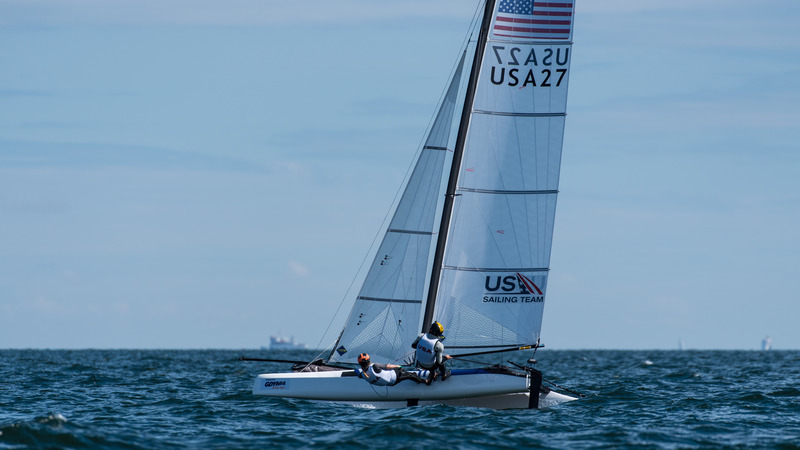 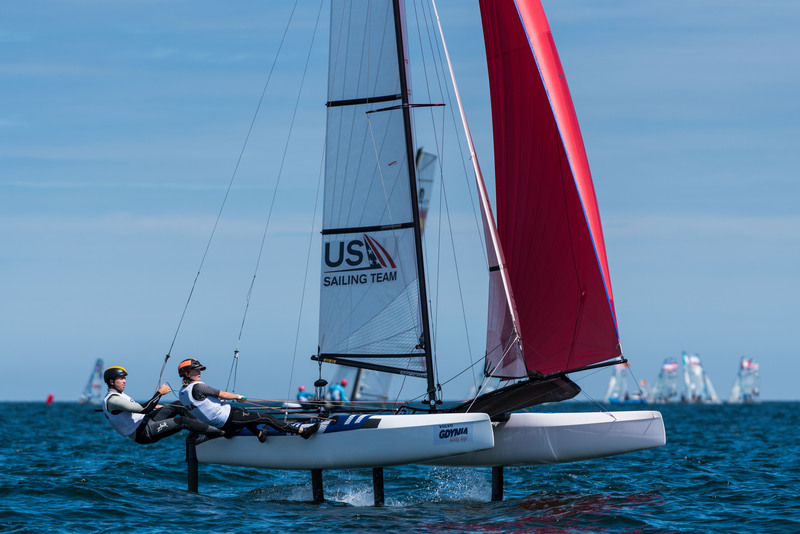 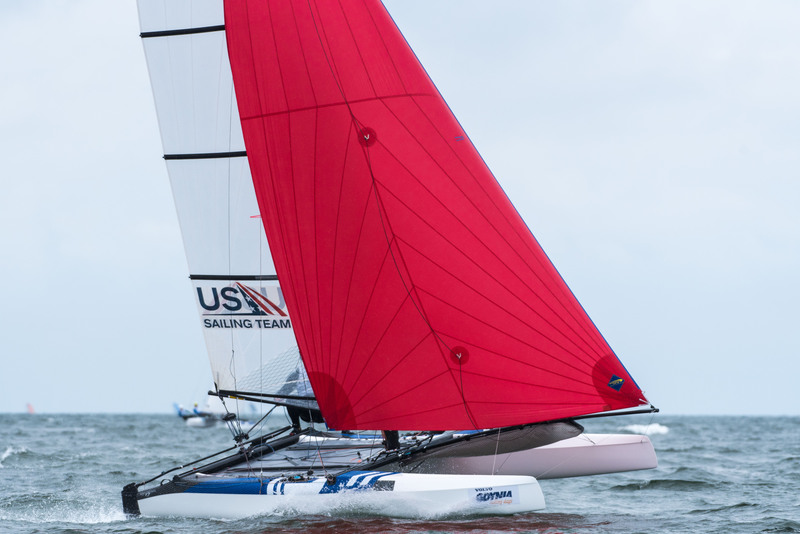 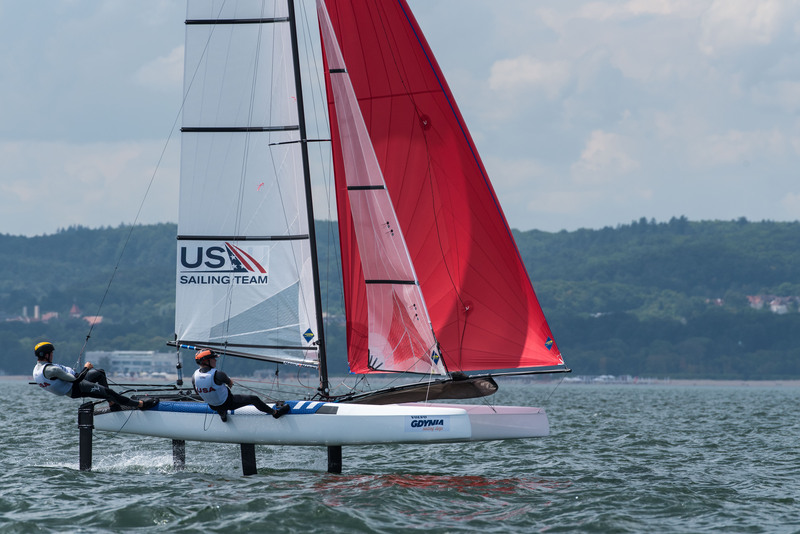 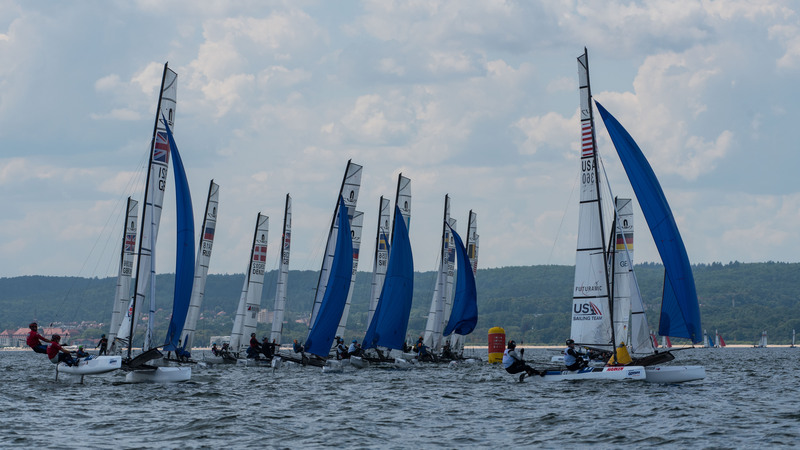 The Top 25 teams in 49er and FX split off today to sail in Gold Fleet tomorrow, while 27 Nacra 17s will do the same. 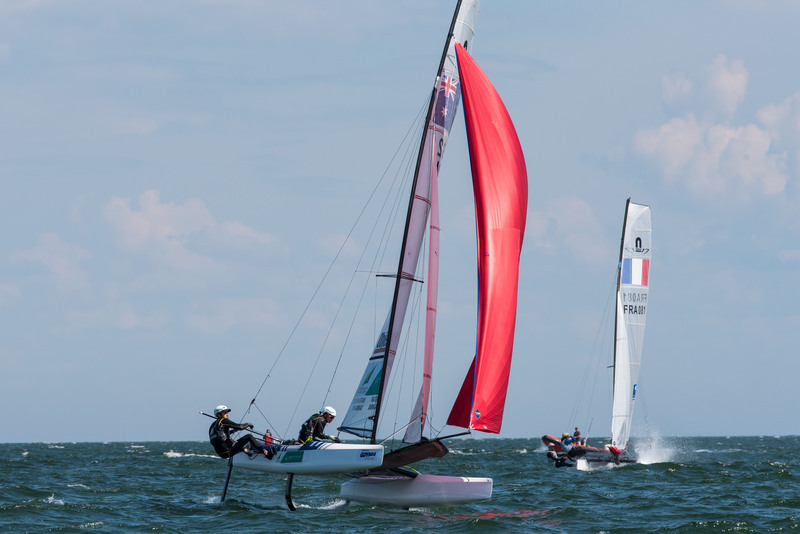 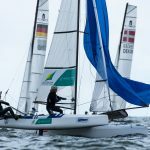 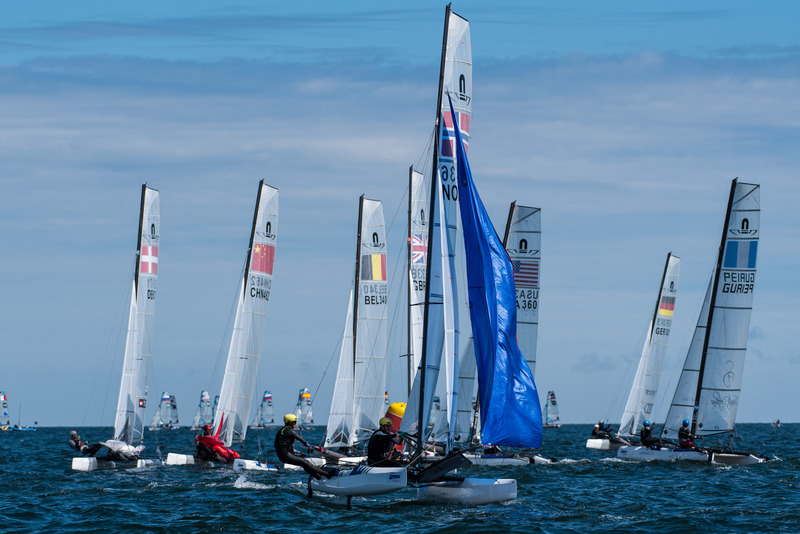 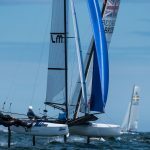 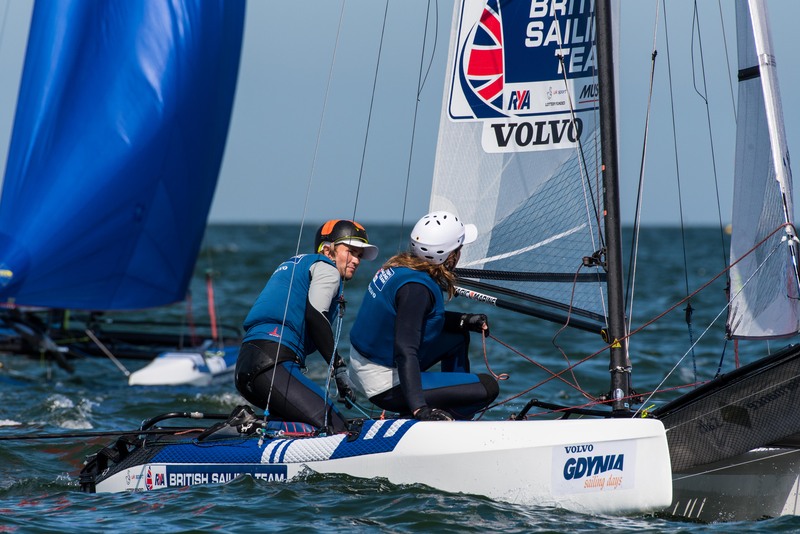 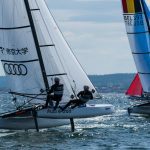 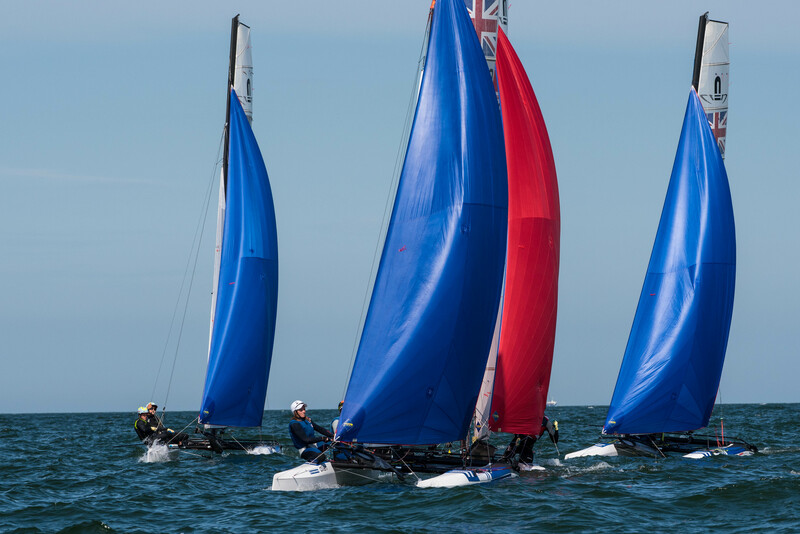 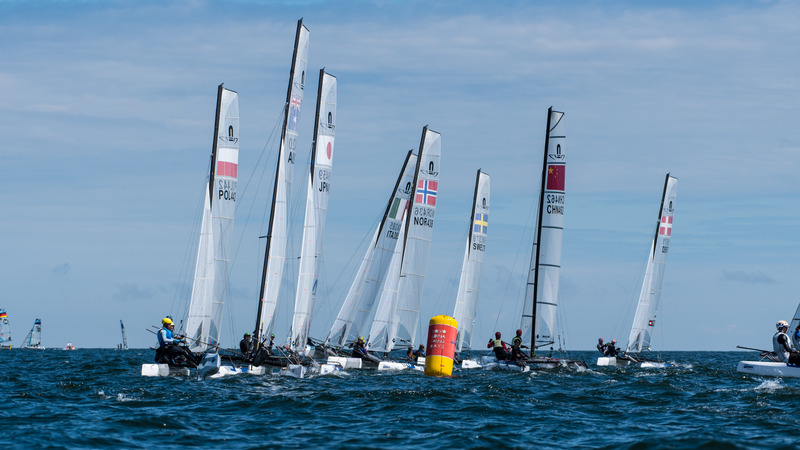 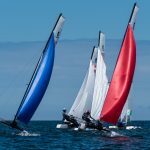 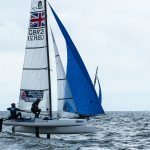 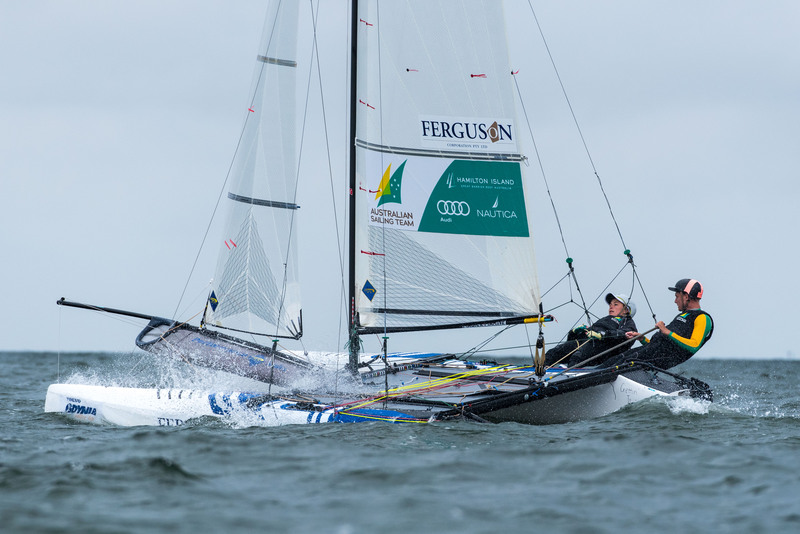 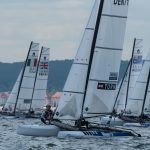 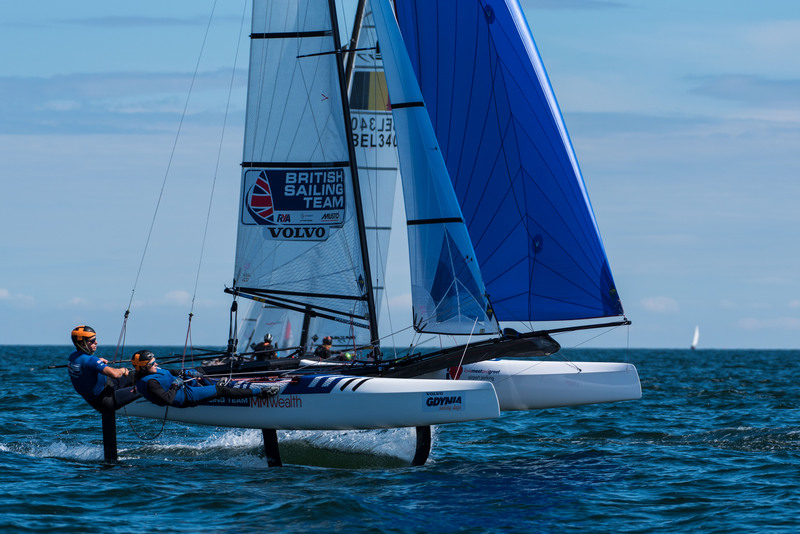 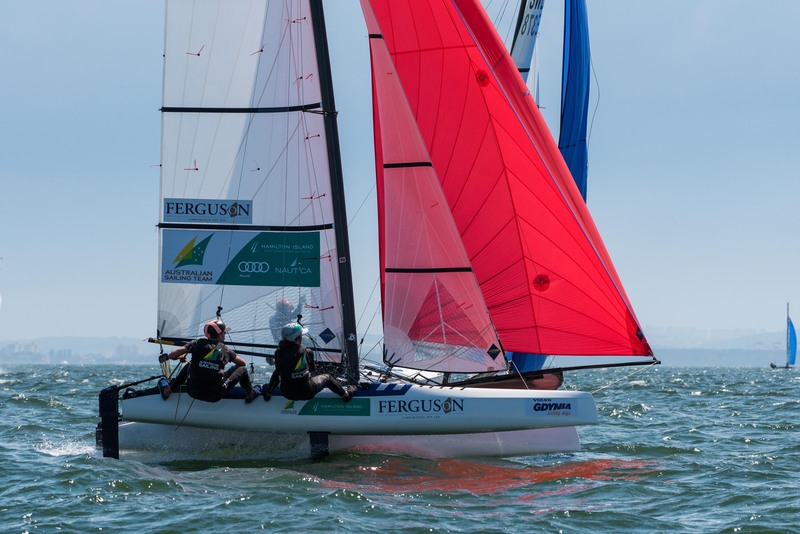 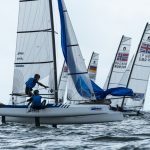 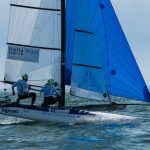 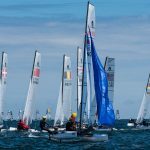 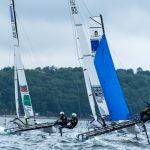 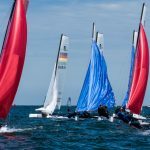 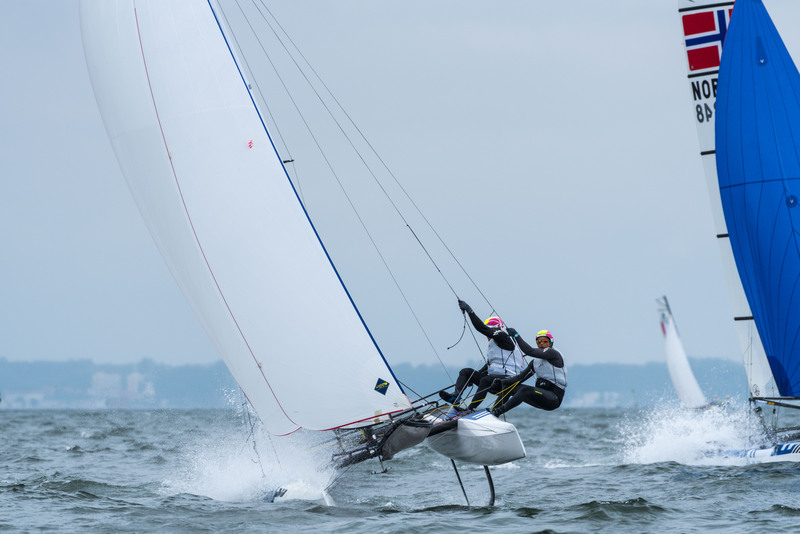 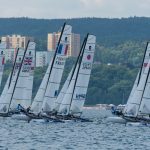 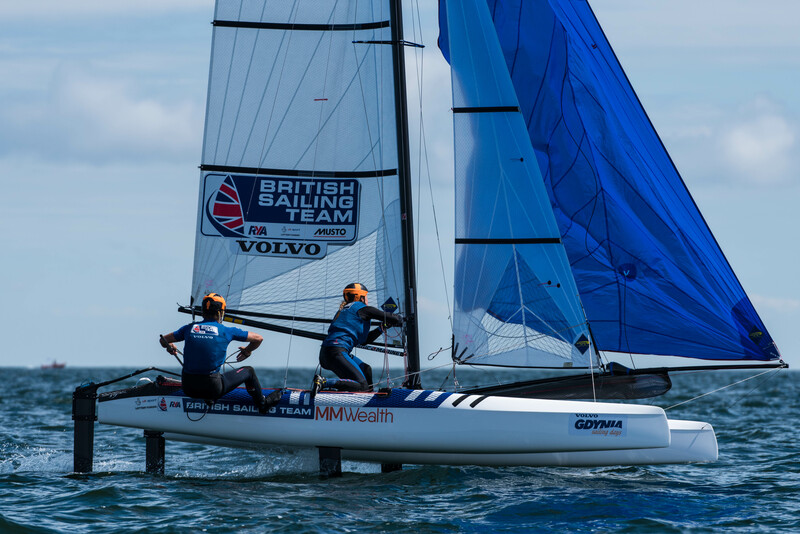 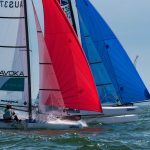 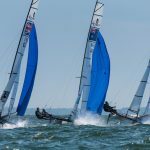 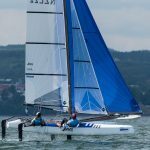 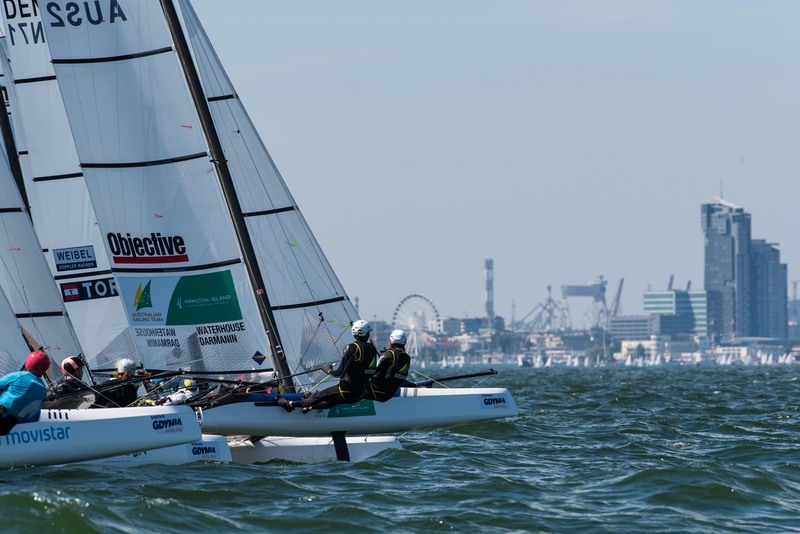 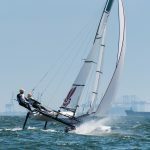 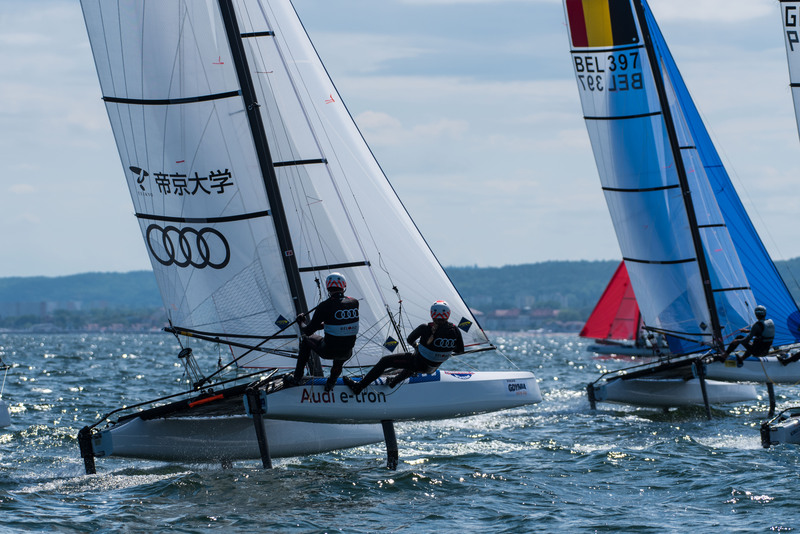 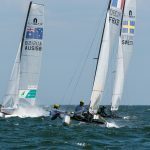 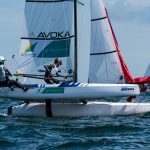 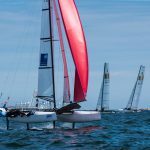 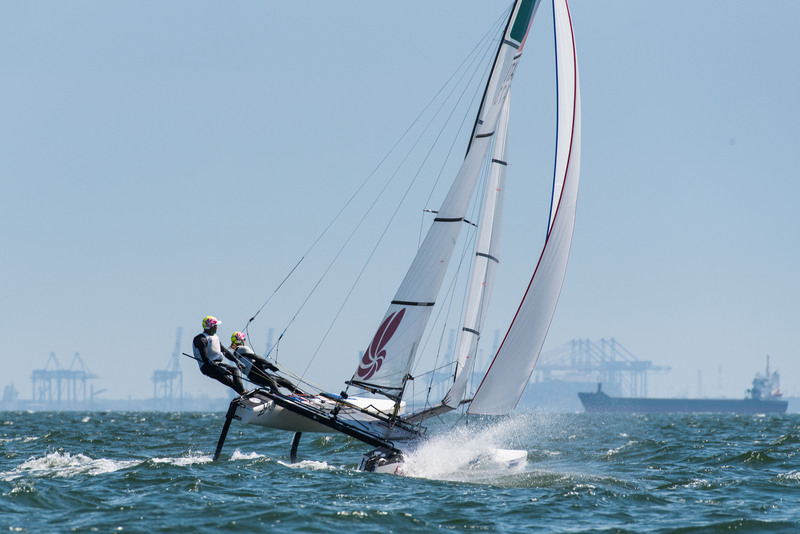 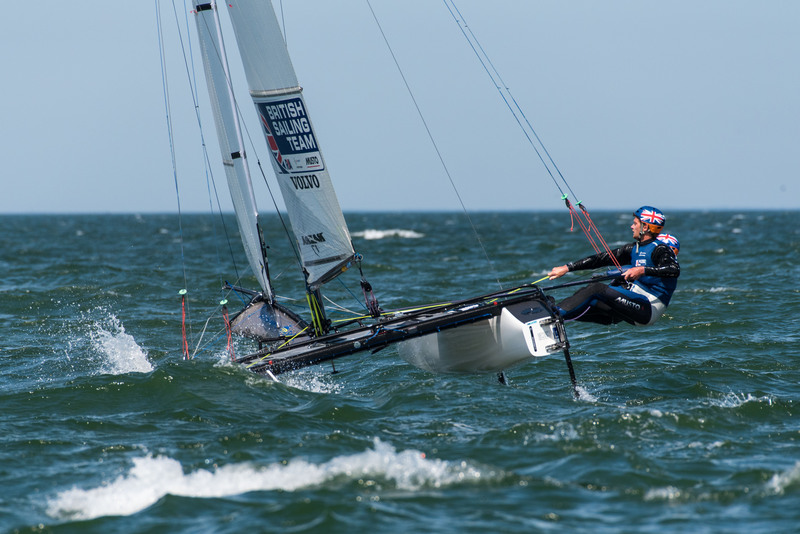 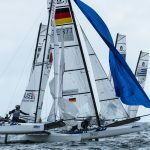 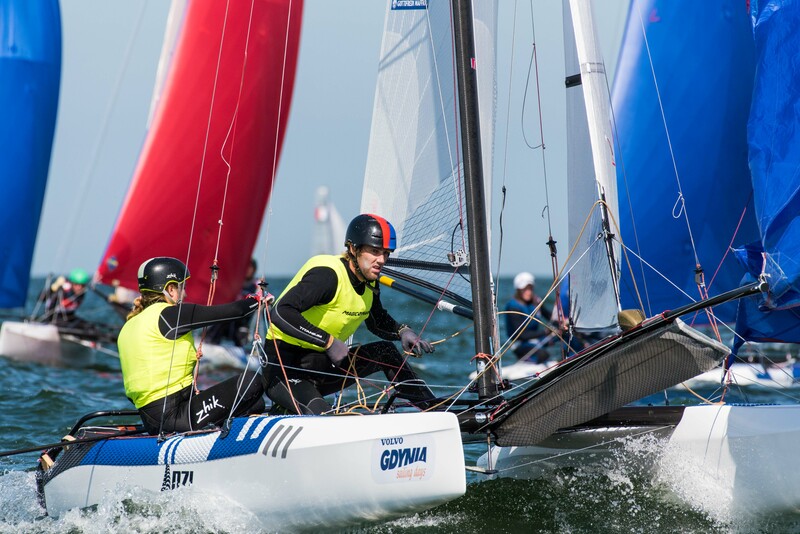 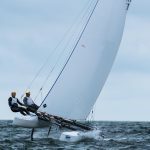 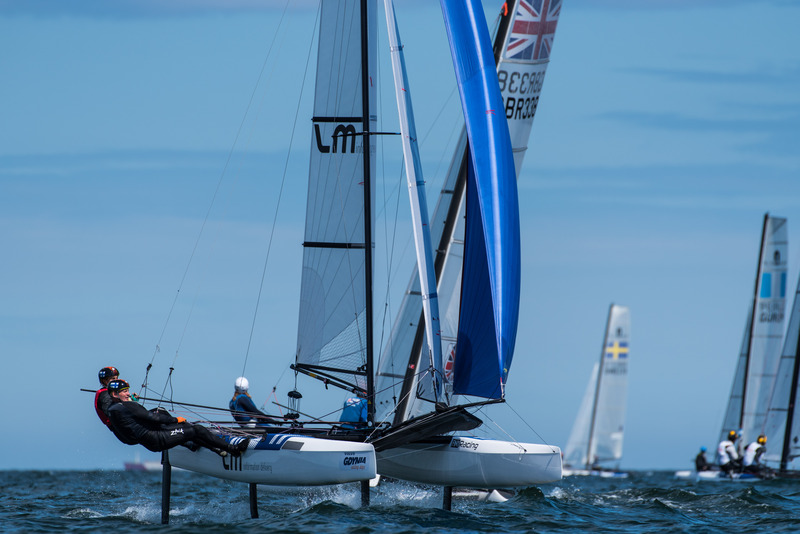 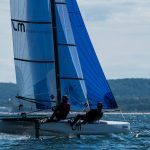 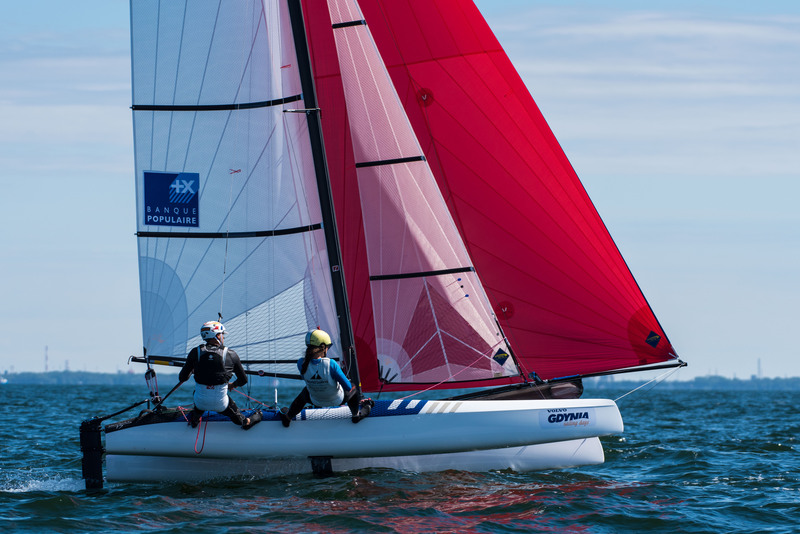 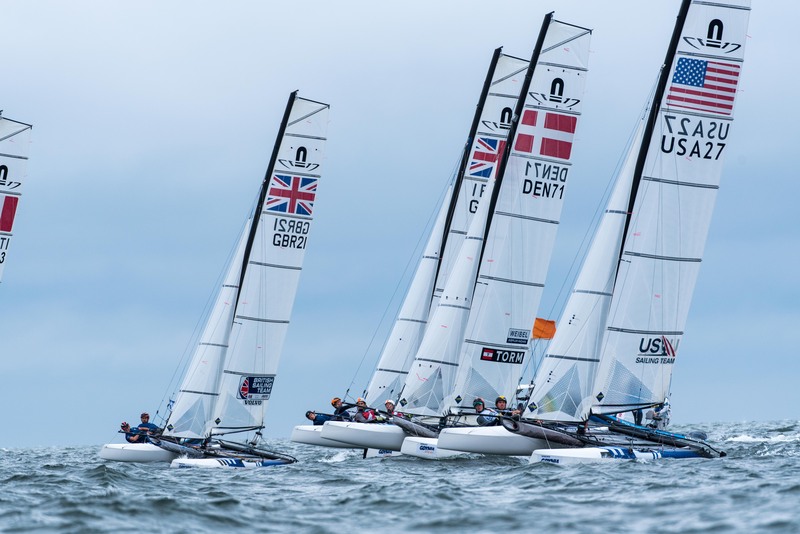 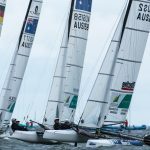 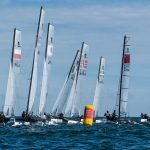 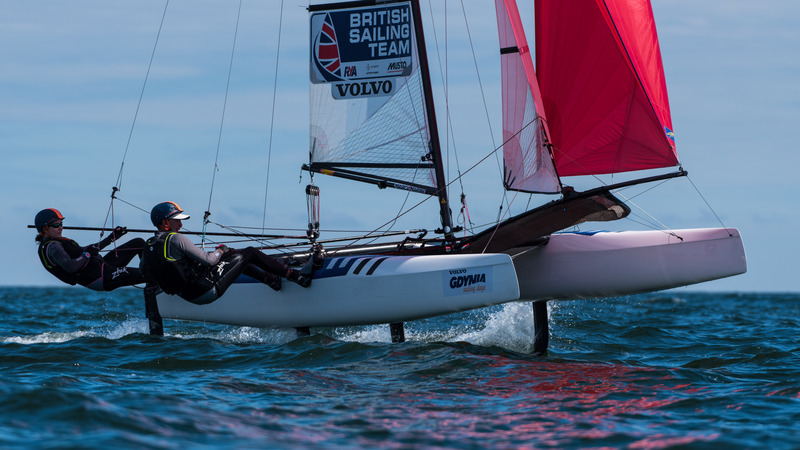 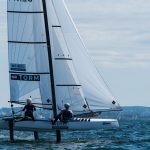 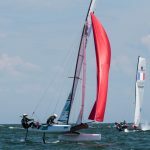 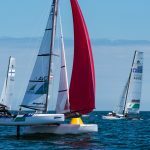 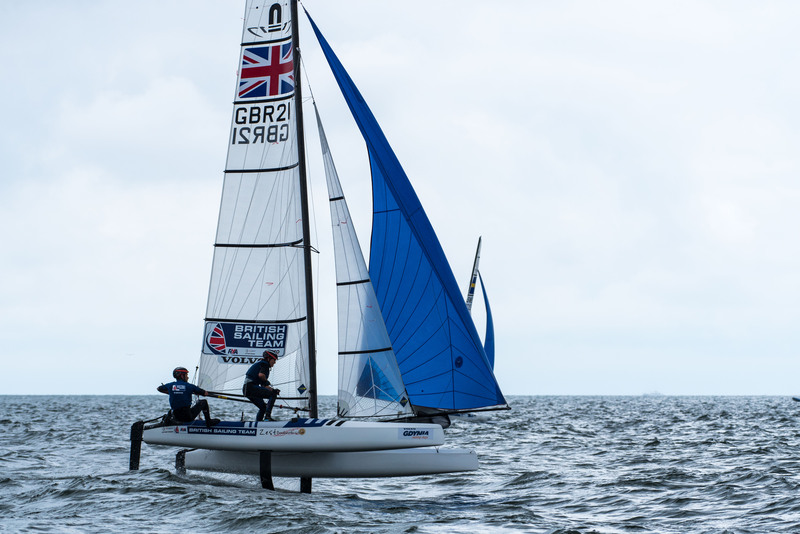 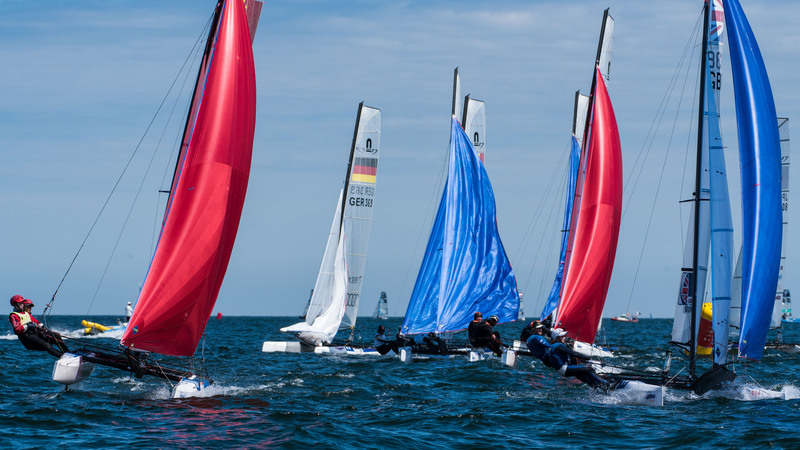 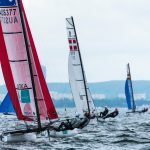 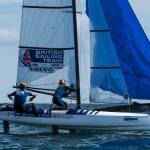 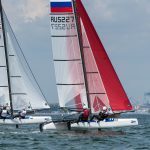 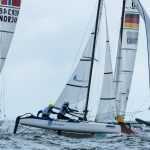 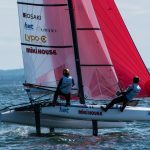 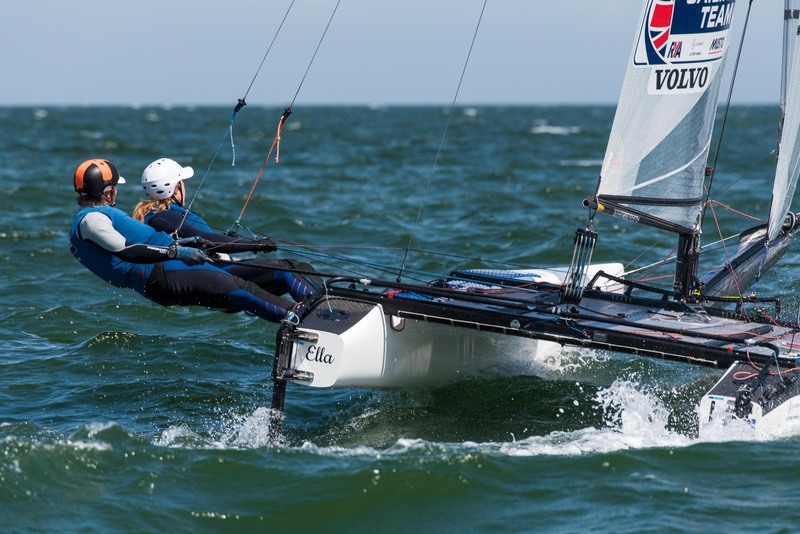 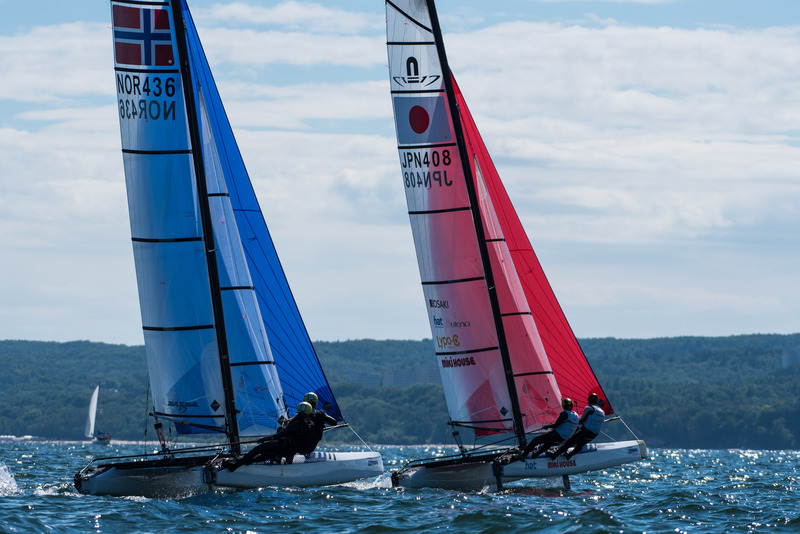 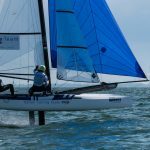 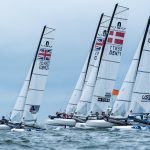 FX and Nacra scoring in the bottom half of the fleet move to Silver Fleet, while the bottom 64 teams in the 49er will split into Silver and Bronze fleets.